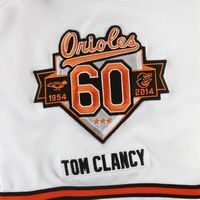 The "O" style on the script changes. 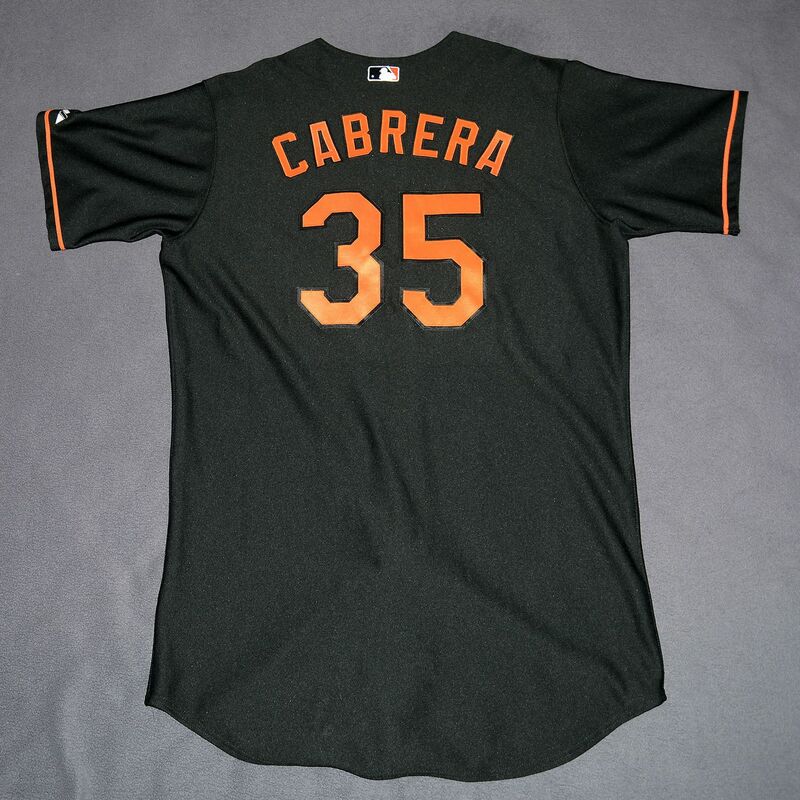 Lettering colors are flipped - home goes to black with orange trim, the road to orange with black and white trim. 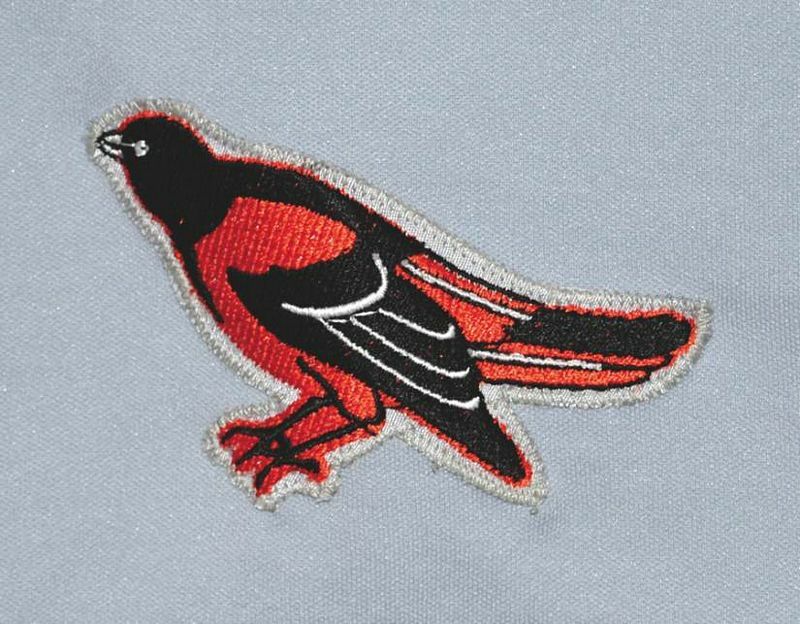 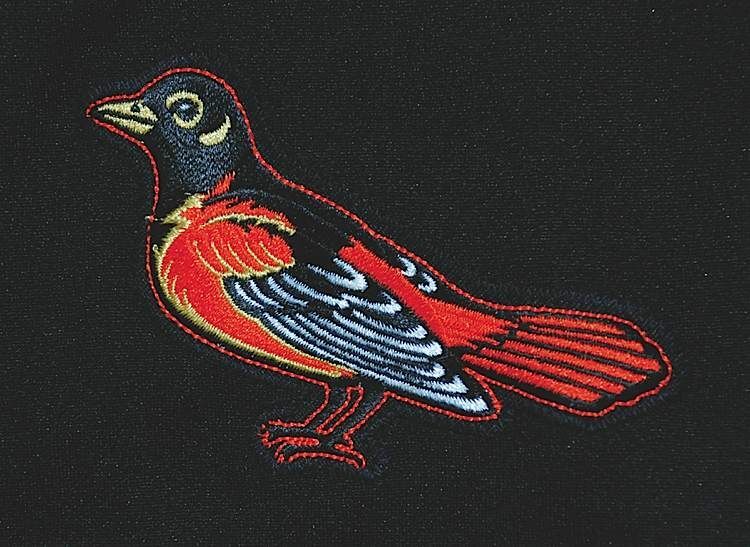 Bird sleeve patch added to jerseys. Road jersey is worn with the grey cap for 3 games, then the black cap. 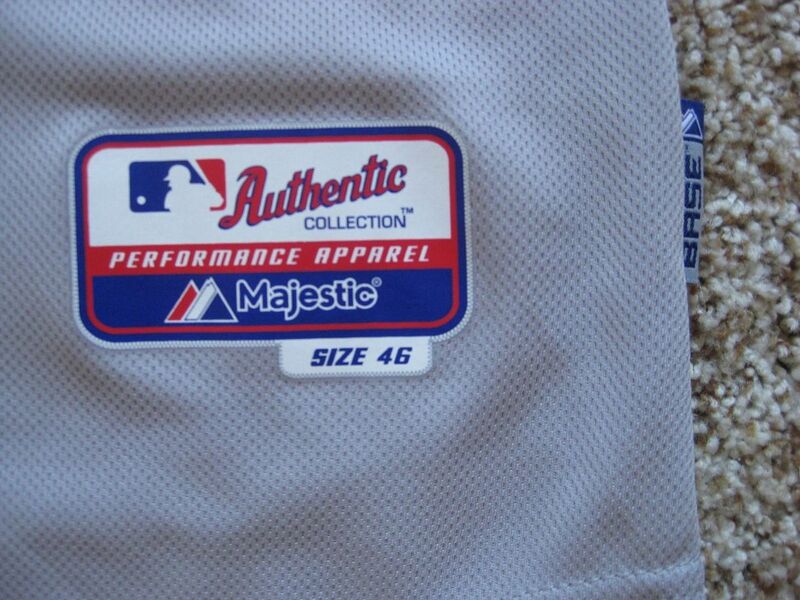 Ah, the 1995-2000 alternate jerseys! 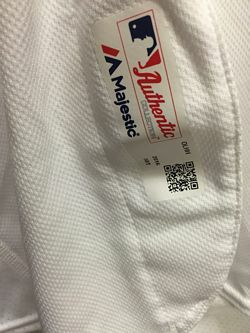 Follow along carefully! 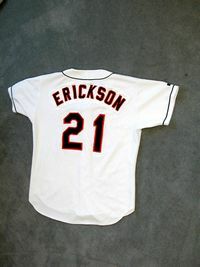 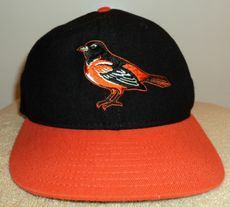 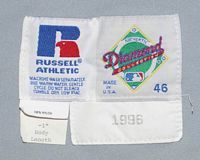 This is the 1995 alternate, worn with a new alternate cap. 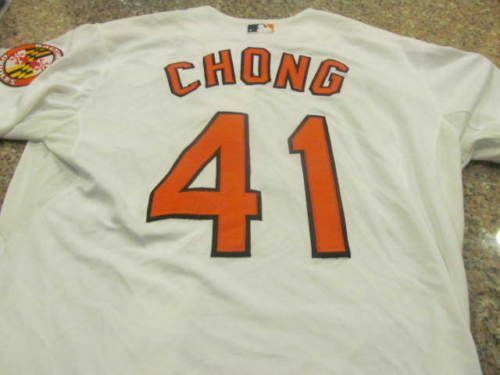 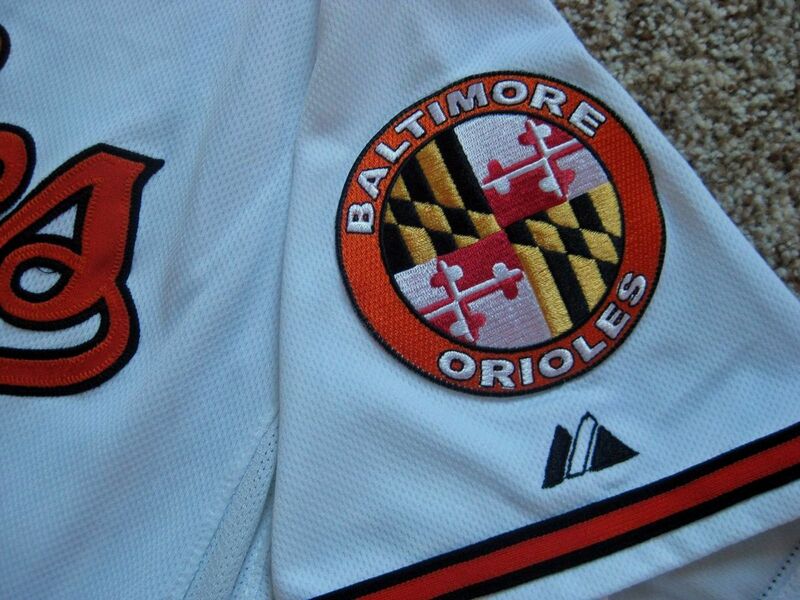 The O's change their minds on the alternate jersey right before the start of the season. 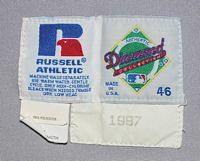 The front piping is removed. Here's the actual 1996 alternate. 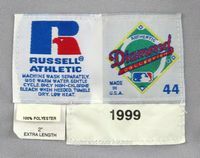 This one is from the 1995 set, with the front piping removed for use in 1996. Now let's look at the jersey that was NOT used. 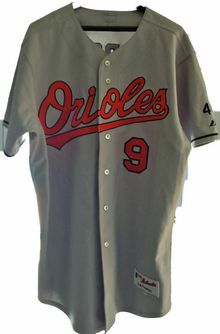 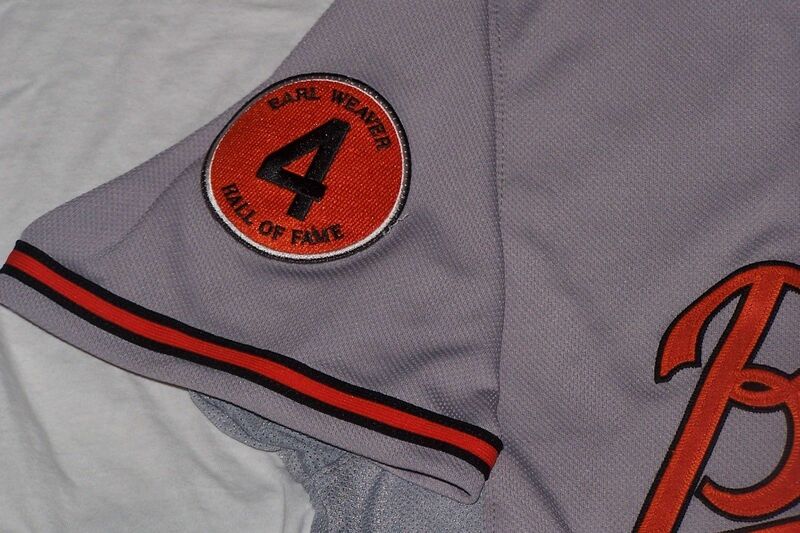 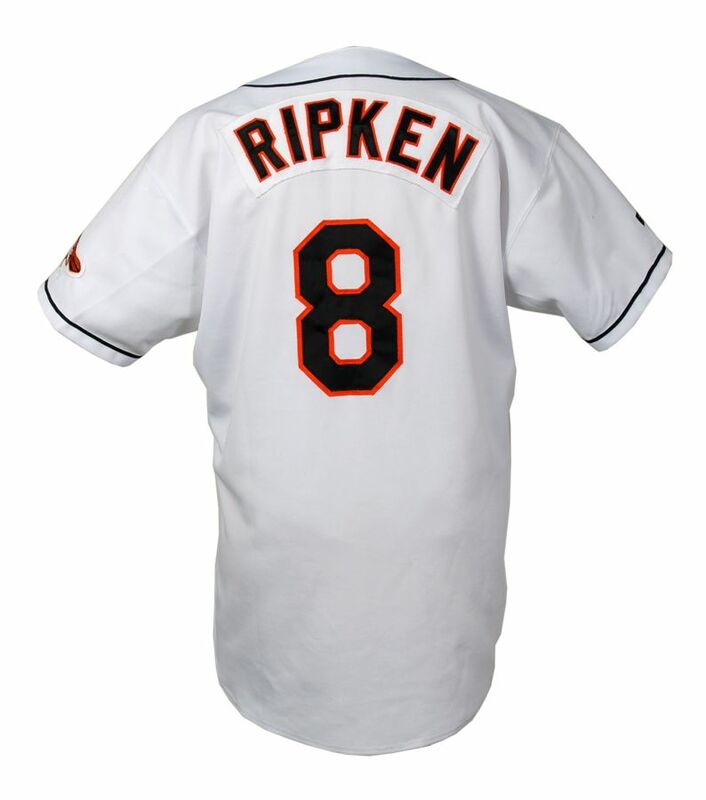 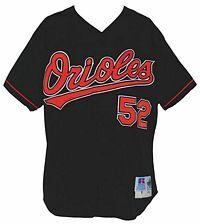 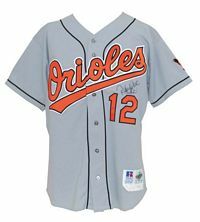 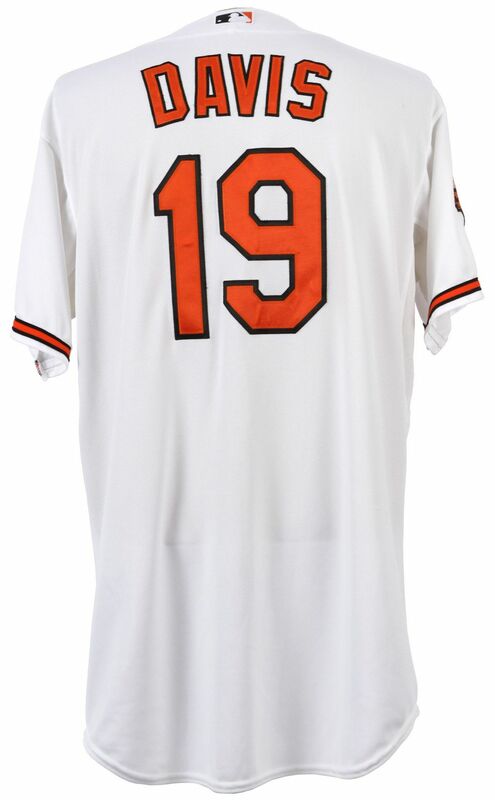 In 1996, the O's dropped front orange piping from the alternate jerseys at the last minute. 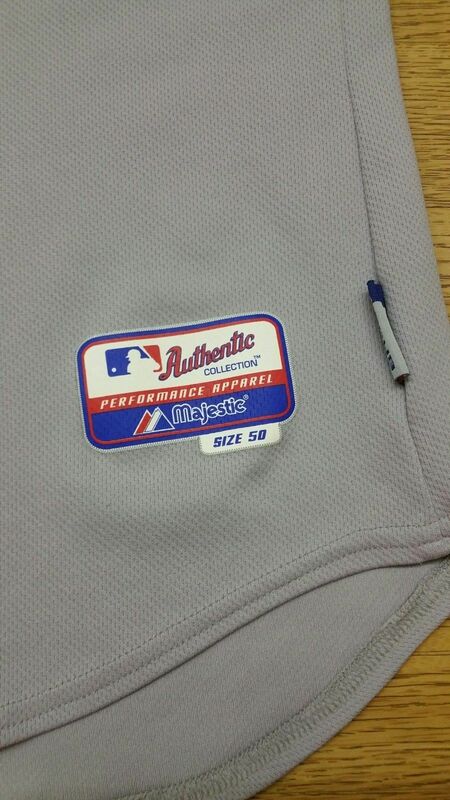 But team sets and retail shirts with piping were already made, and hit the market. 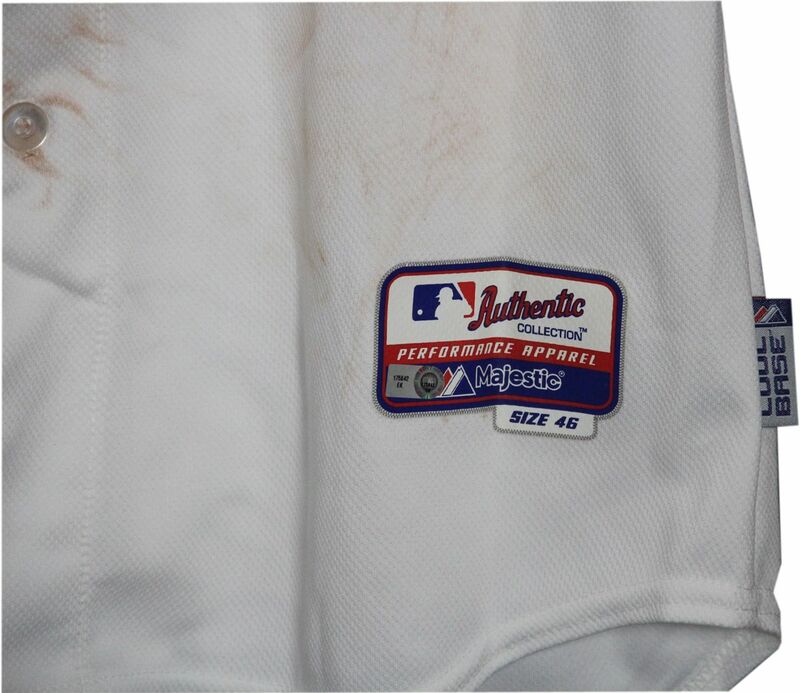 So this team tagged jersey is team issued but was never worn on field. 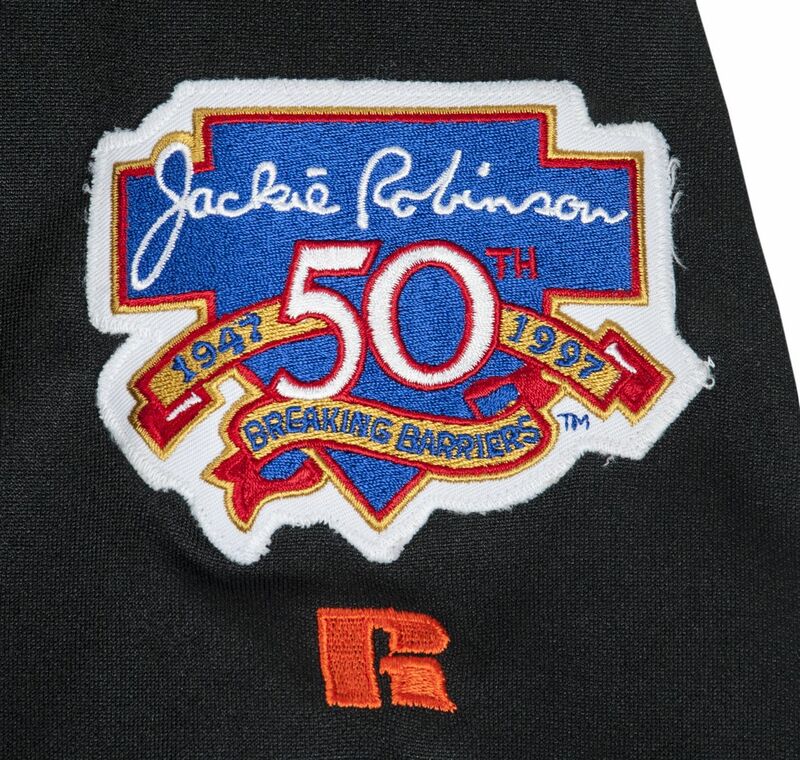 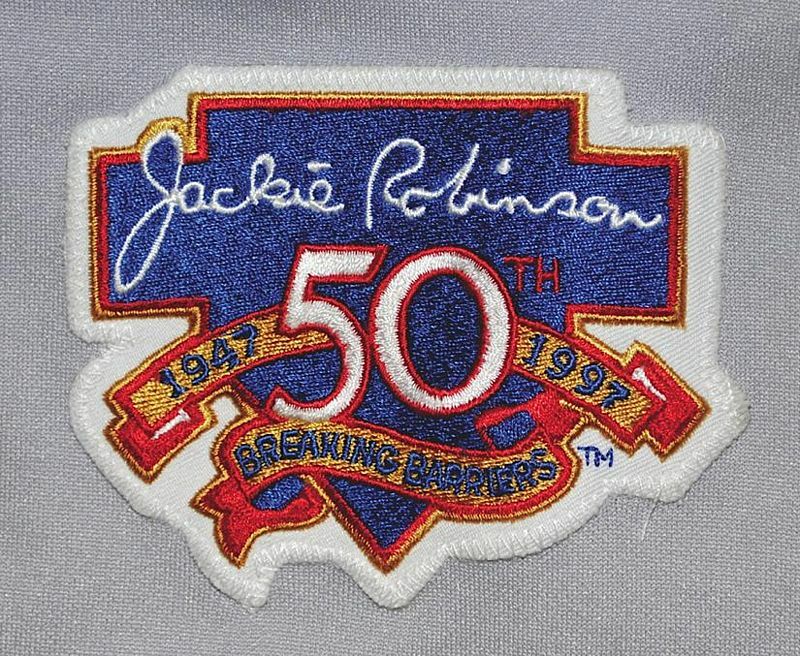 Jackie Robinson patch and Baltimore 200th anniversary patch worn in 1997. 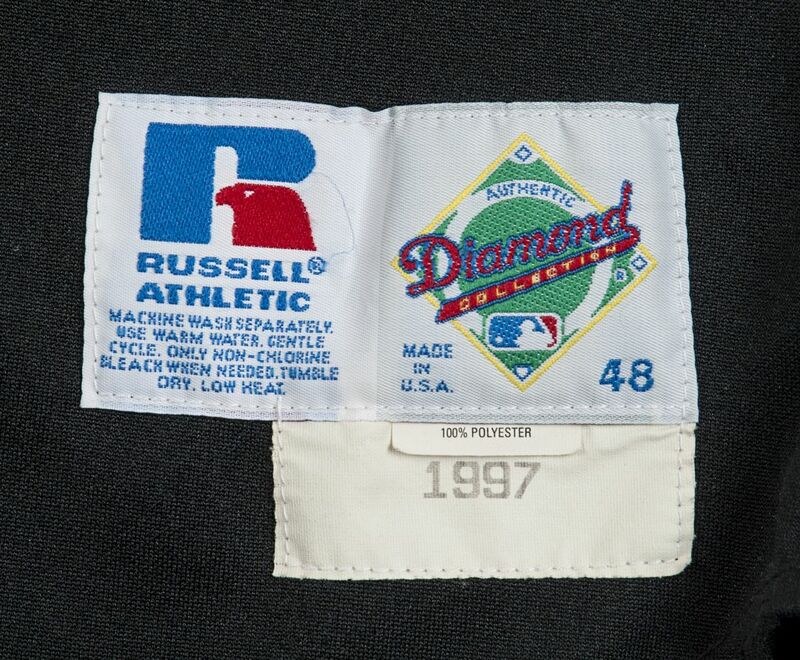 1997 alternates are the same as 1996. The script becomes a bit thinner and now has "loops" on the small "o" and "s". 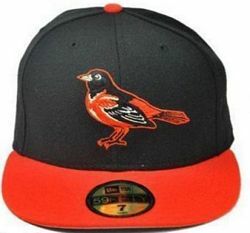 The bird gets a lot meaner looking. 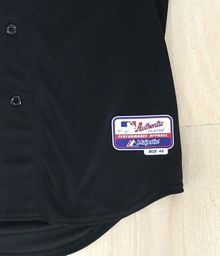 Probably because the regular alternates weren't ready in time, the team adds sleeve piping to their mesh BP jerseys and uses them for a few games. 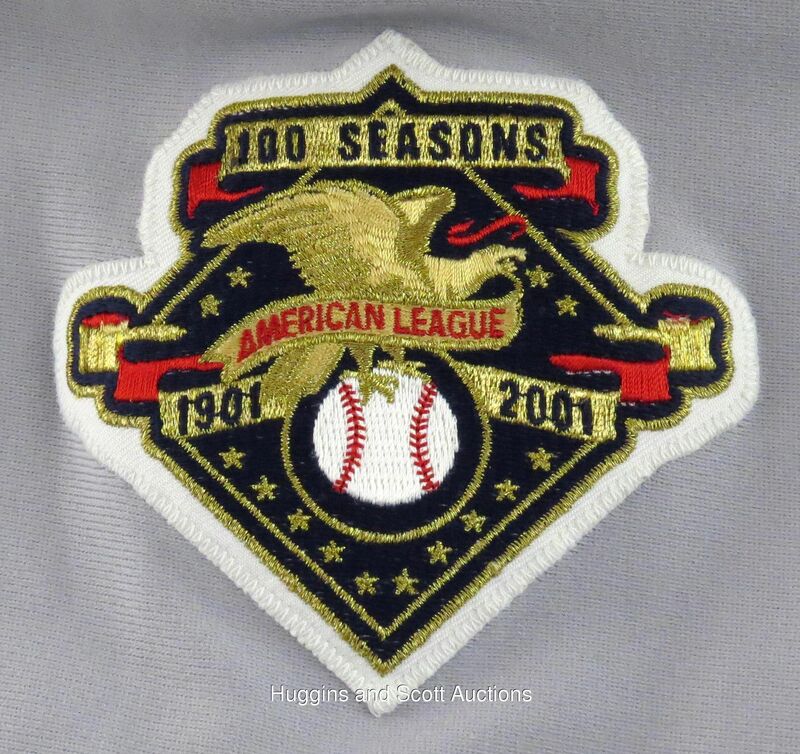 It has the 1997 script. 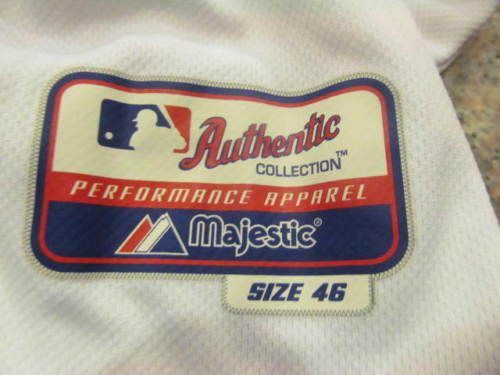 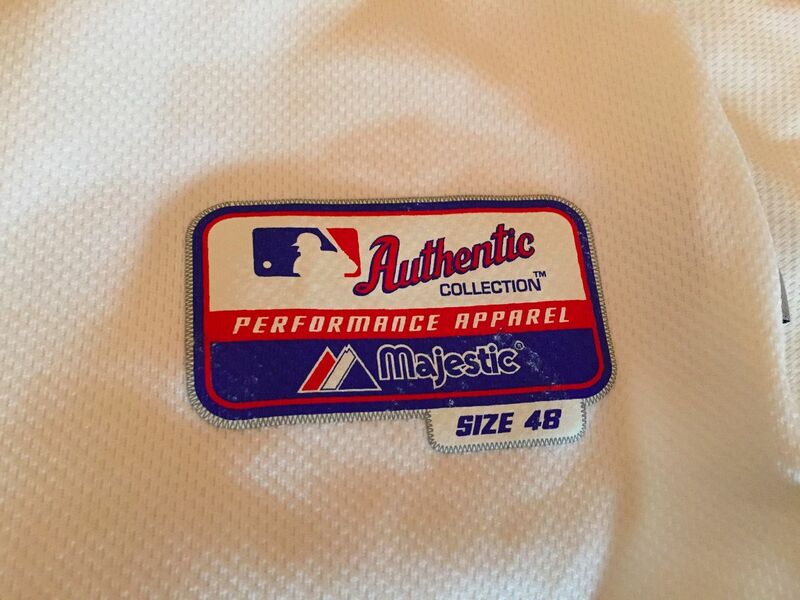 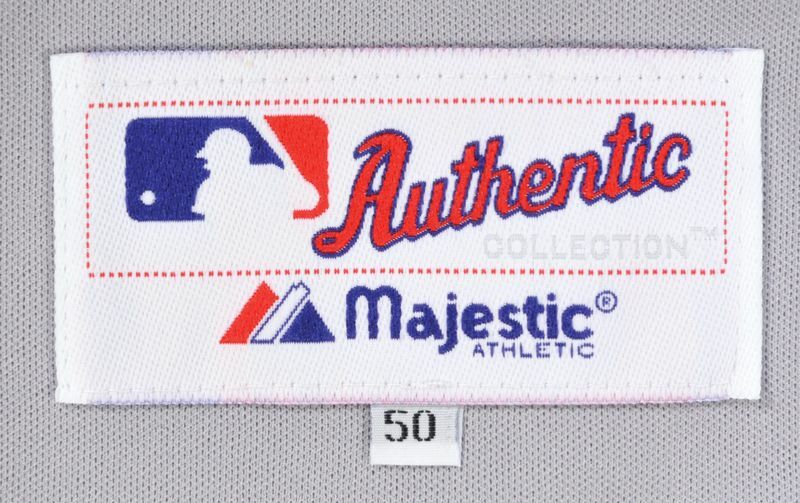 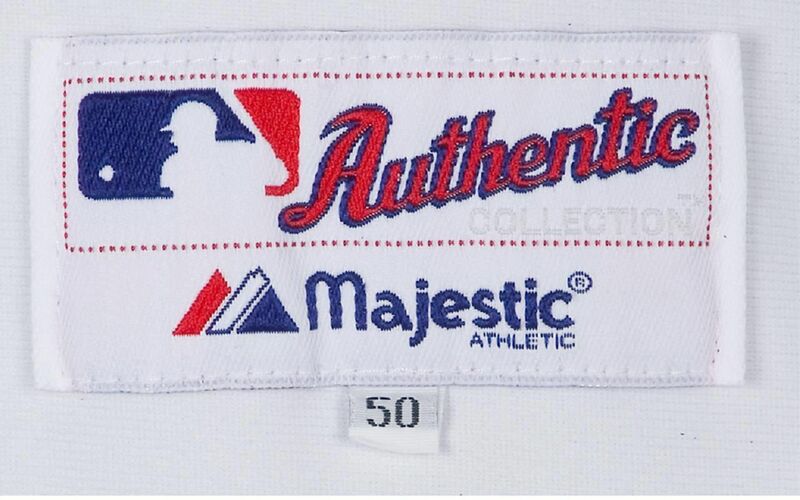 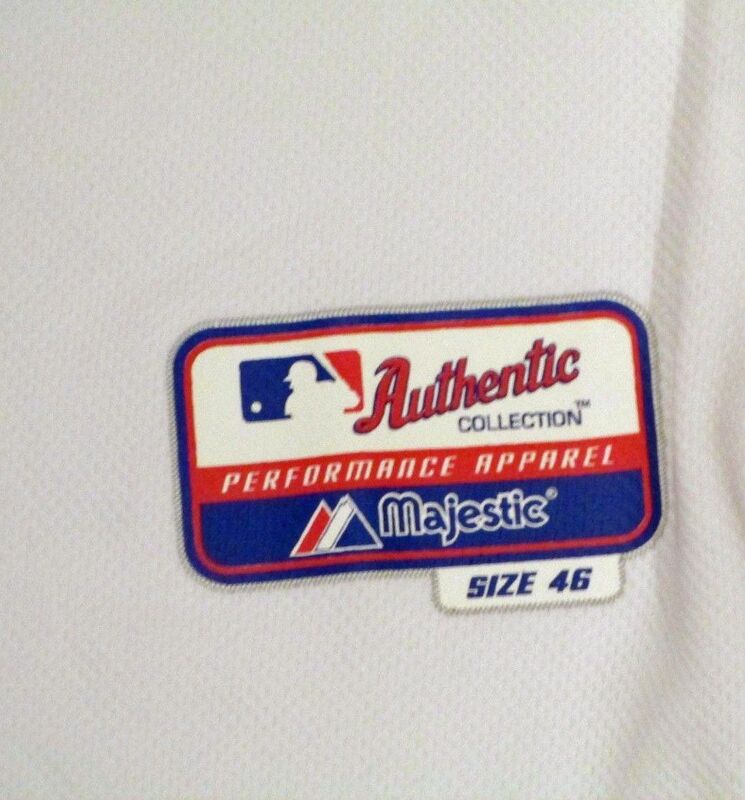 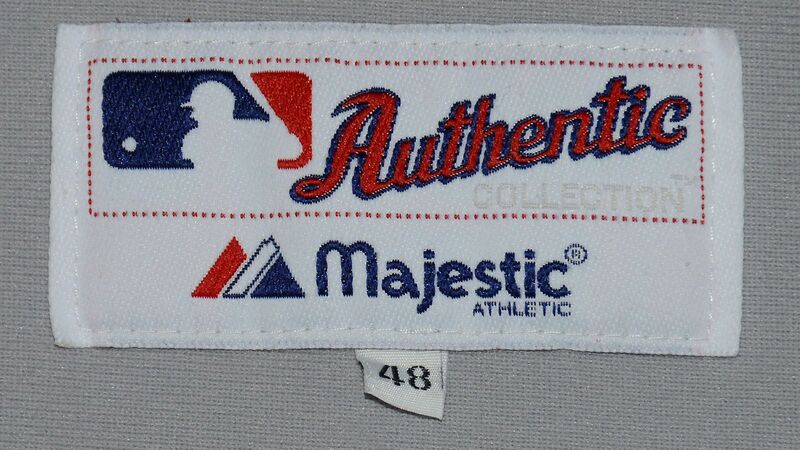 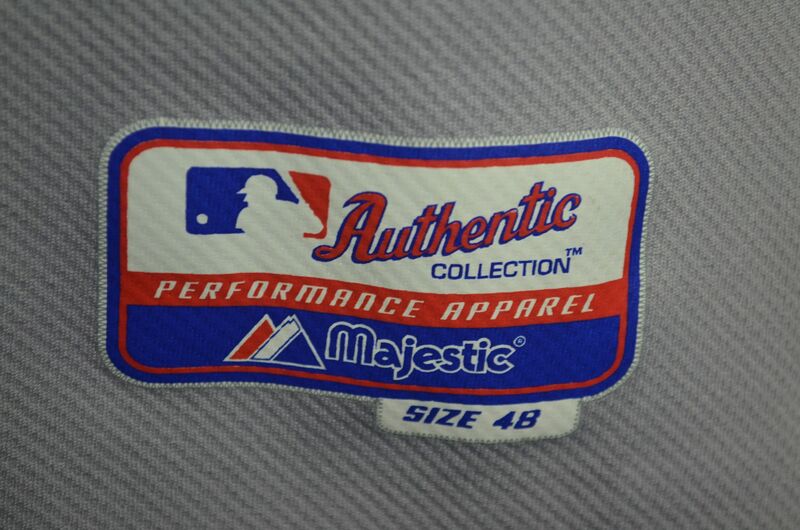 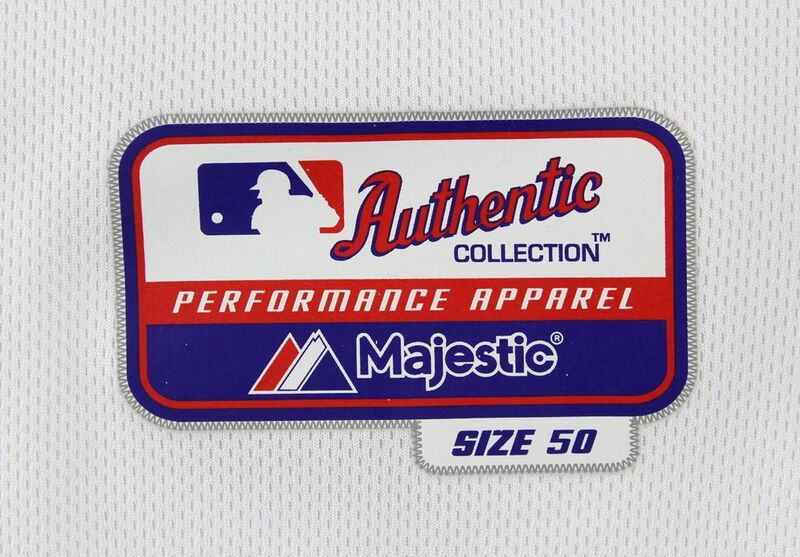 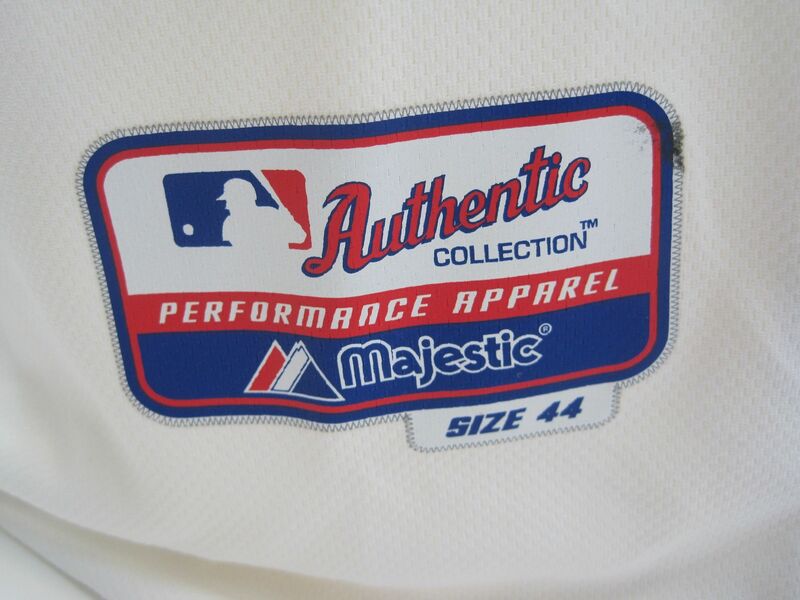 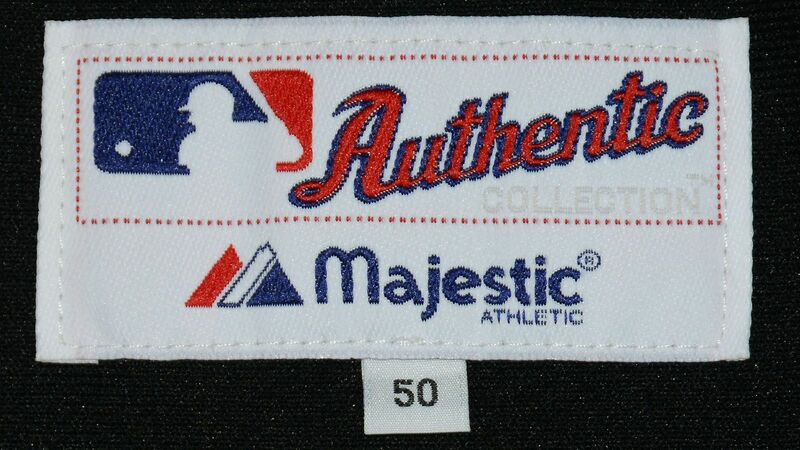 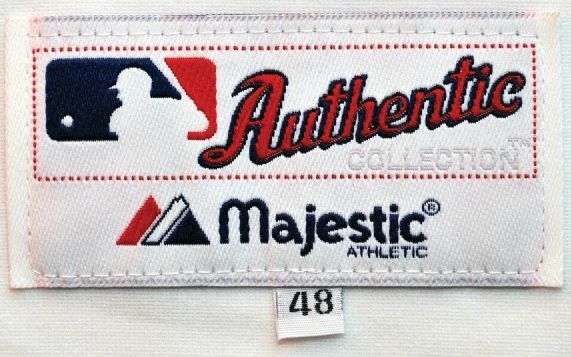 The Majestic sleeve logo had to be covered up. 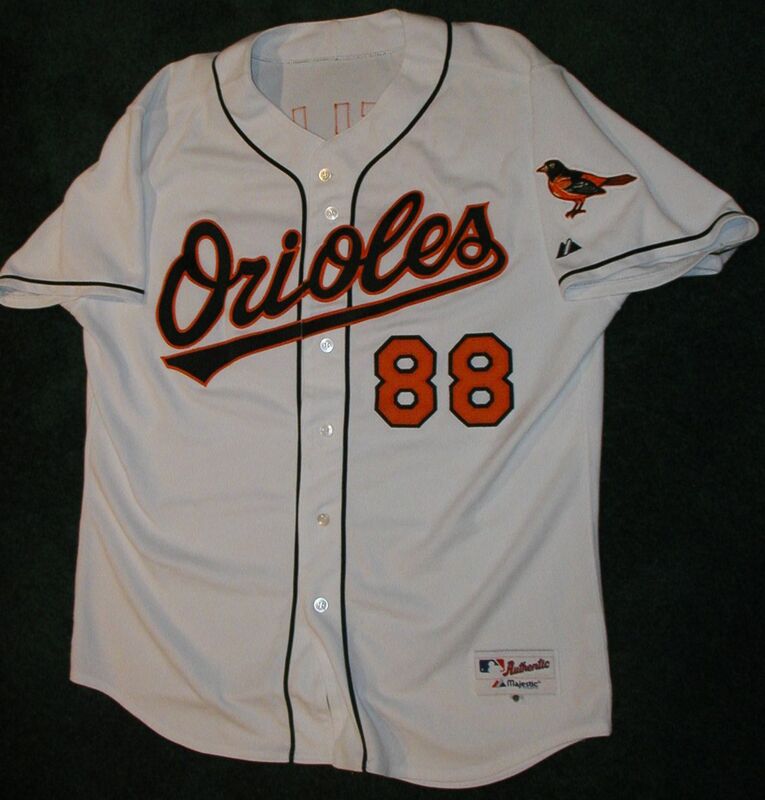 Here's the regular 1998 alternate with the new script. 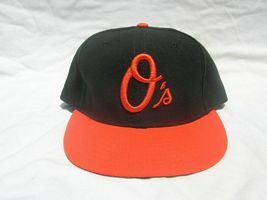 The new thinner white trim becomes obvious on alternates as black can now be seen inside the small "o" whereas in 1997 it was all white inside the "o". How about some fake Ripkens for fun!! 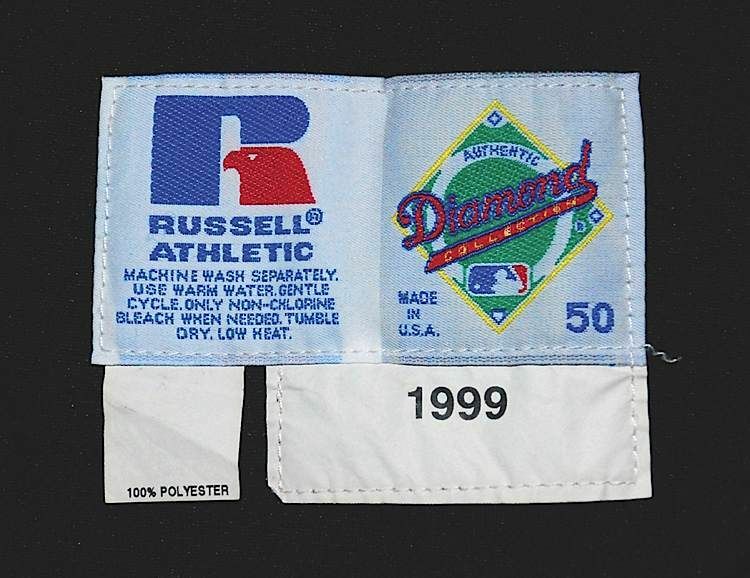 These all have 1998 script but also has front piping which was dropped in 1996. 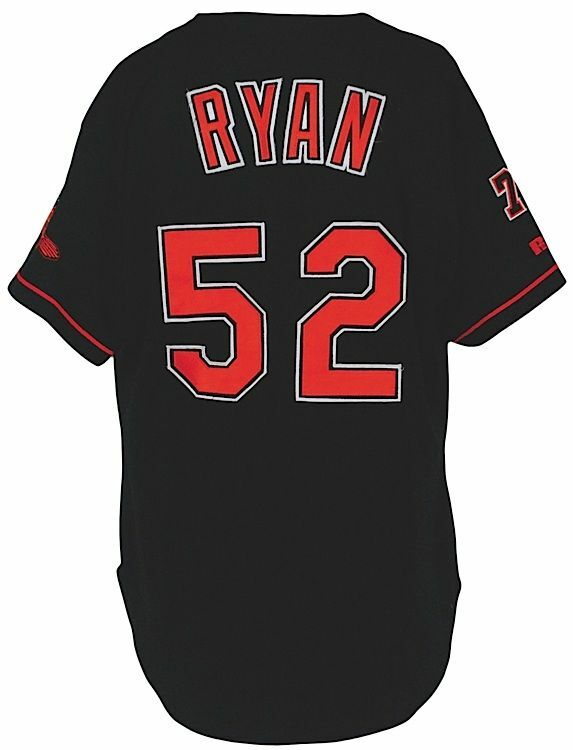 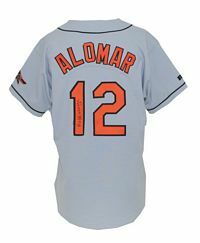 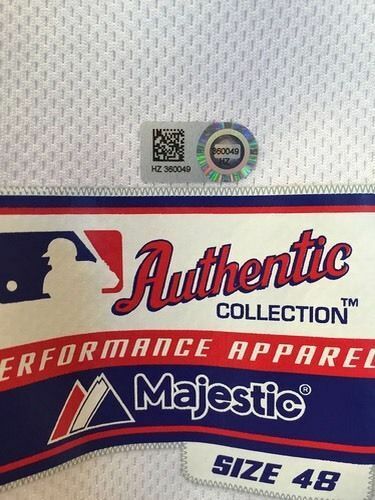 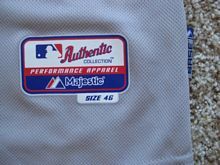 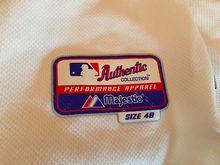 There are 2 possibilities: 1) A limited edition retail commemorative "Stat" jersey has been altered (note the numbers on the Stat jersey have no black trim whereas on the fakes, they do); or, maybe more likely, 2) Some 1998 jerseys had piping added by mistake at manufacturing and were dumped at retail. 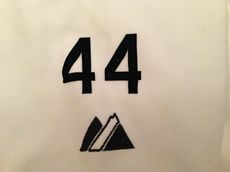 DO YOUR HOMEWORK!!! 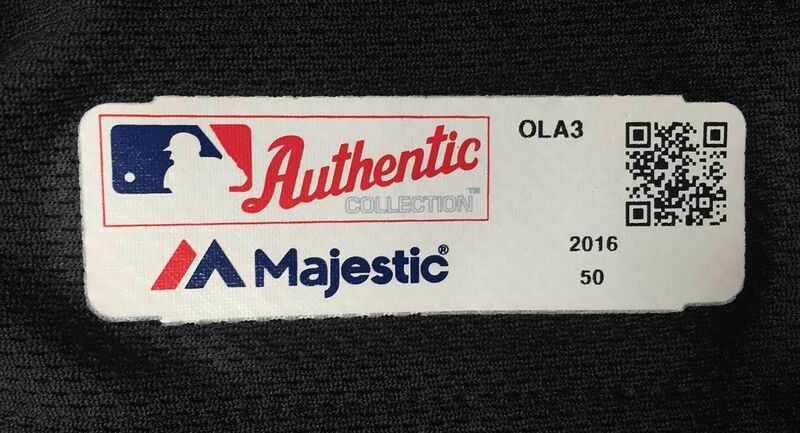 TRUST "AUTHENTICATORS" AT YOUR OWN RISK!!! 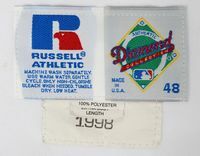 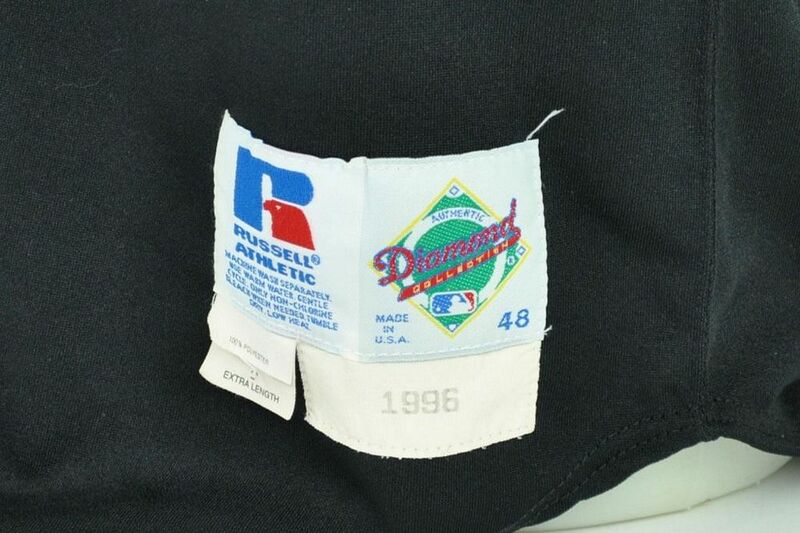 Here's one with a 1995 tag, pulled from another jersey, deftly added by some con. Global Certified Authentic no less!!! 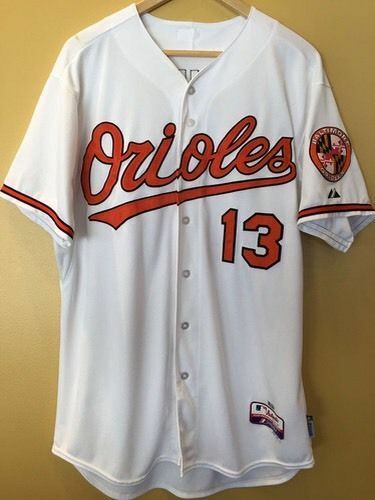 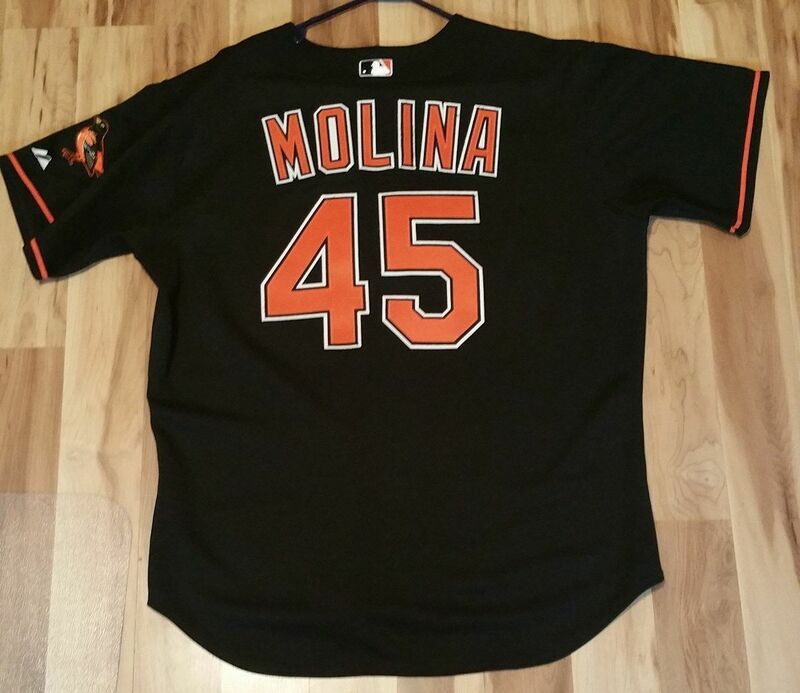 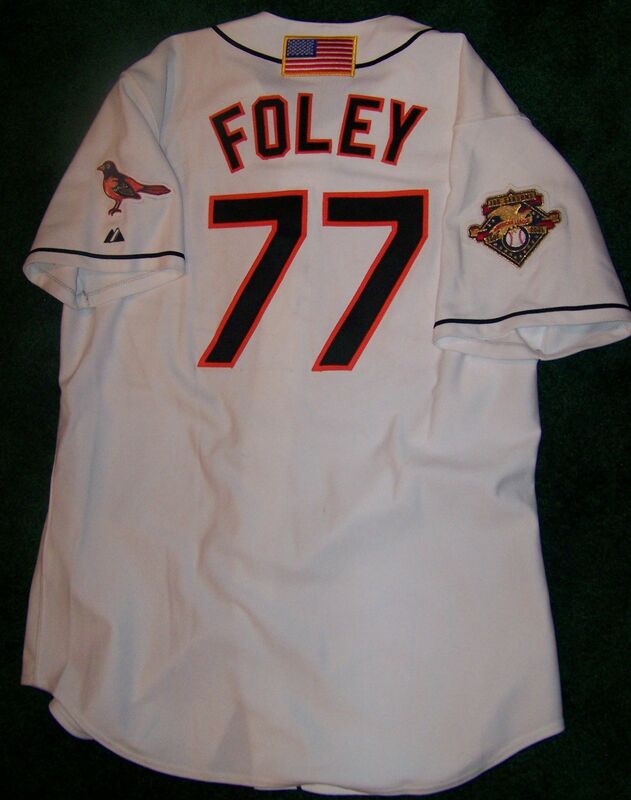 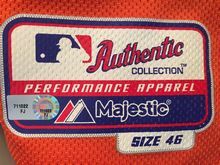 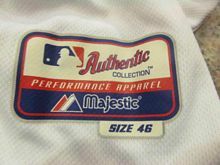 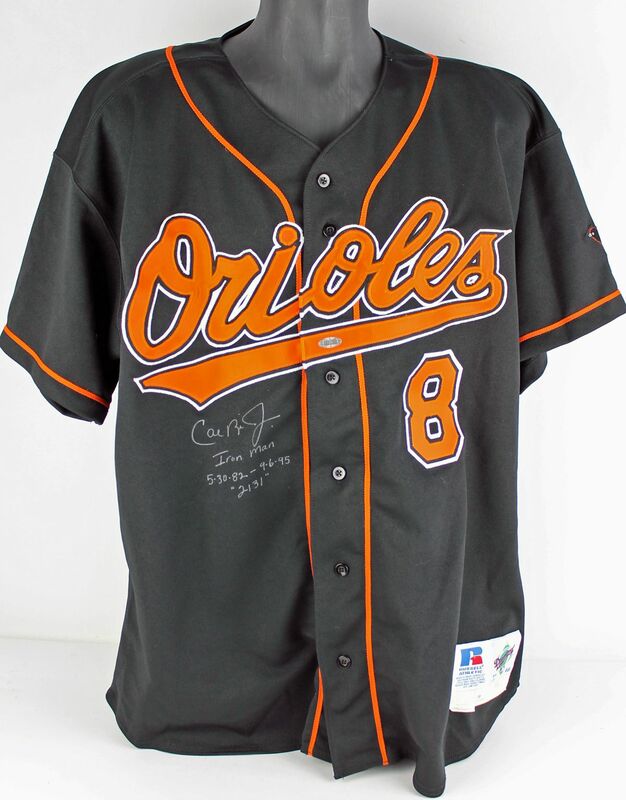 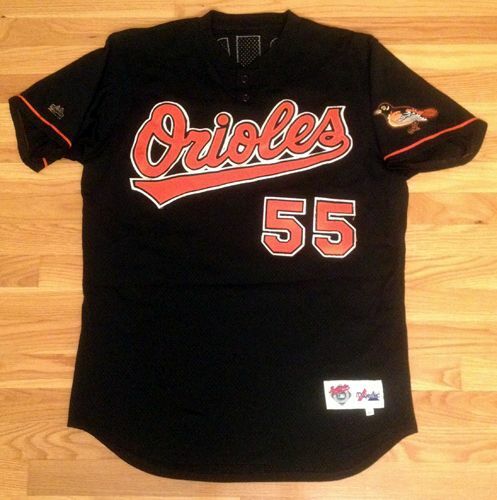 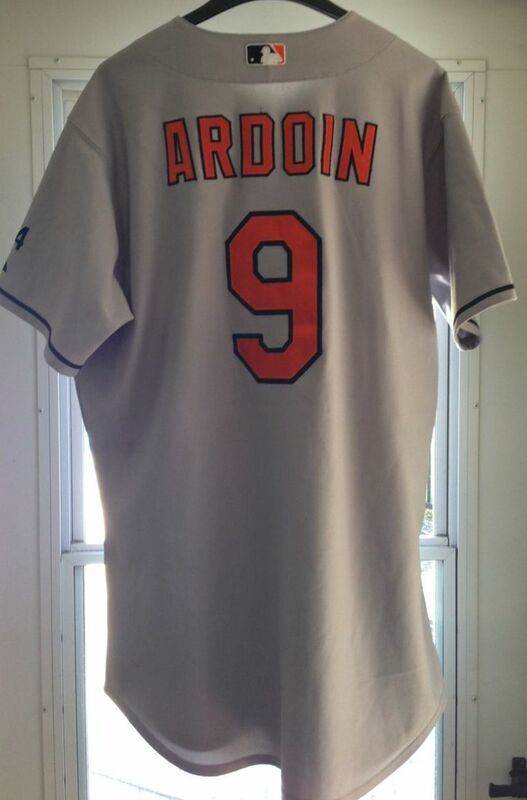 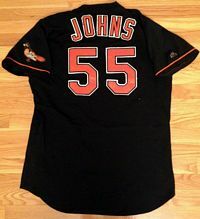 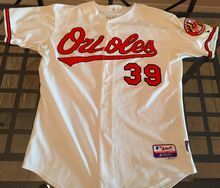 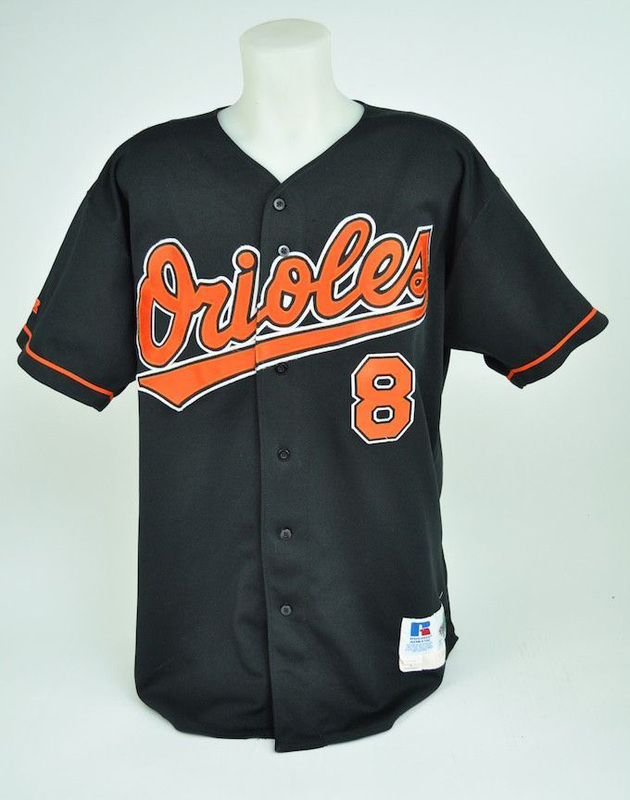 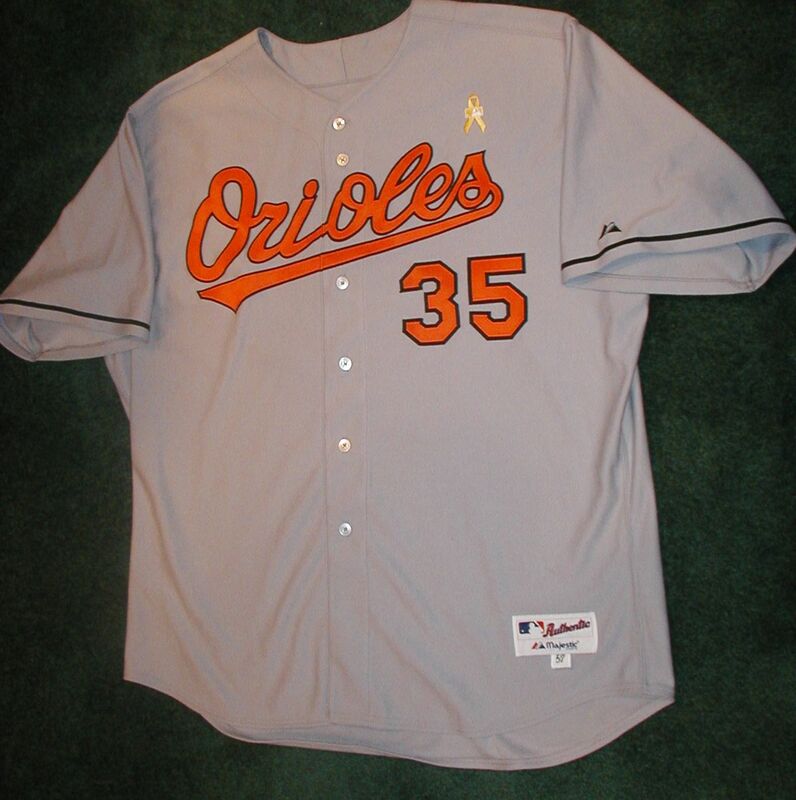 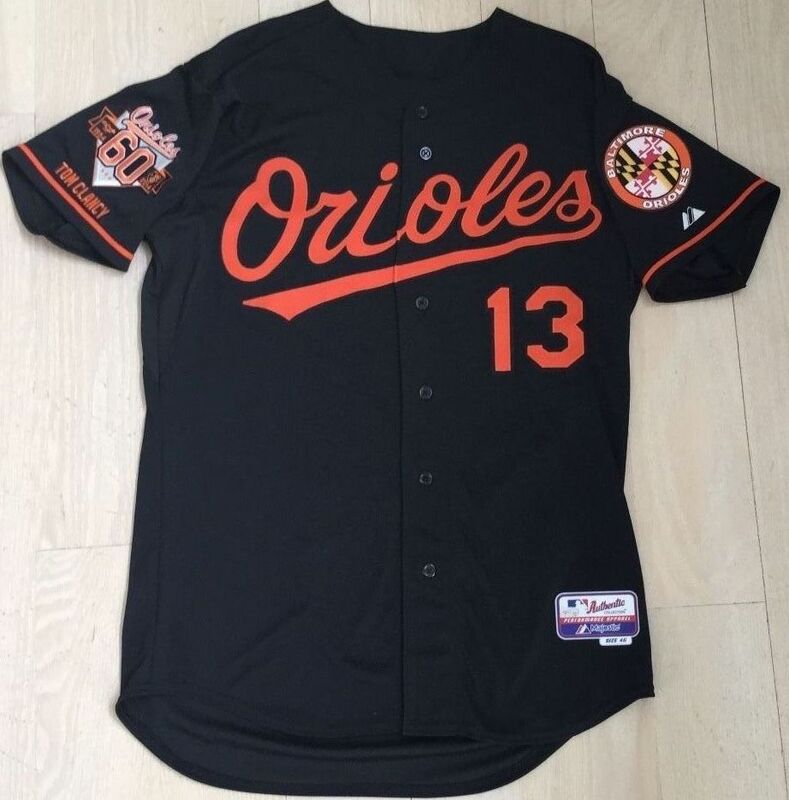 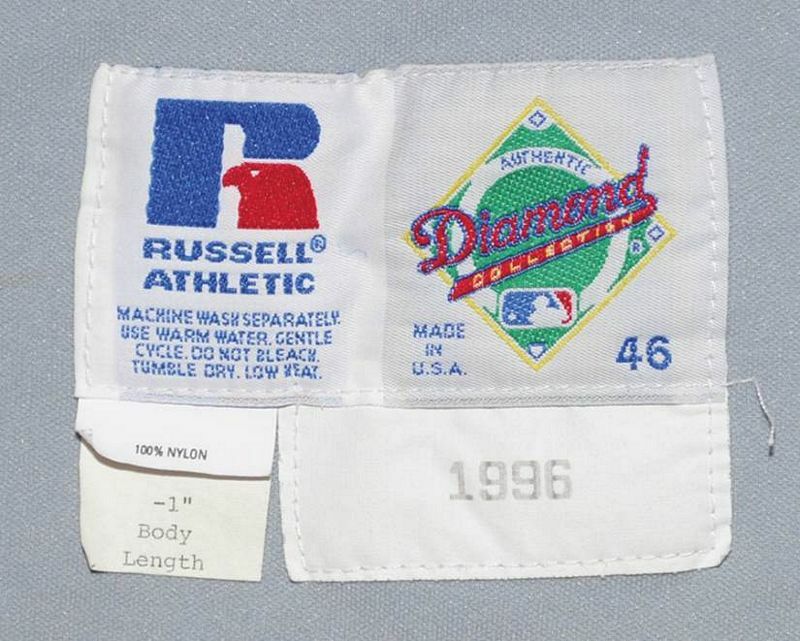 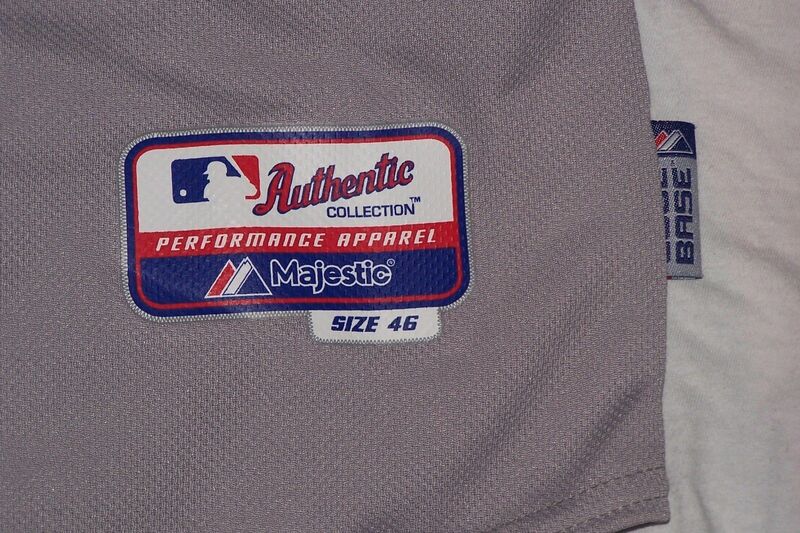 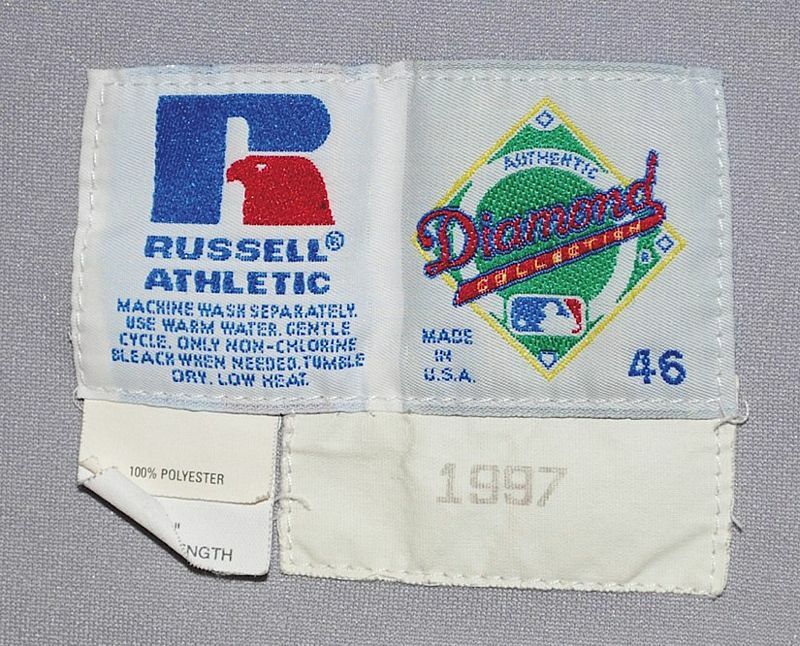 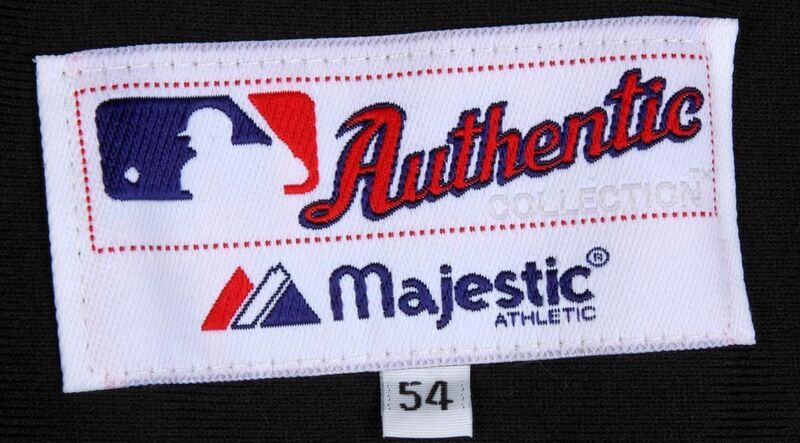 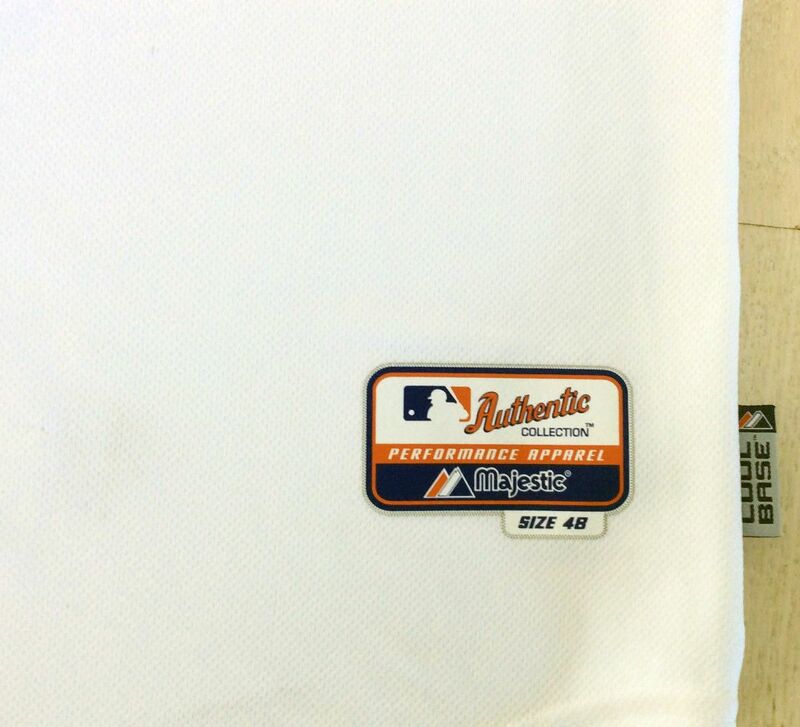 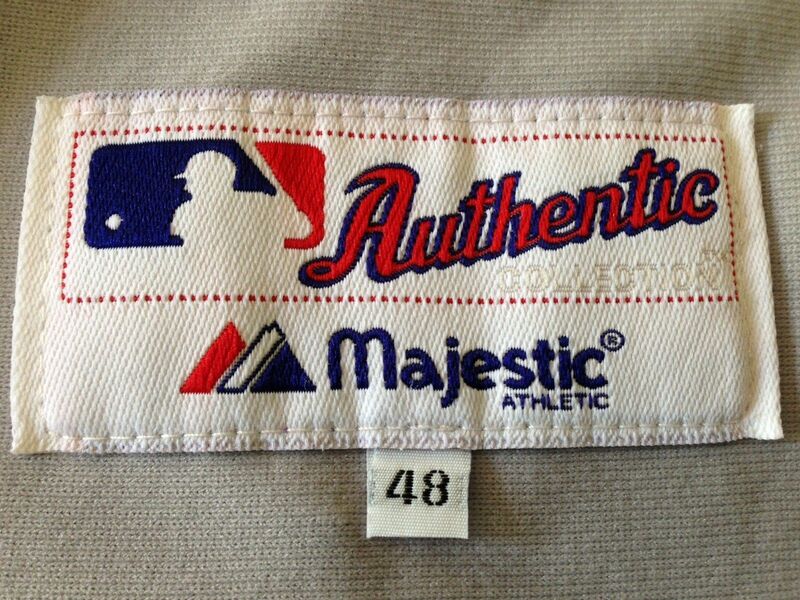 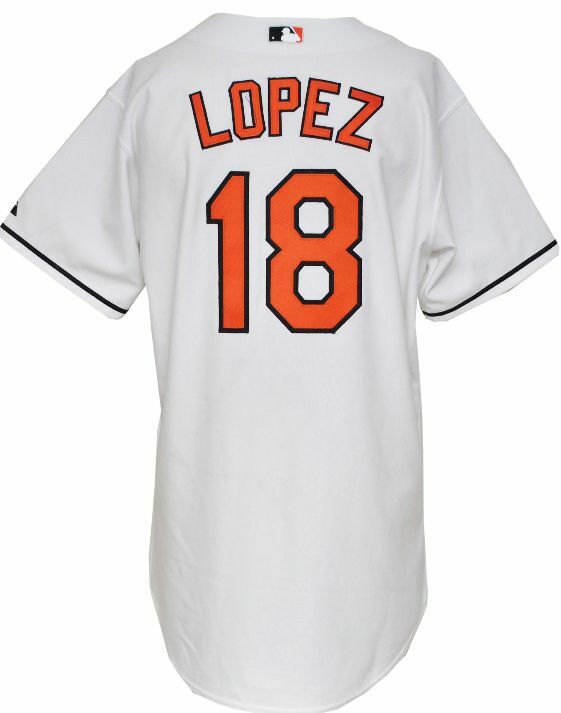 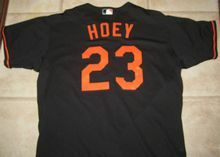 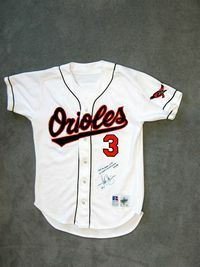 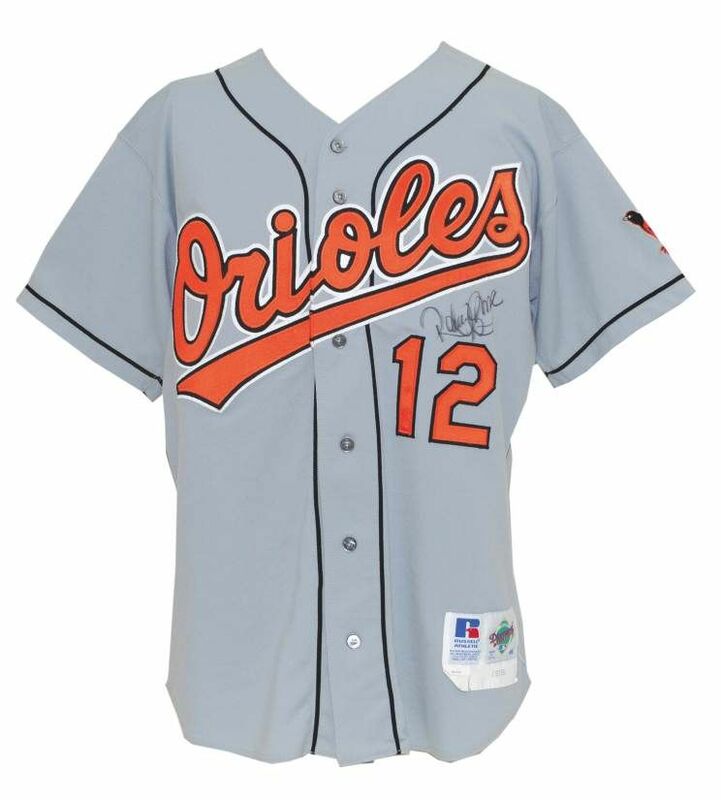 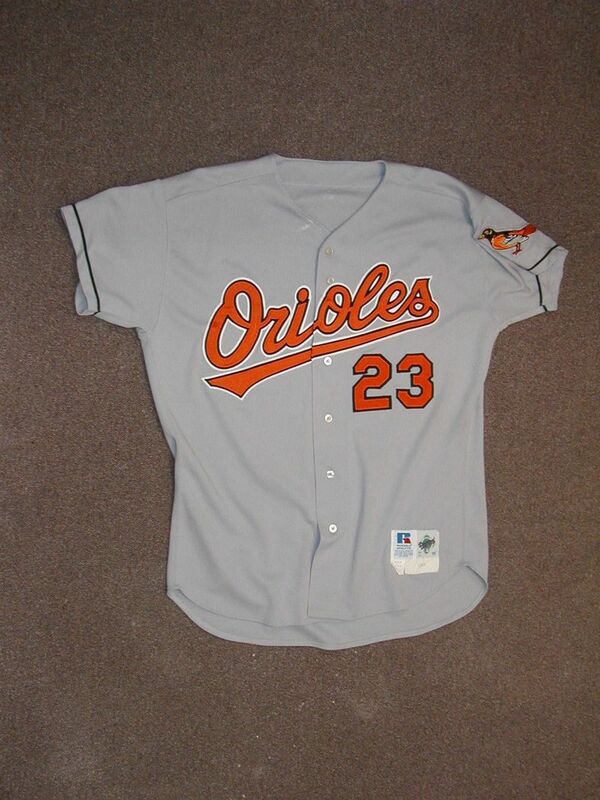 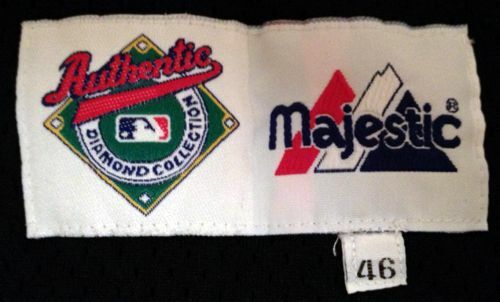 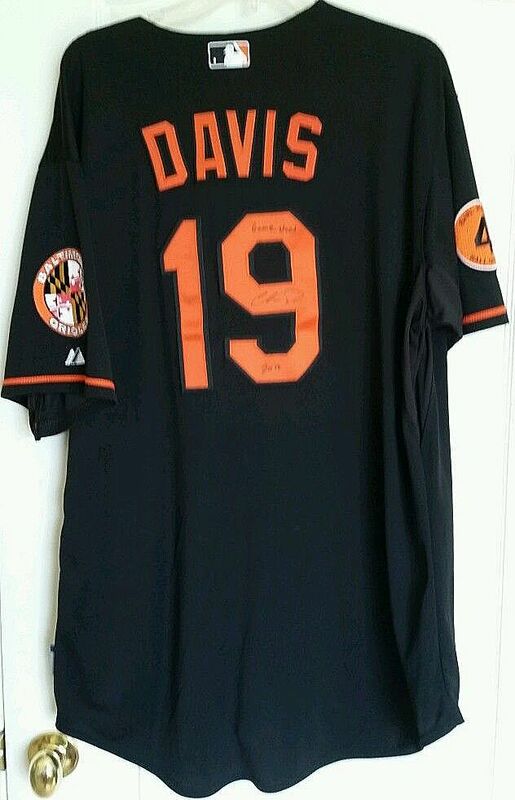 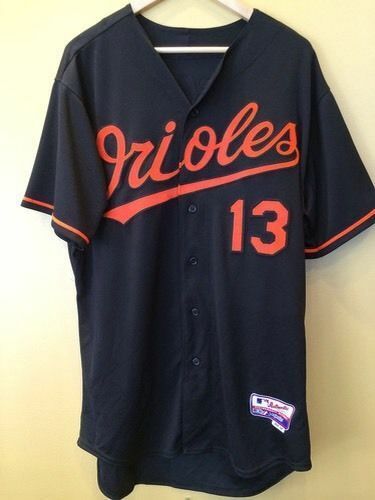 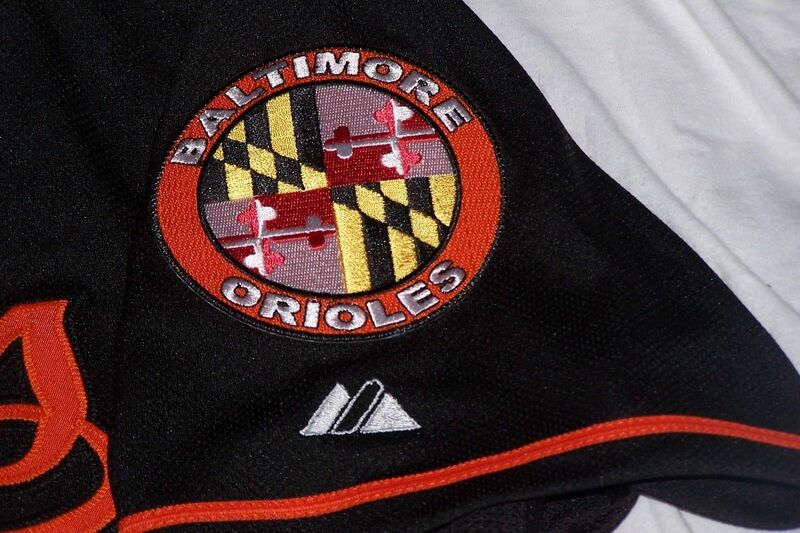 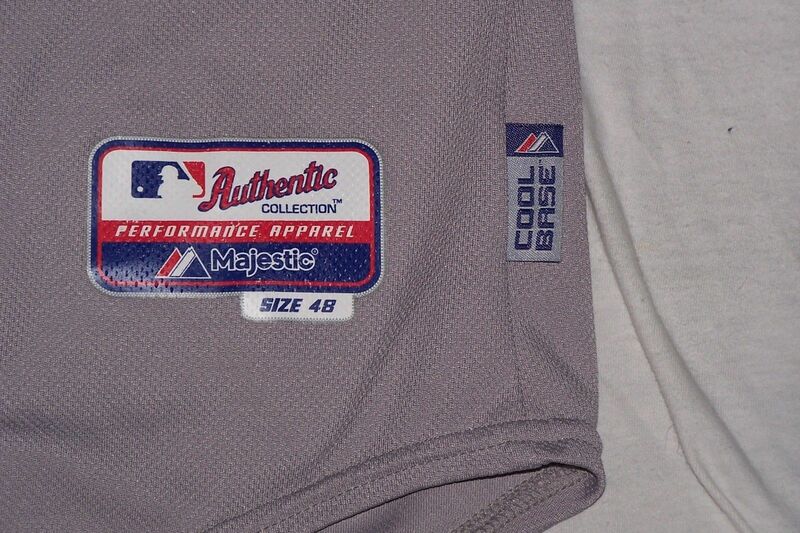 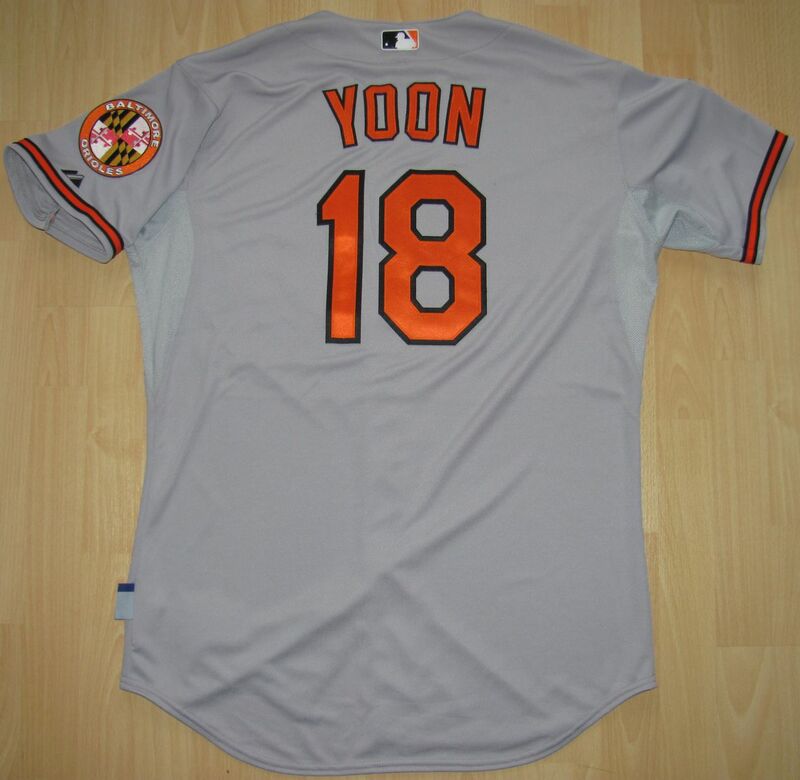 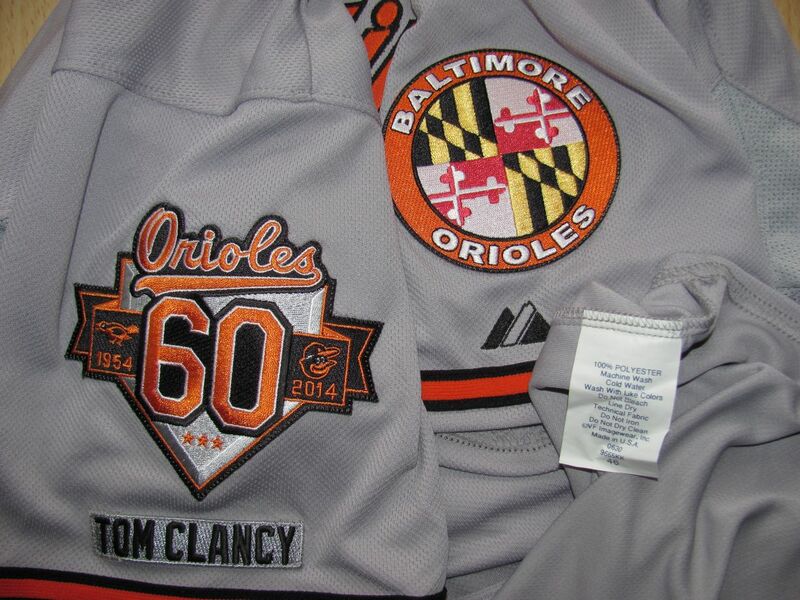 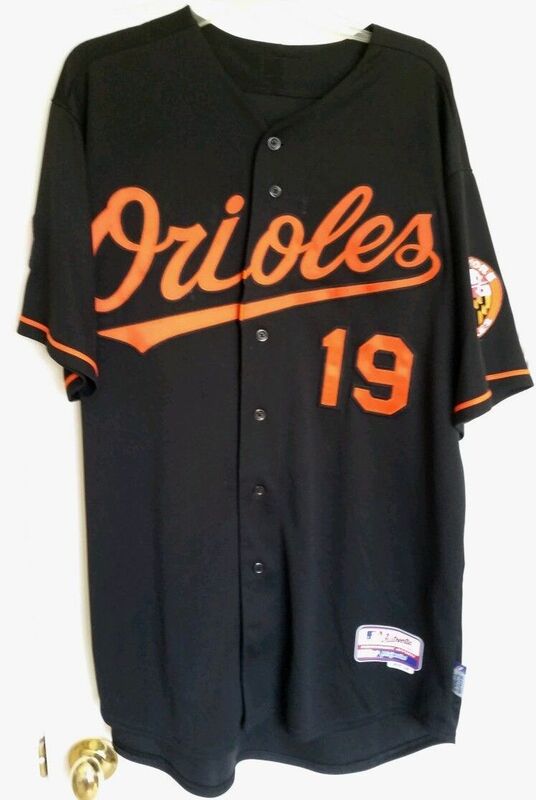 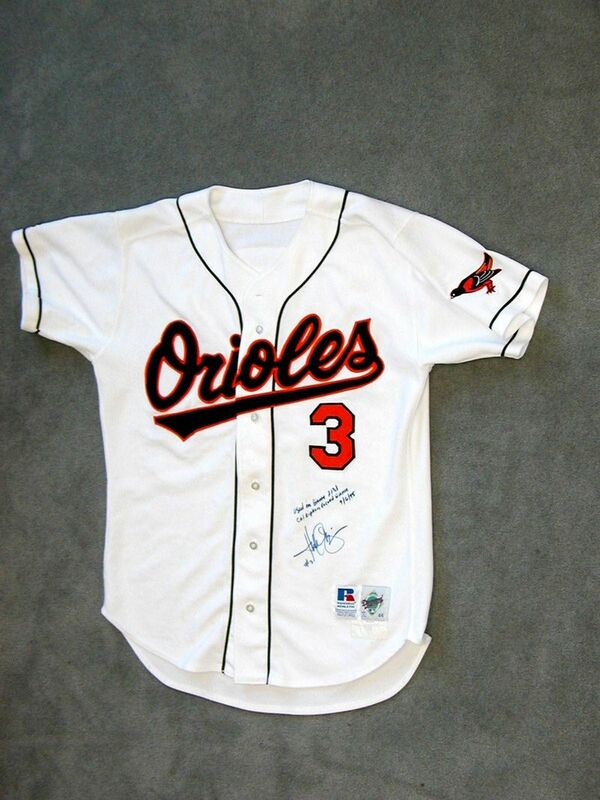 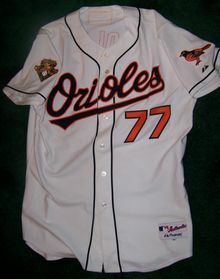 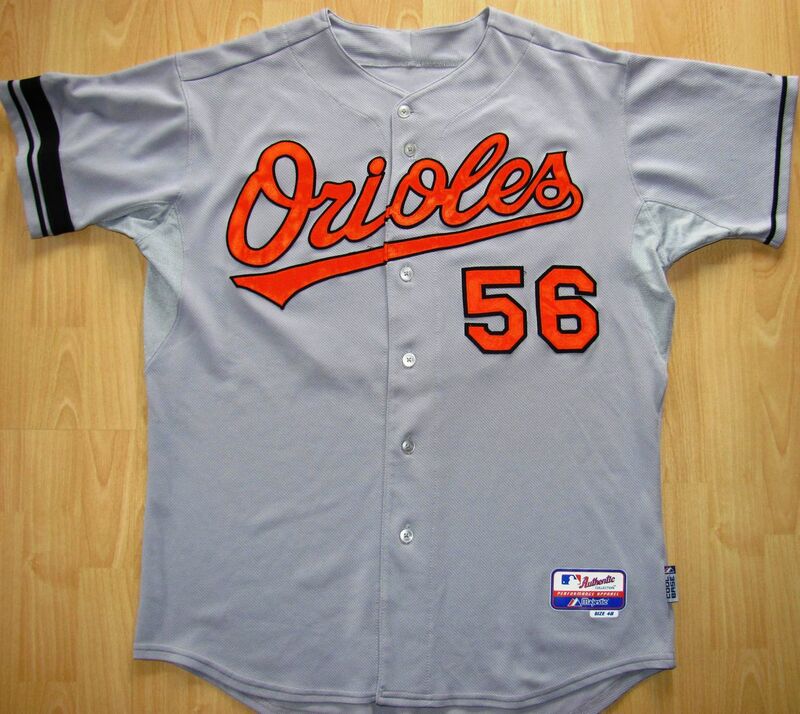 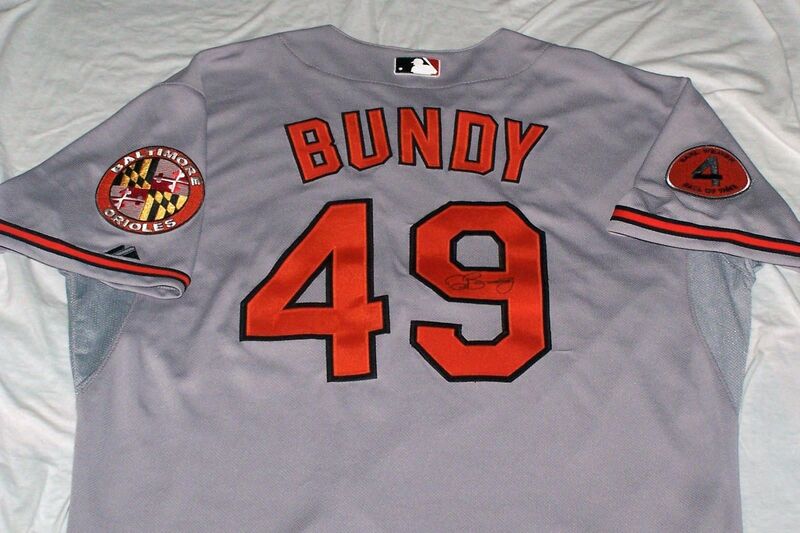 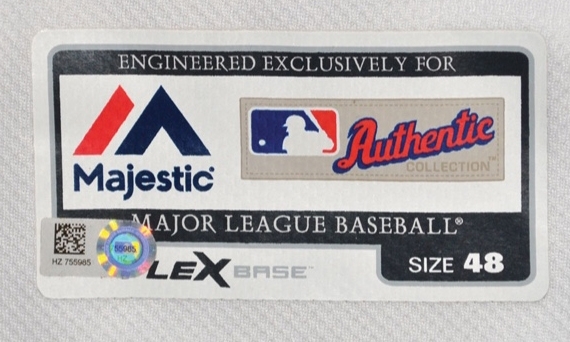 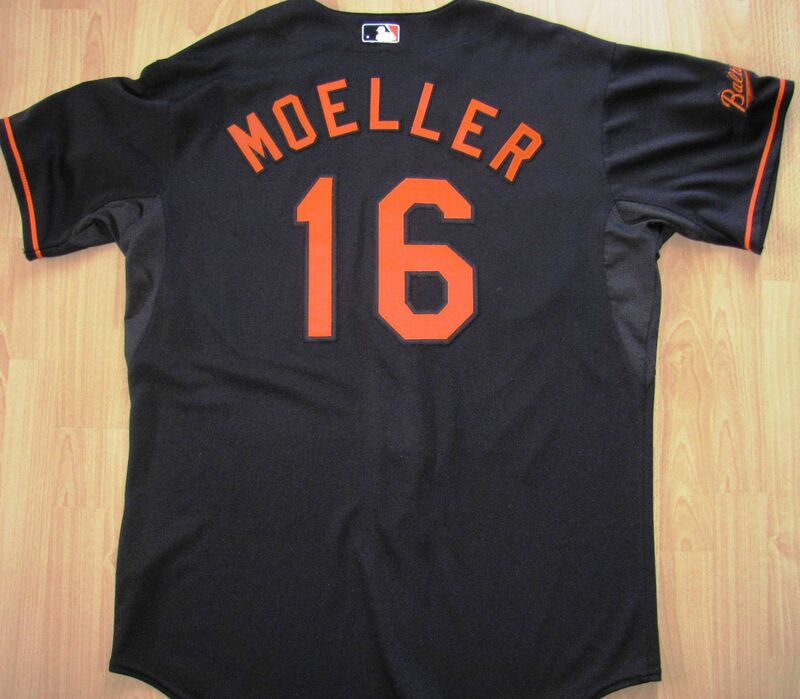 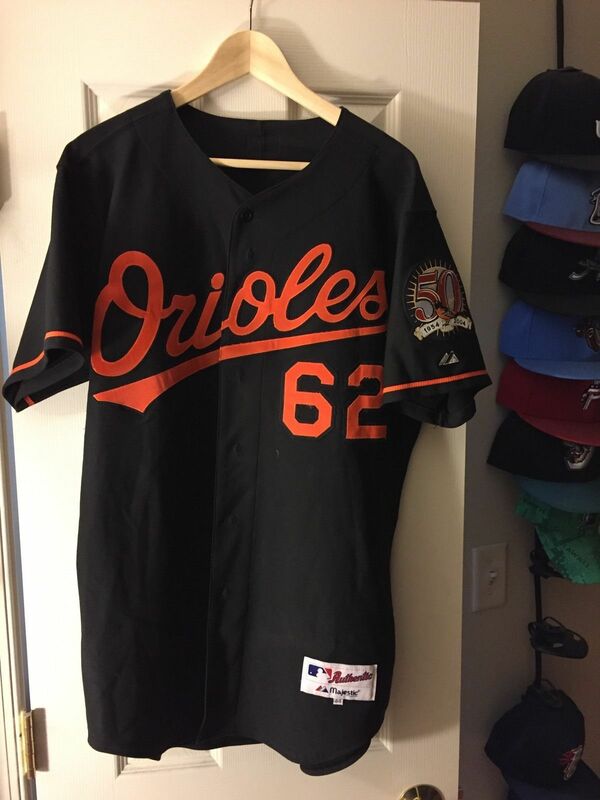 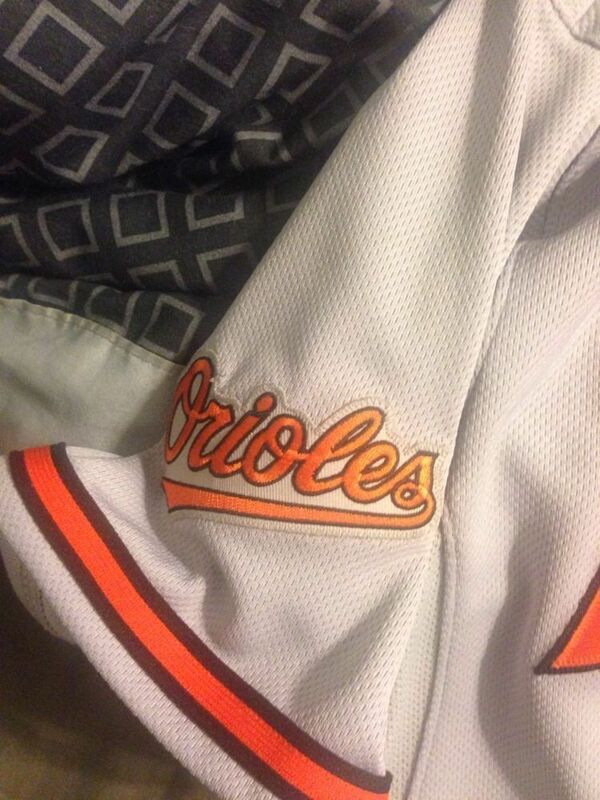 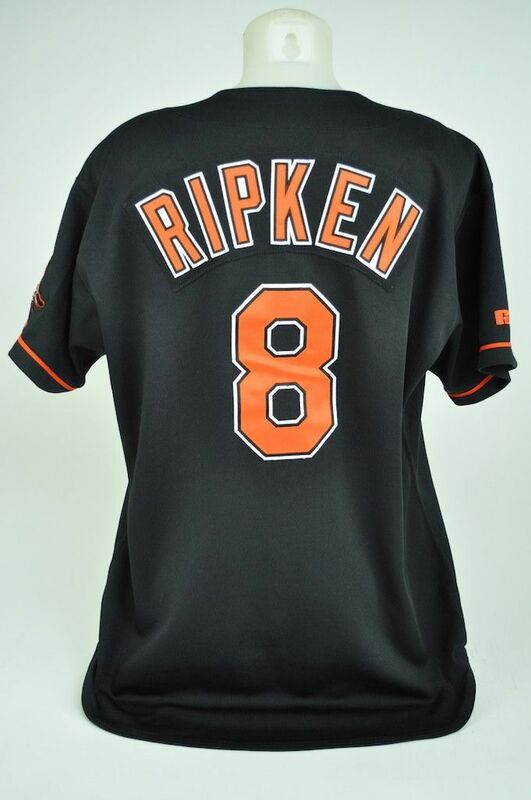 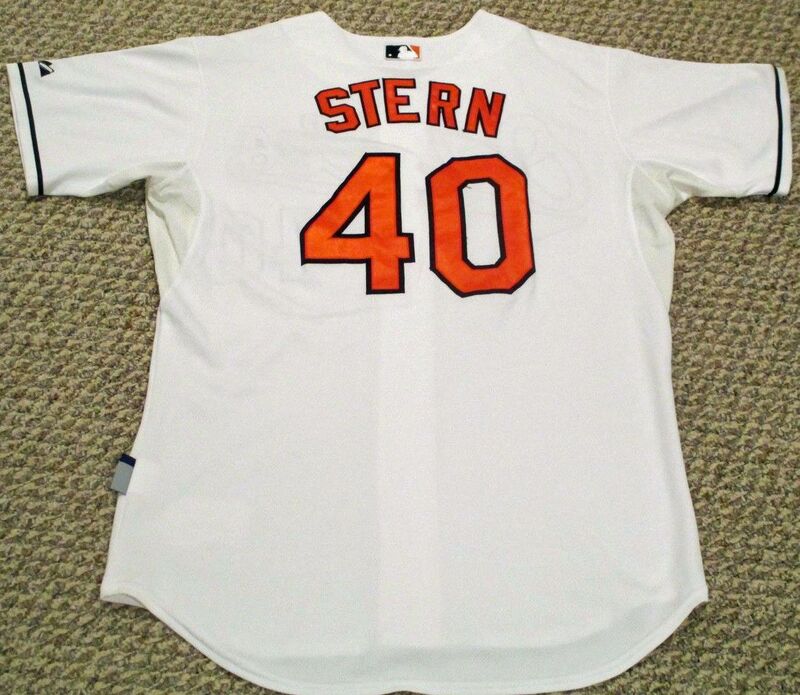 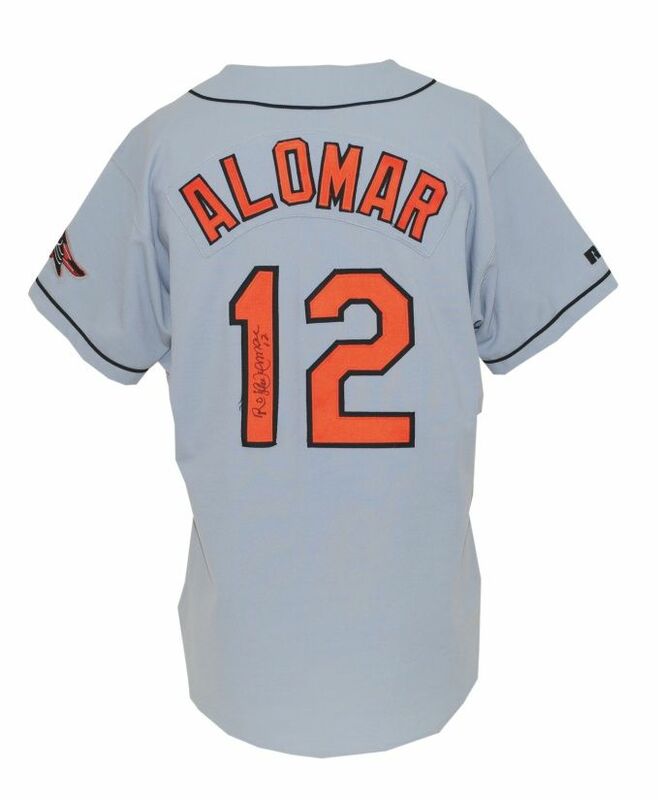 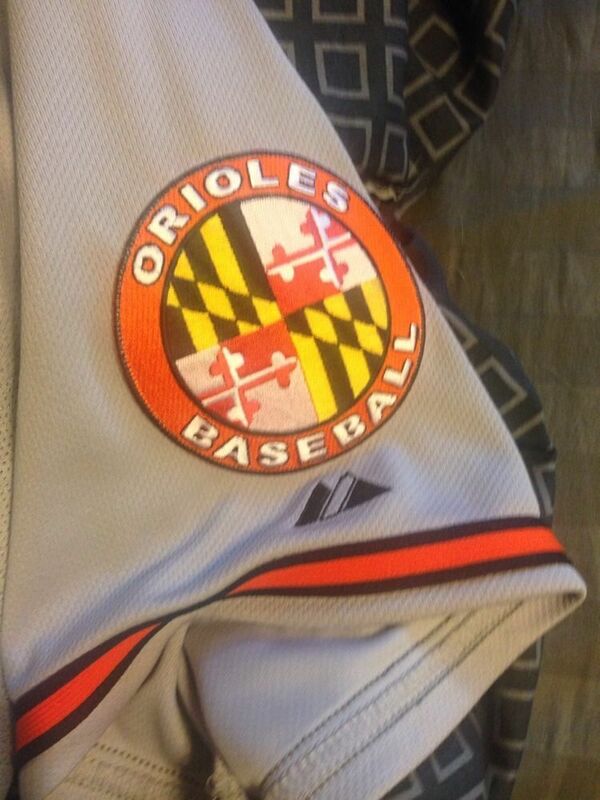 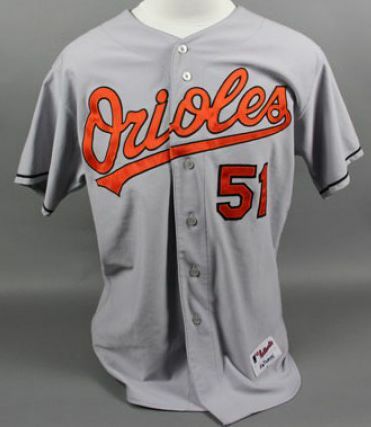 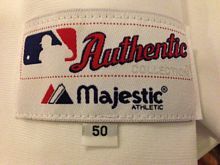 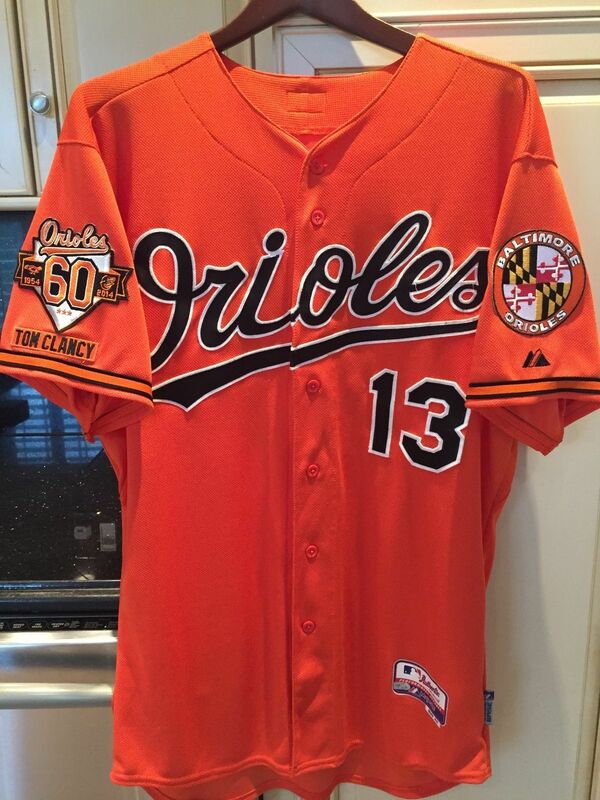 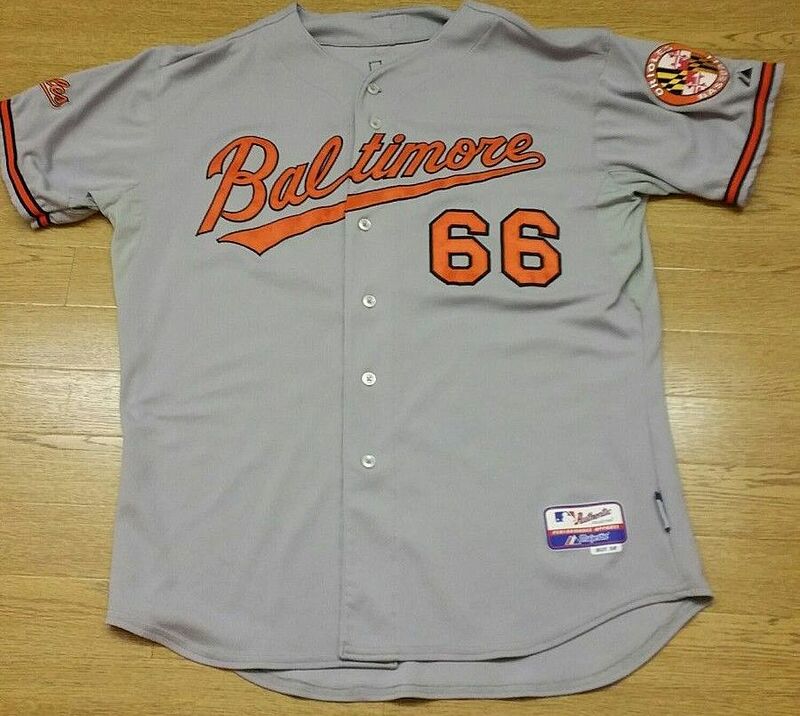 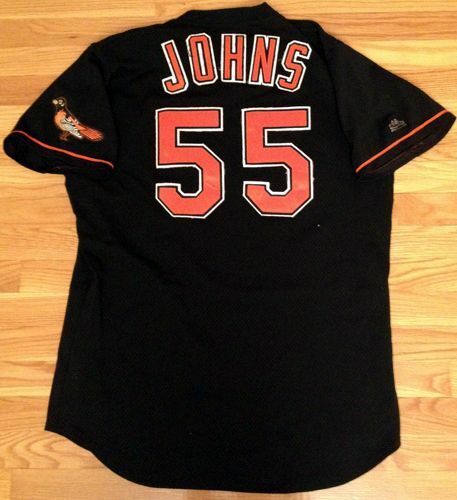 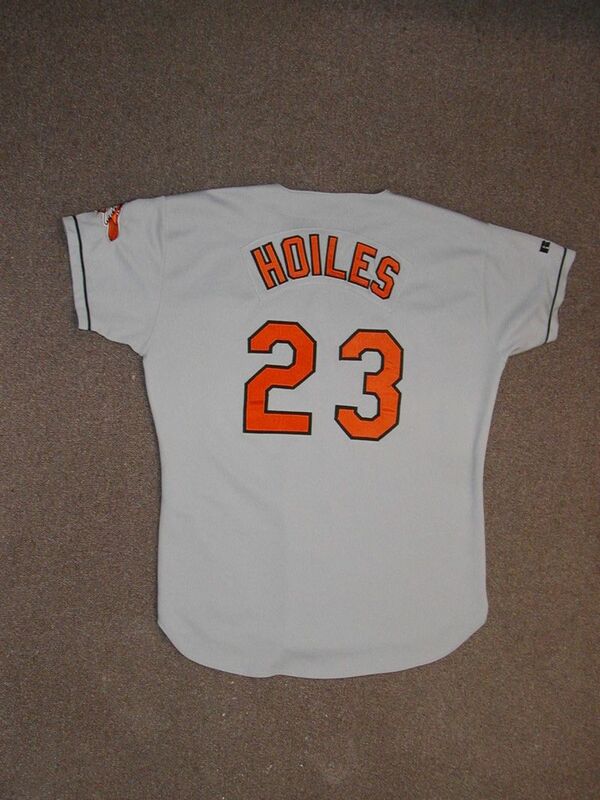 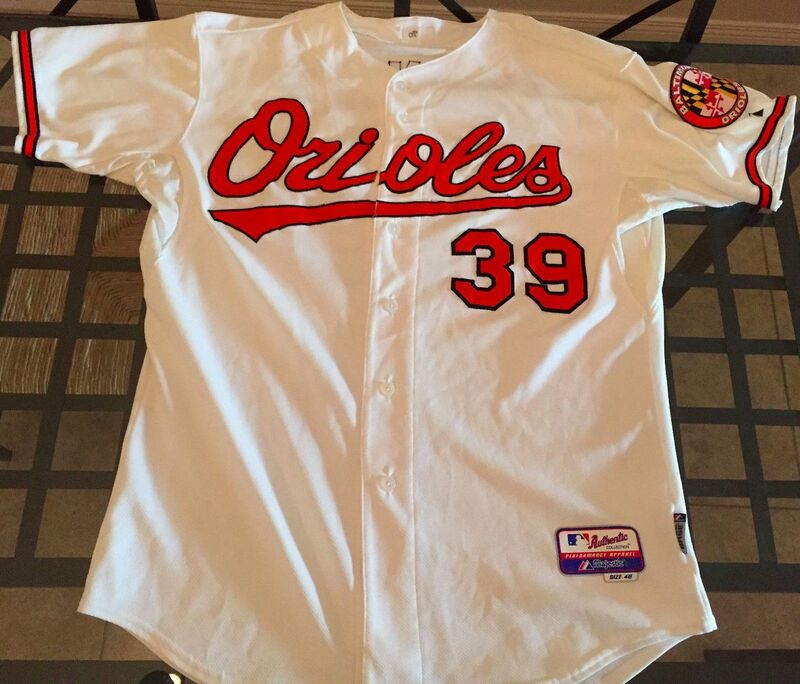 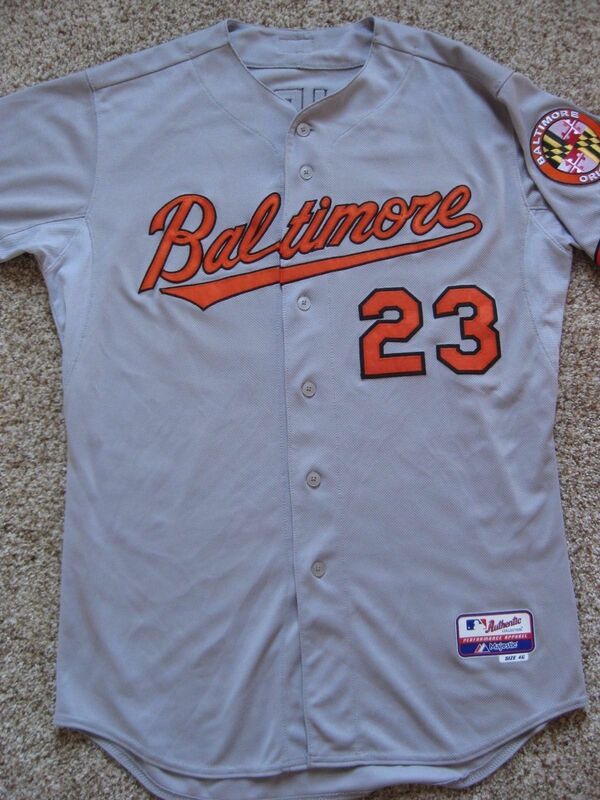 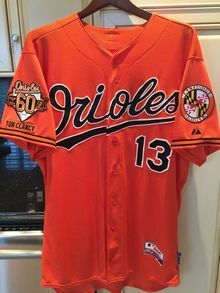 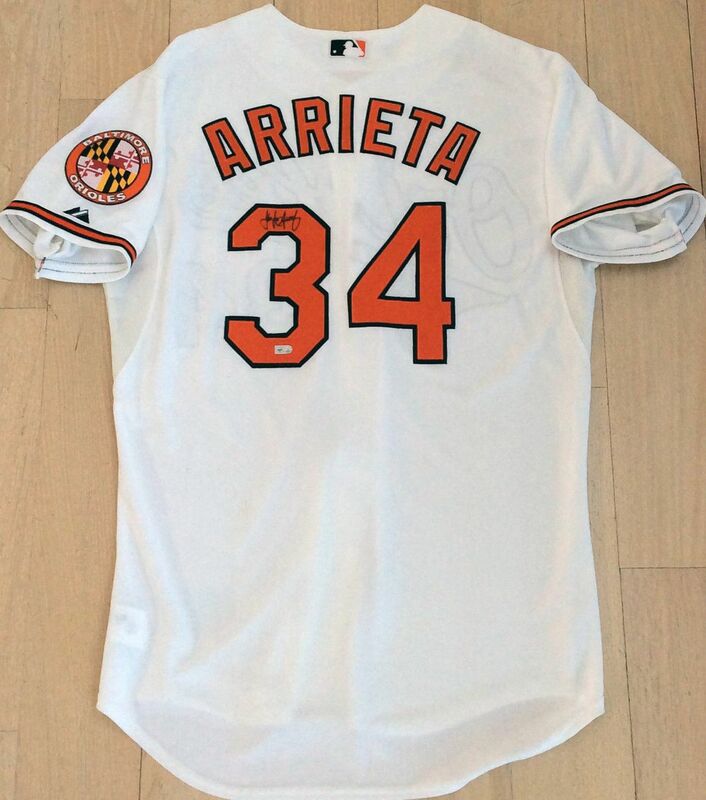 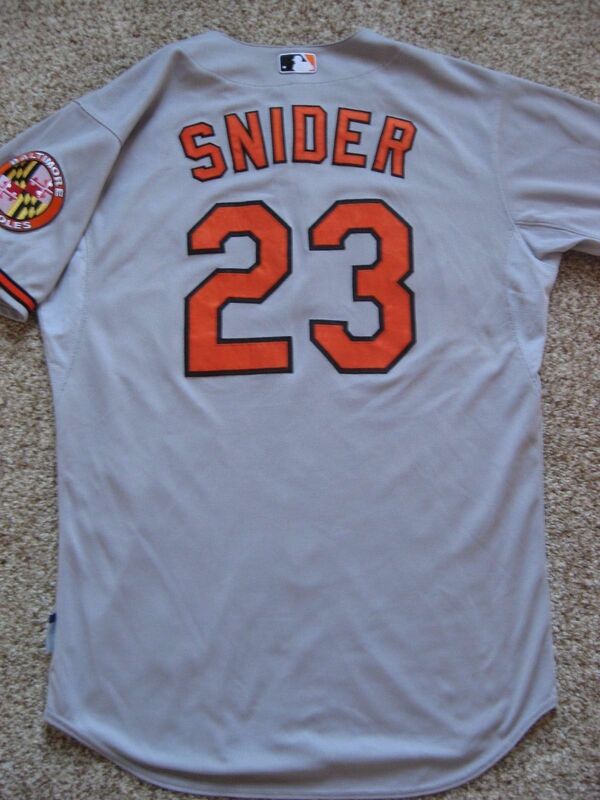 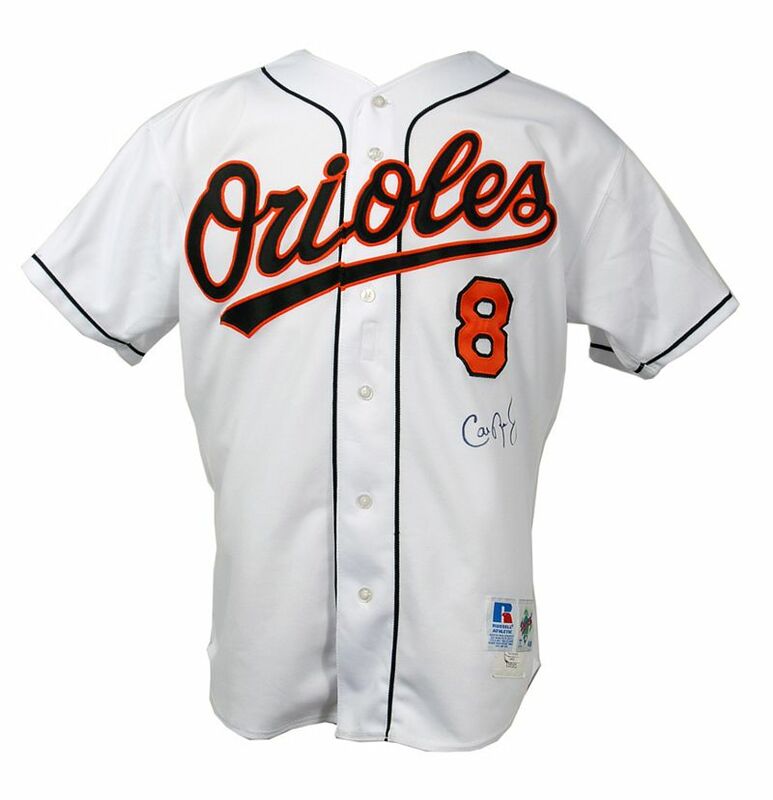 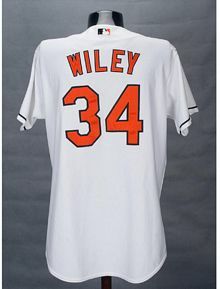 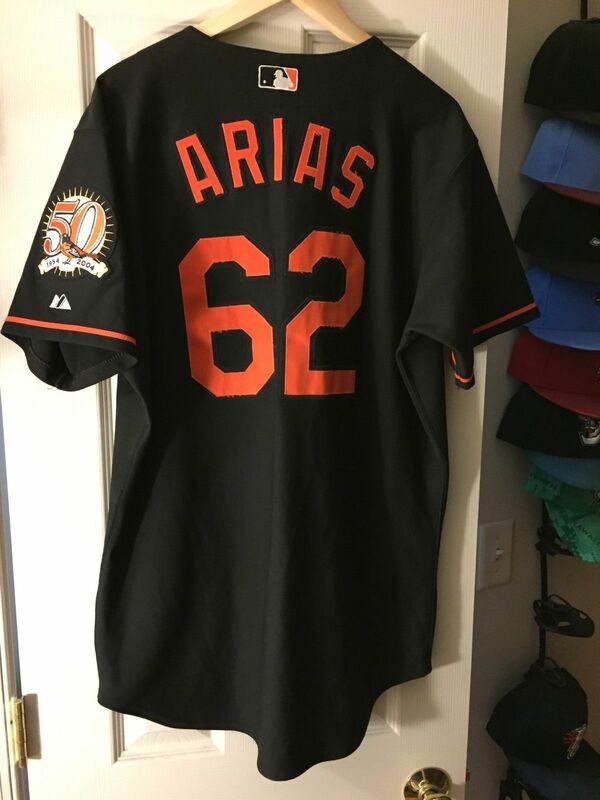 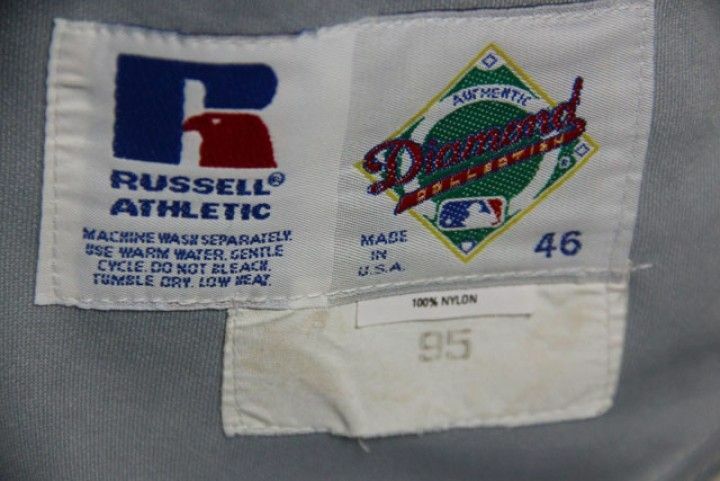 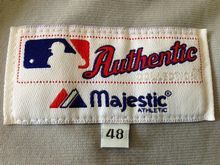 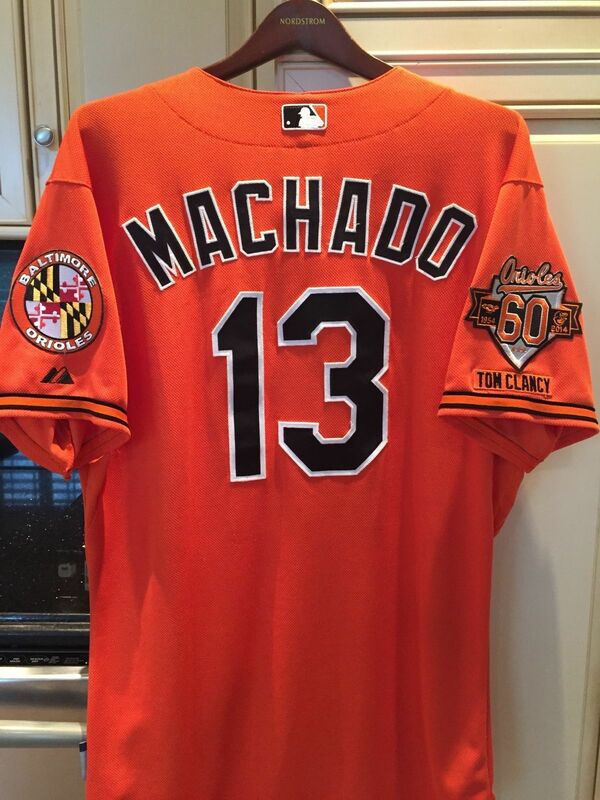 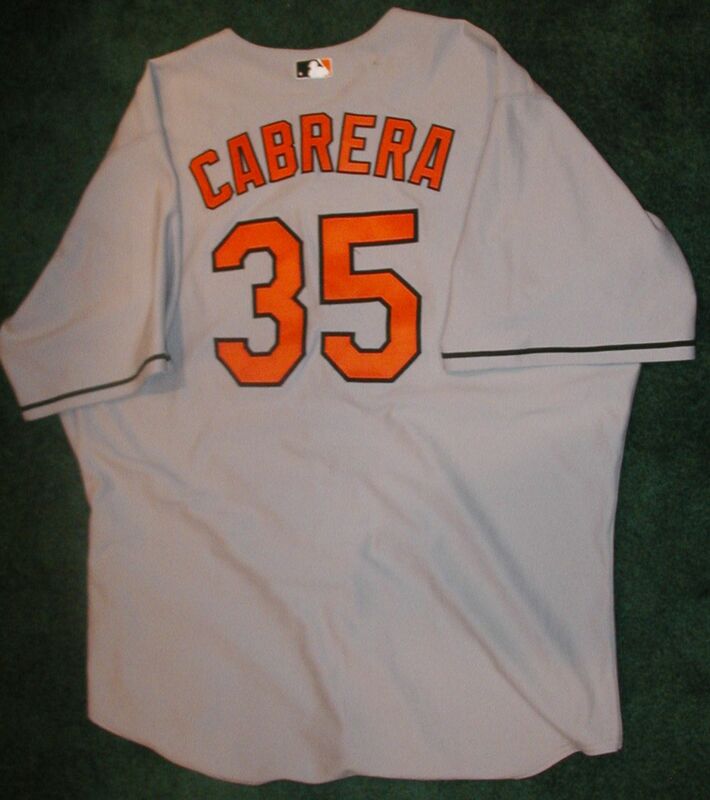 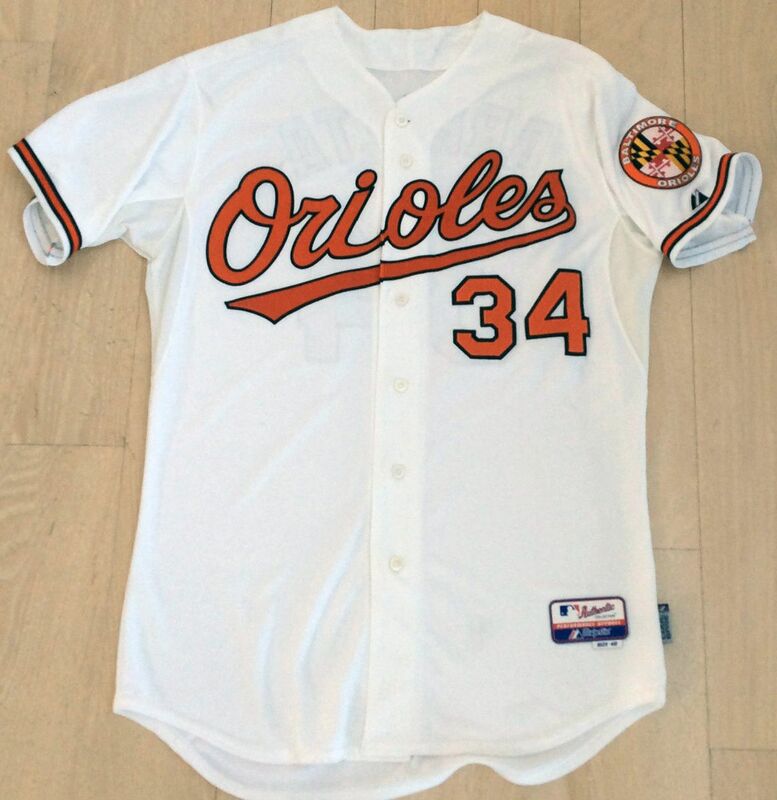 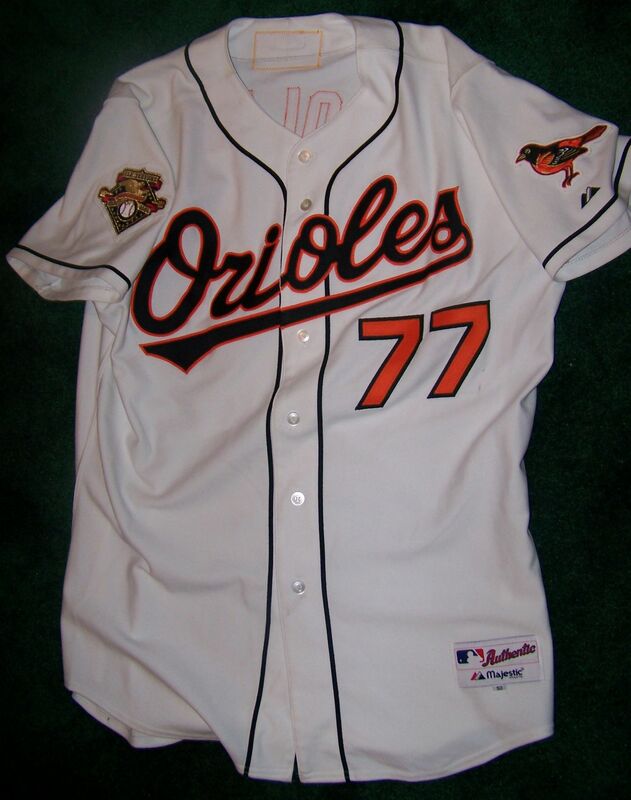 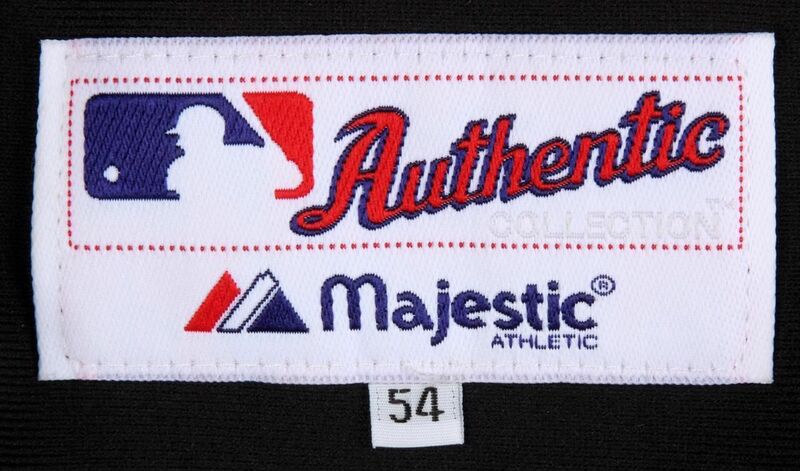 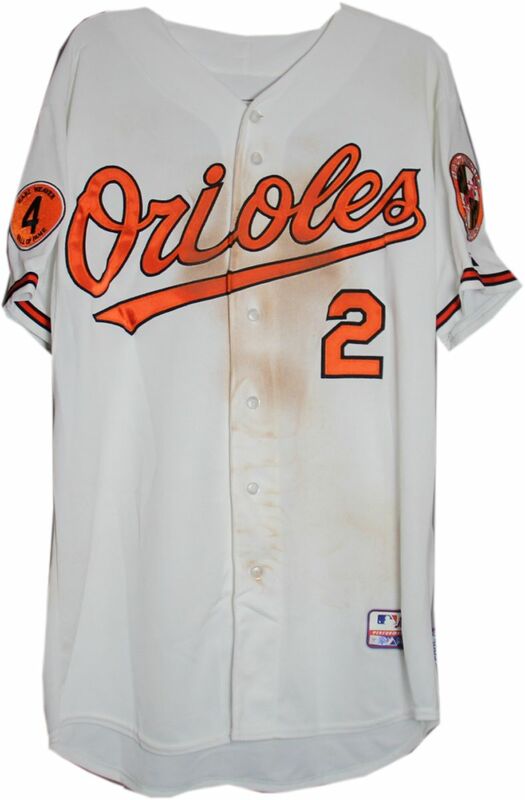 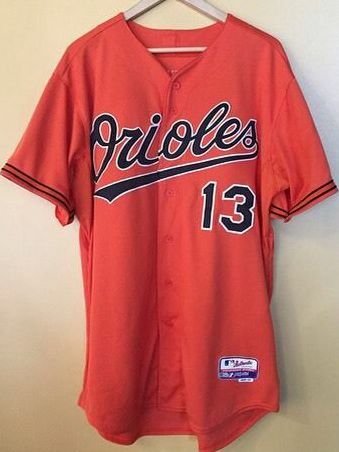 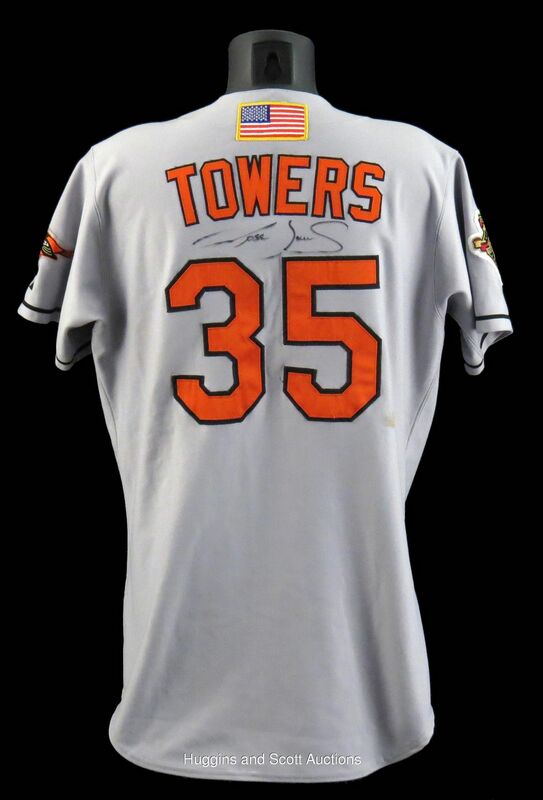 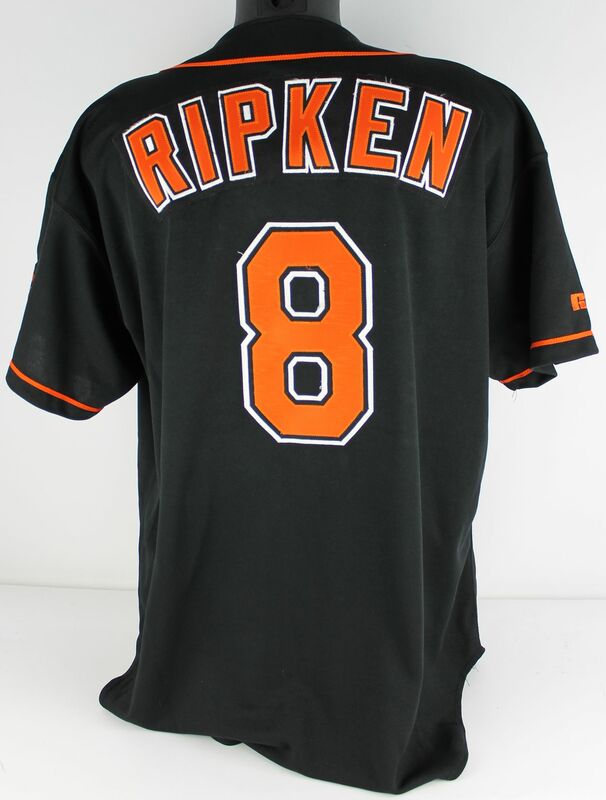 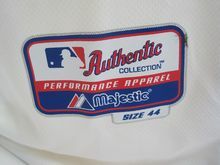 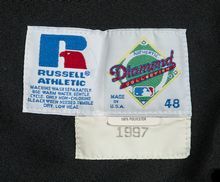 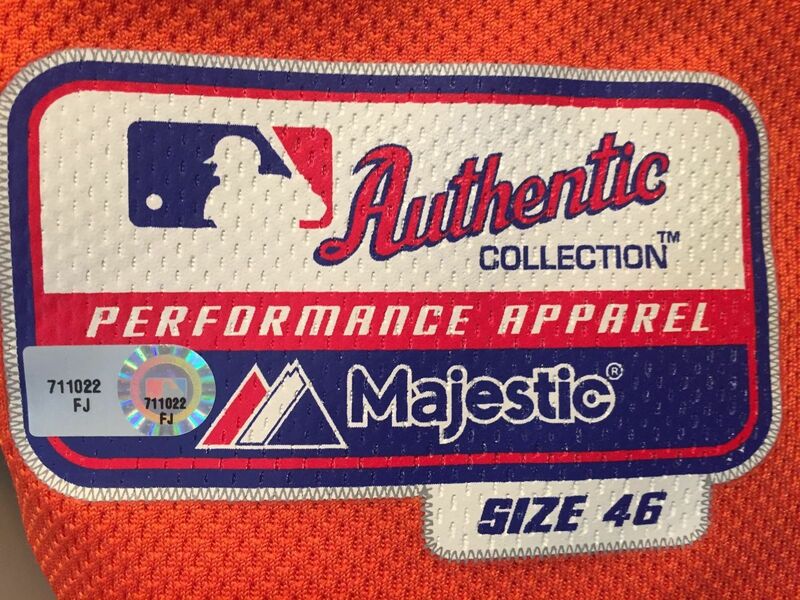 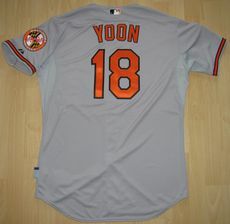 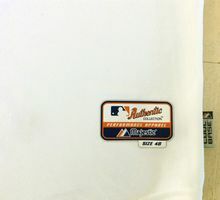 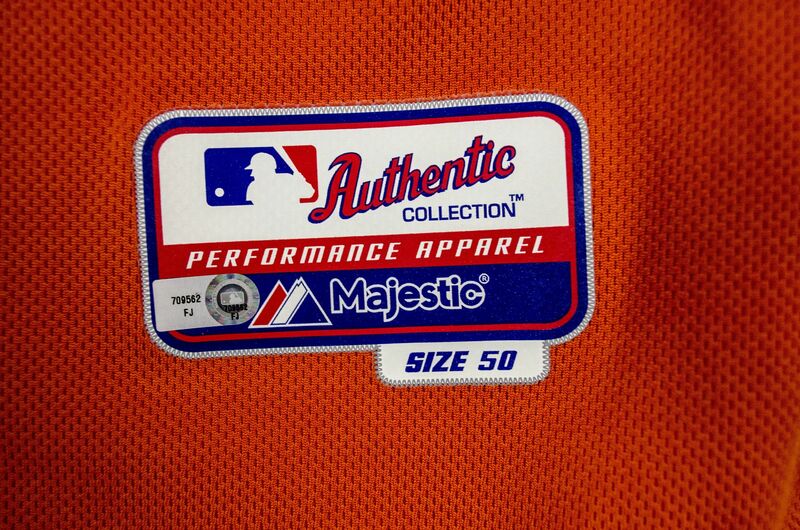 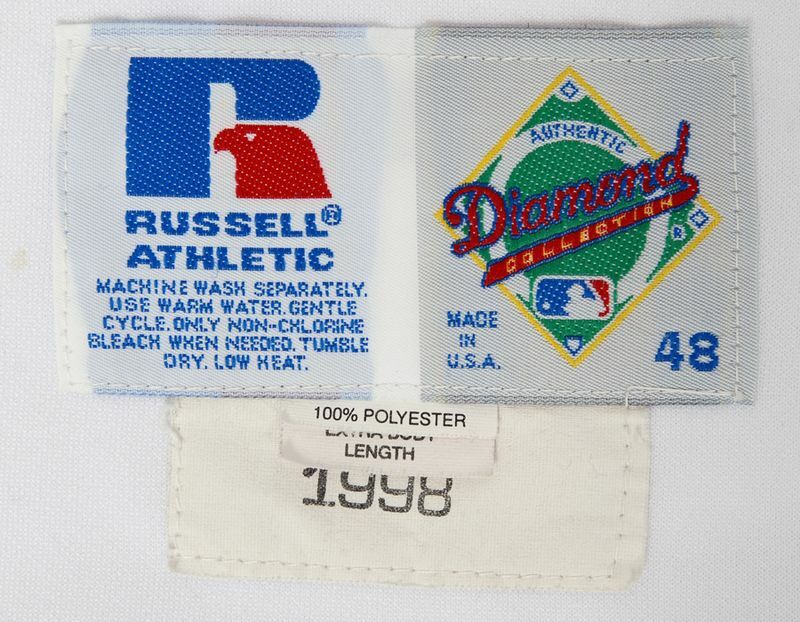 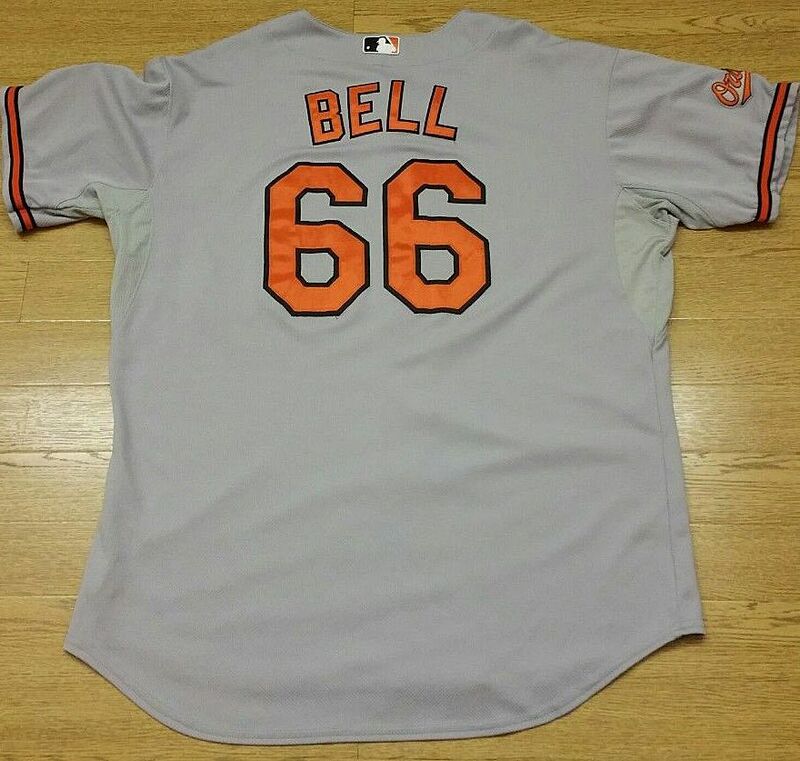 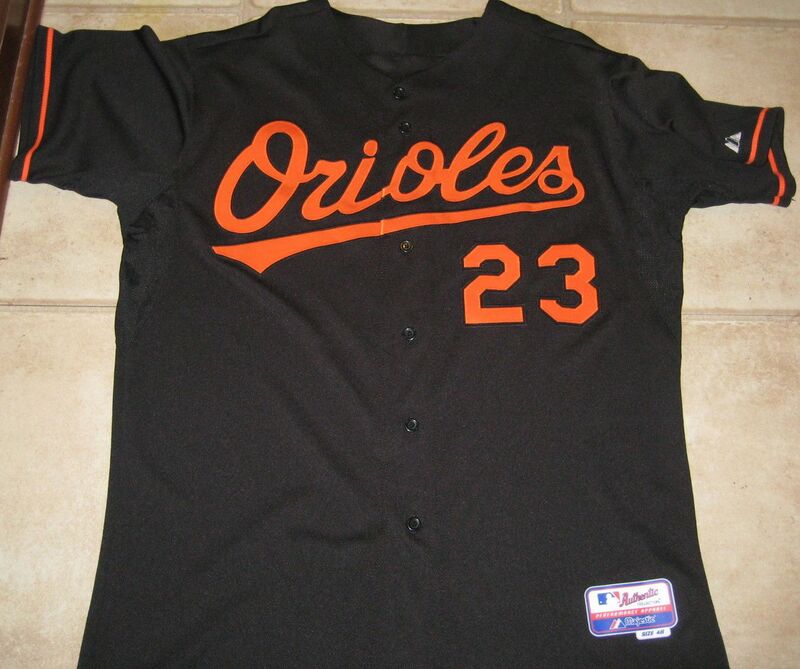 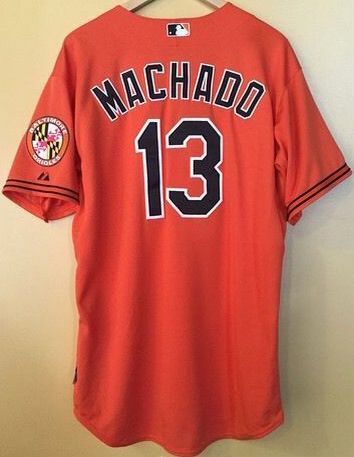 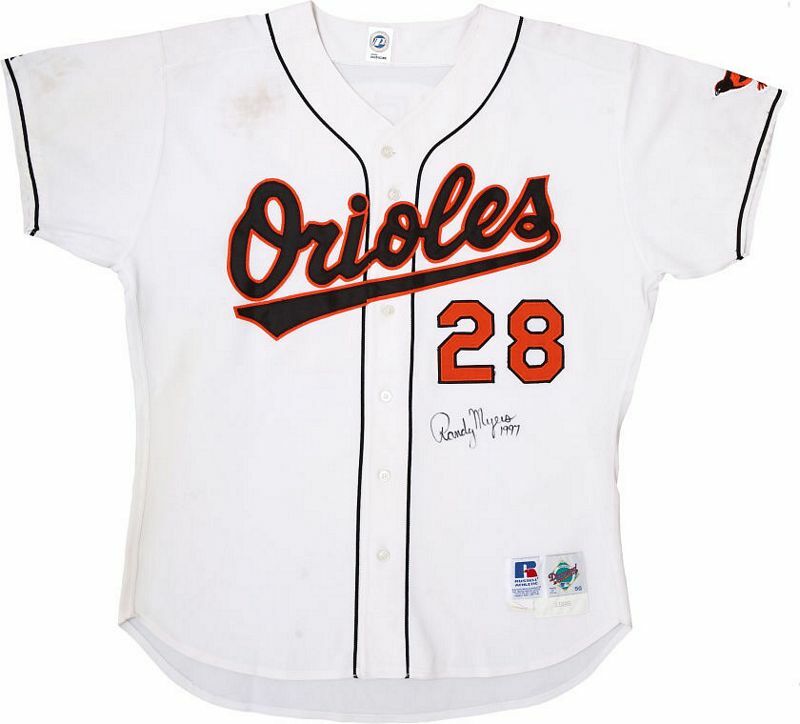 Here's another fake with a 1996 tag from some other jersey (the O's never used tags like that), an LOA(!!!) 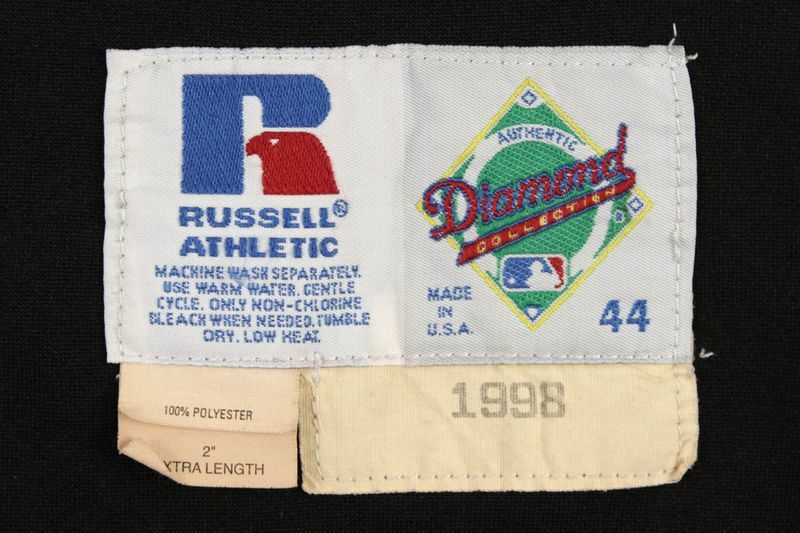 from Richard Russek, Andy Imperato/Grey Flannel and Mile High Card Co. and it sold for $4,075!!! 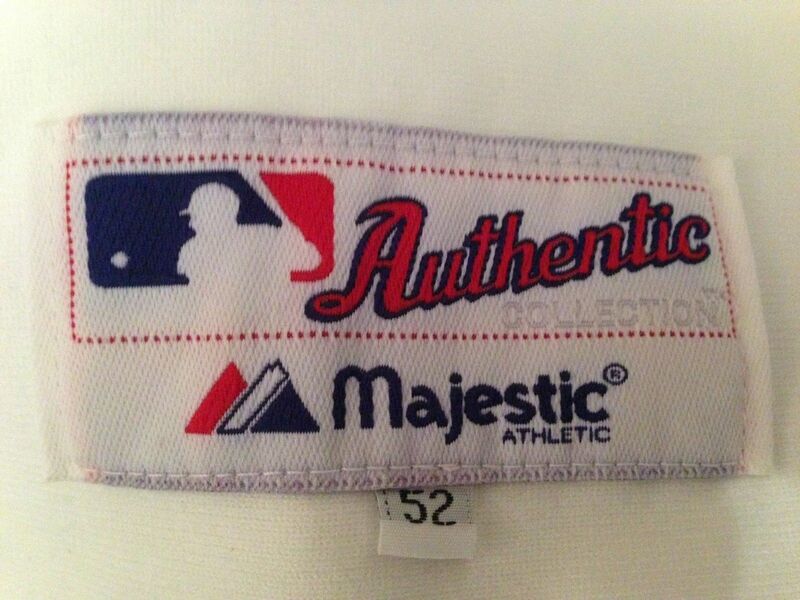 Awesome ripoff job, guys! 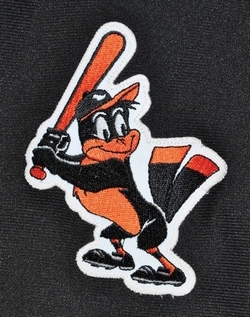 Maybe the bird was just too mean. 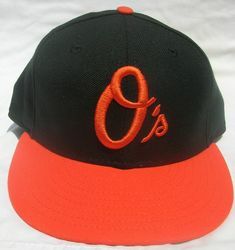 It's look softens a bit. 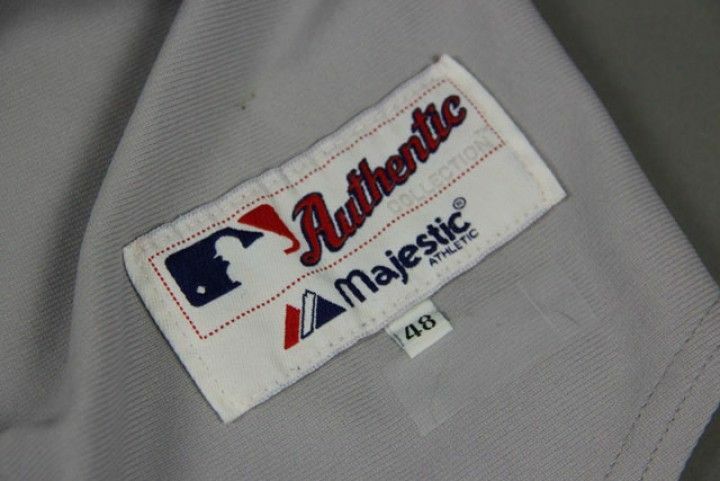 NOB sewn directly now. 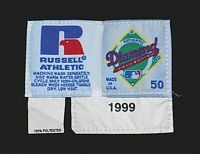 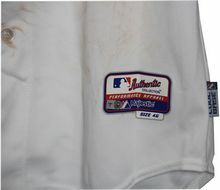 All Star game patch worn in 1999. 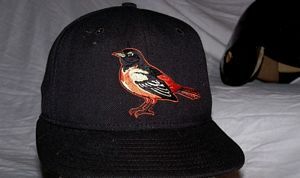 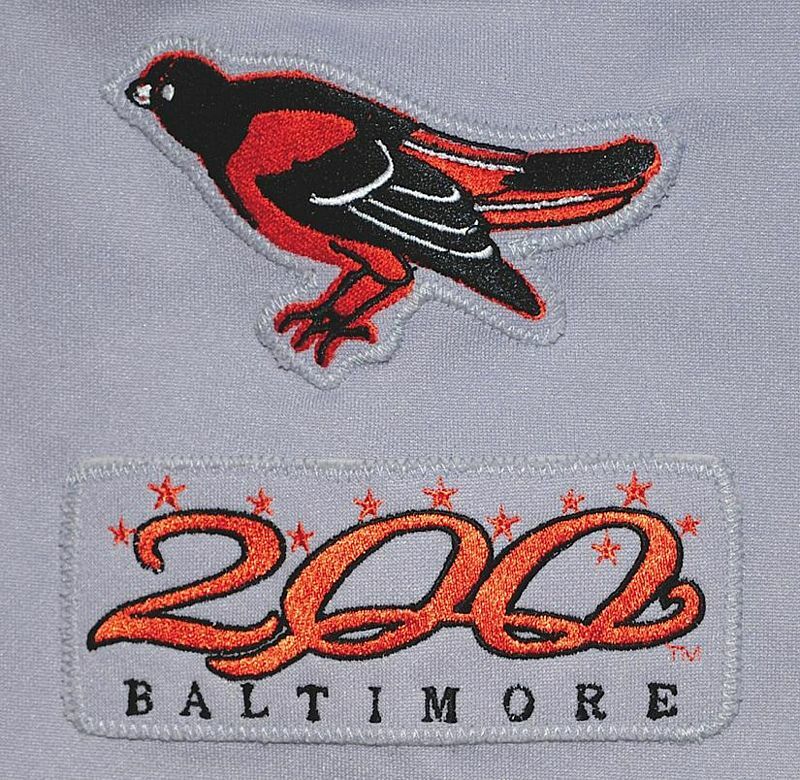 This 1999 alternate has the 1998 bird on the sleeve. 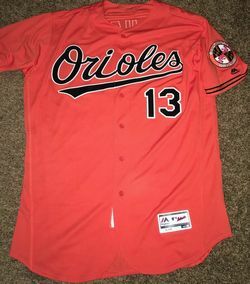 Not sure if it was changed during the season or not. Sleeve patch changed to a baby bird with a bat. 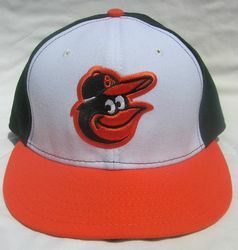 Home cap visor changed to orange. 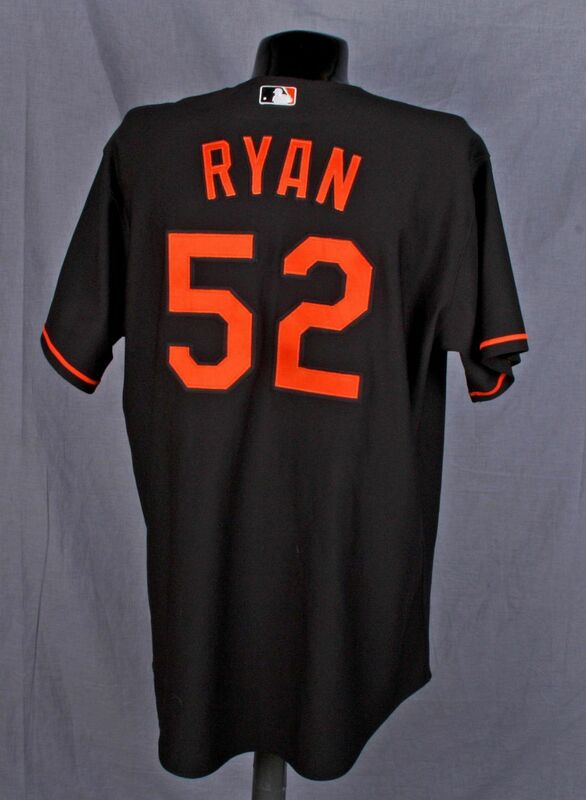 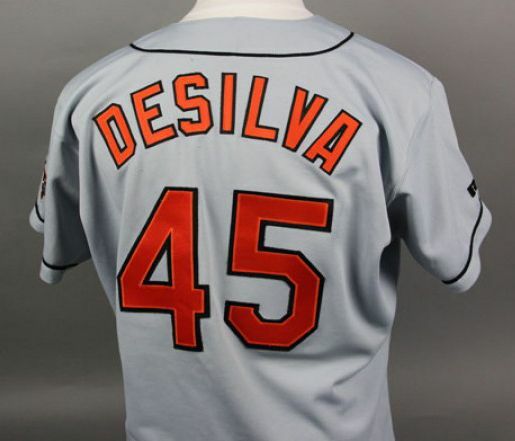 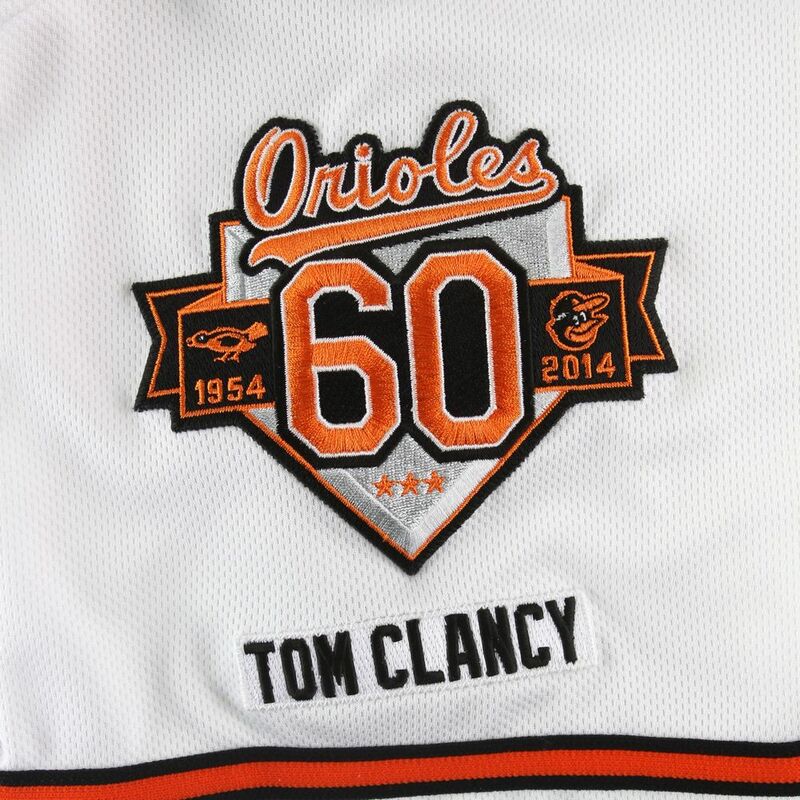 Home jersey script colors reverse to orange with black outline and front placket piping is gone. 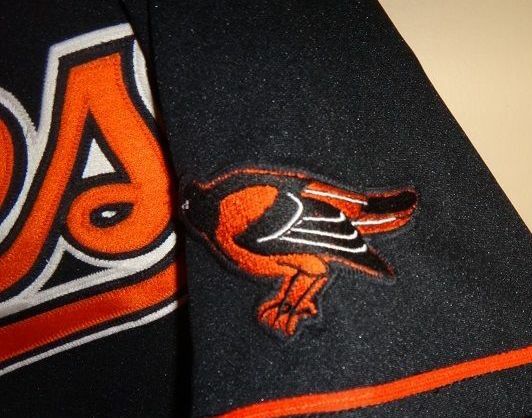 Bird sleeve patch removed from all jerseys. 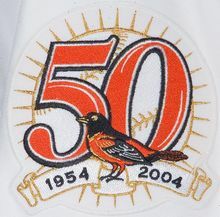 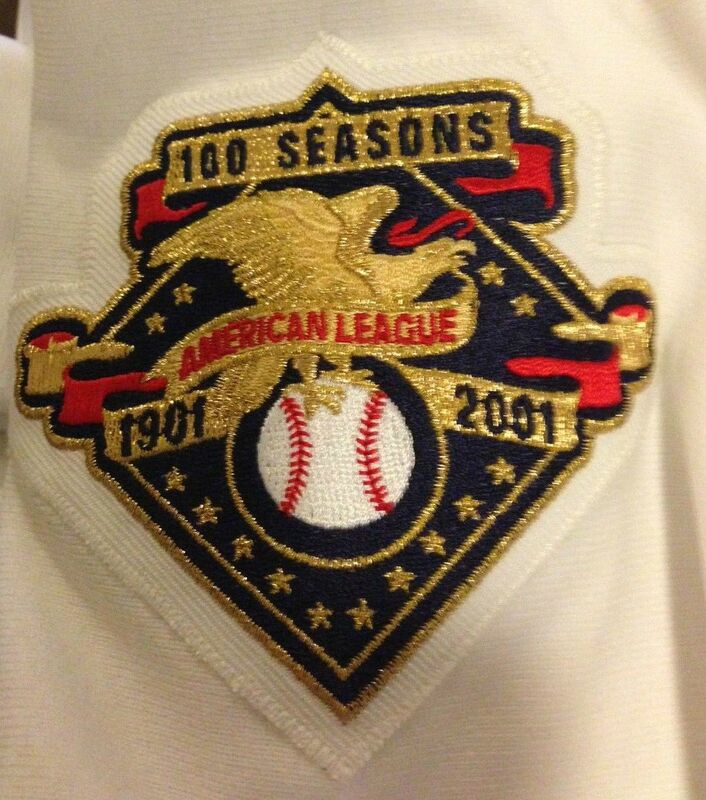 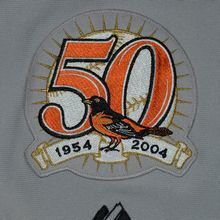 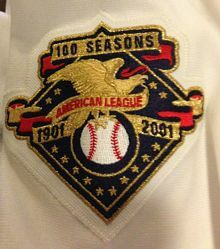 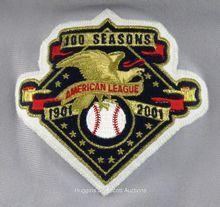 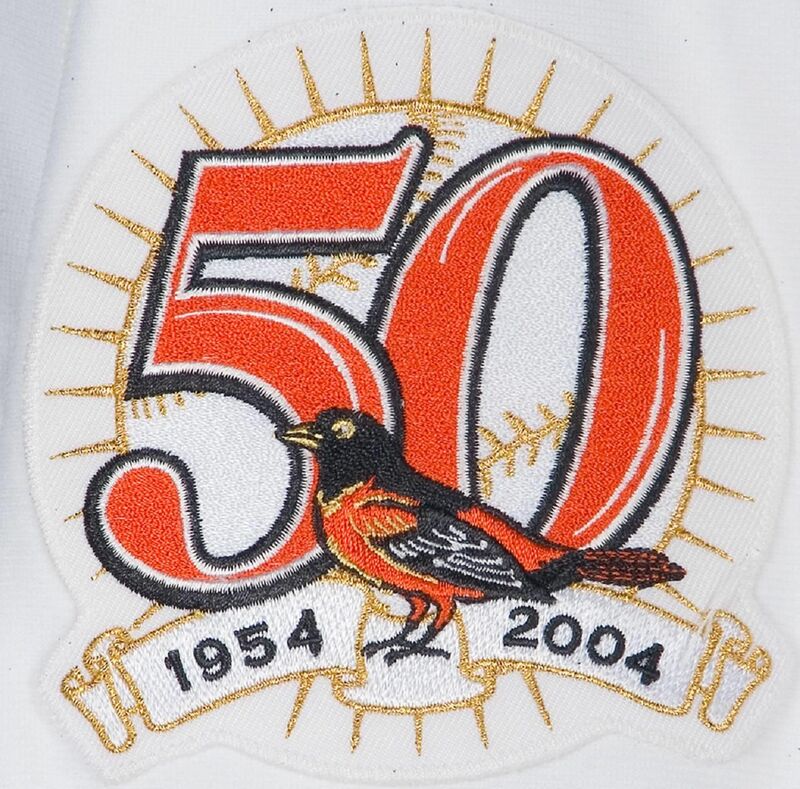 50th anniversary sleeve patch worn in 2004. 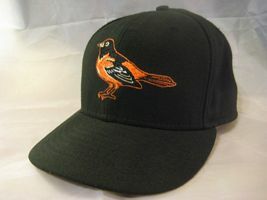 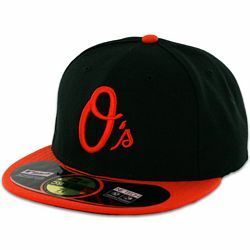 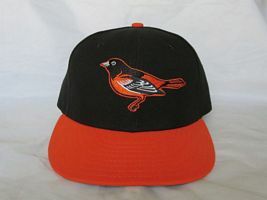 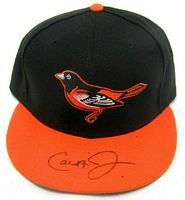 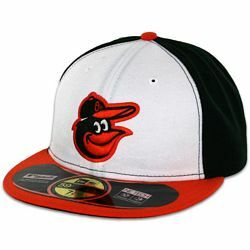 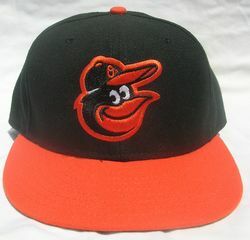 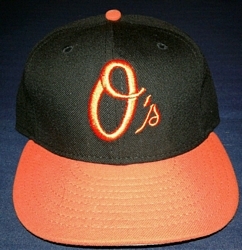 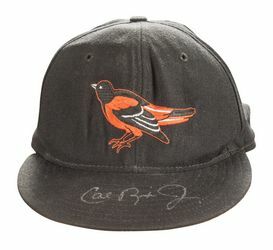 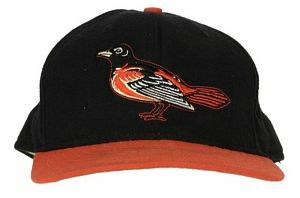 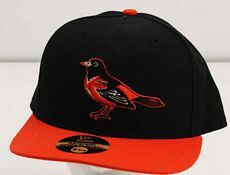 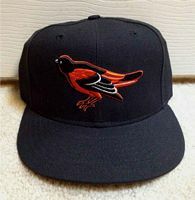 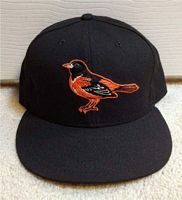 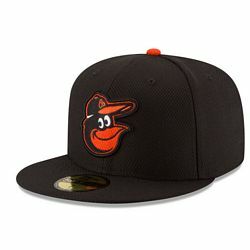 In 2005 a new "O's" cap is introduced for the alternate jersey. Cool Base jerseys begin to be used- home & alternates in 2007, road in 2008. Sleeve trim alterned on home jersey. 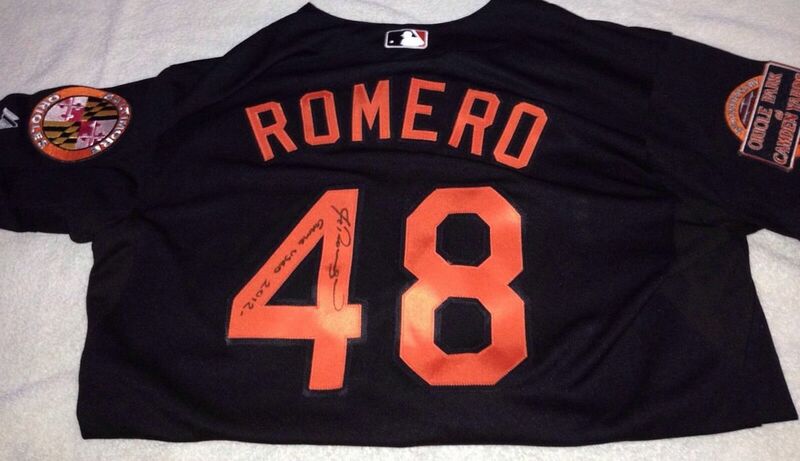 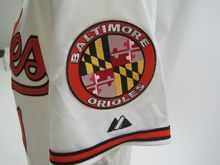 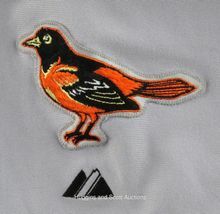 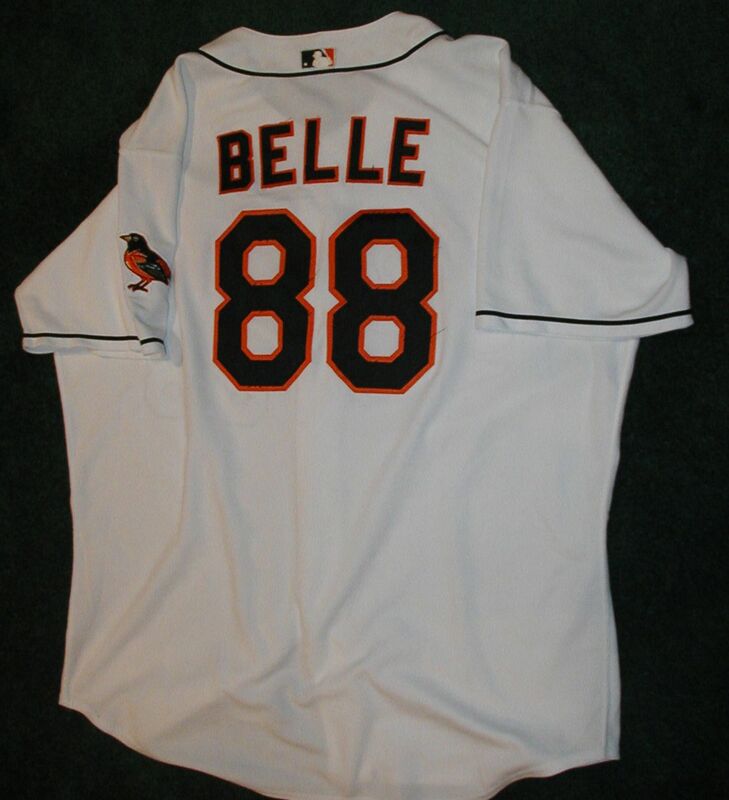 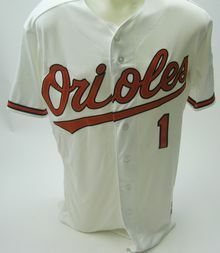 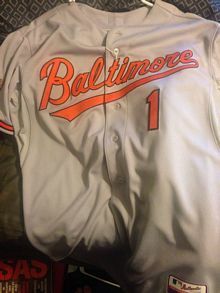 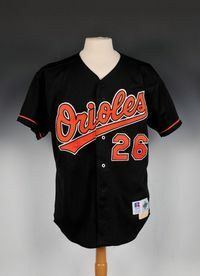 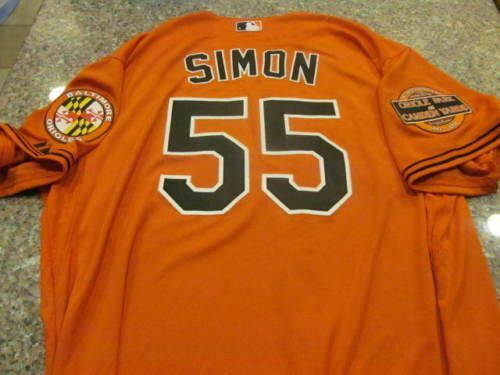 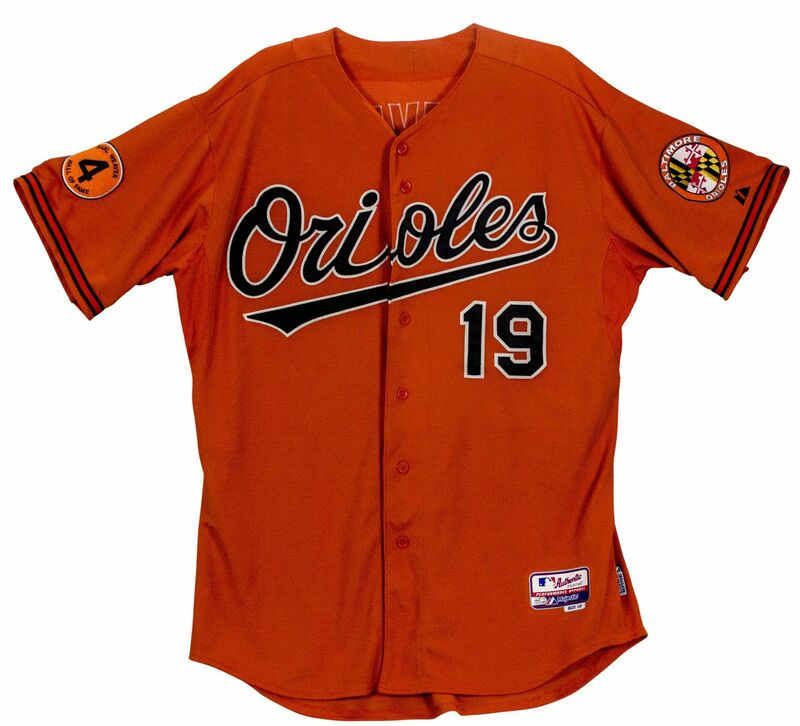 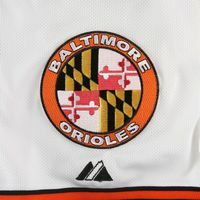 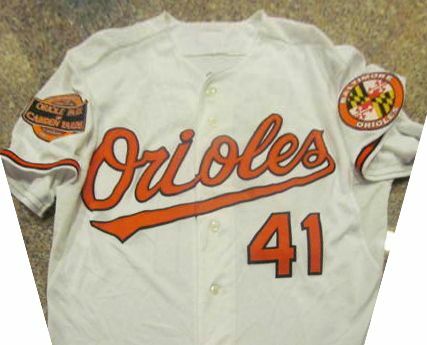 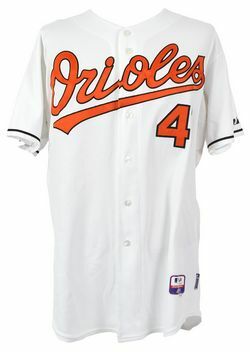 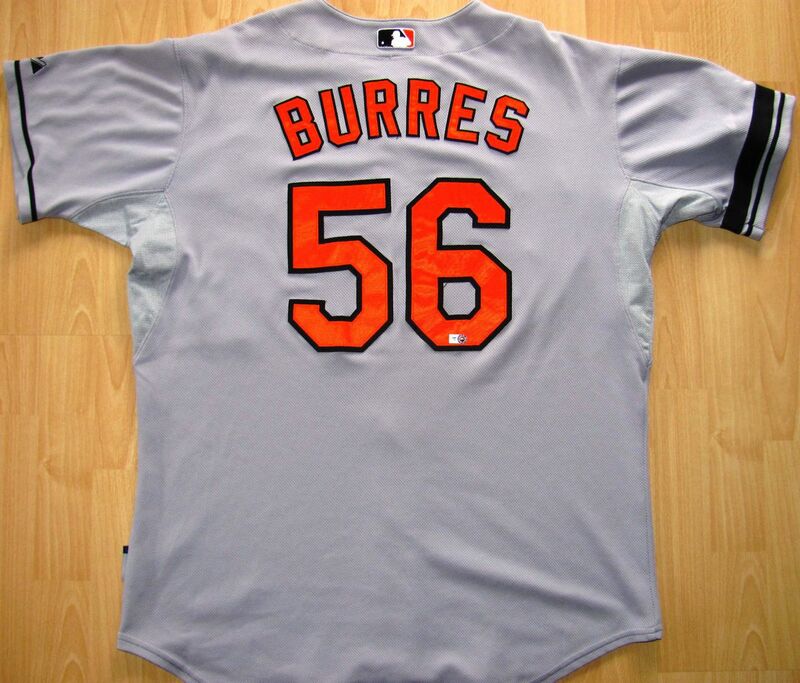 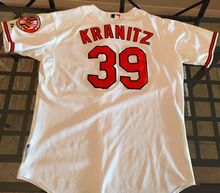 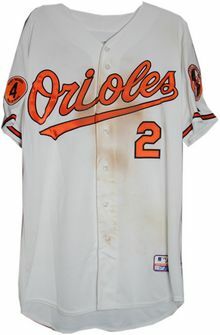 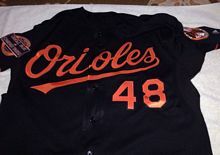 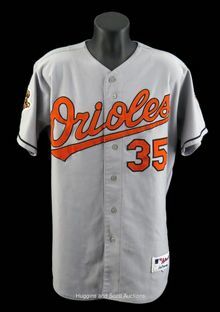 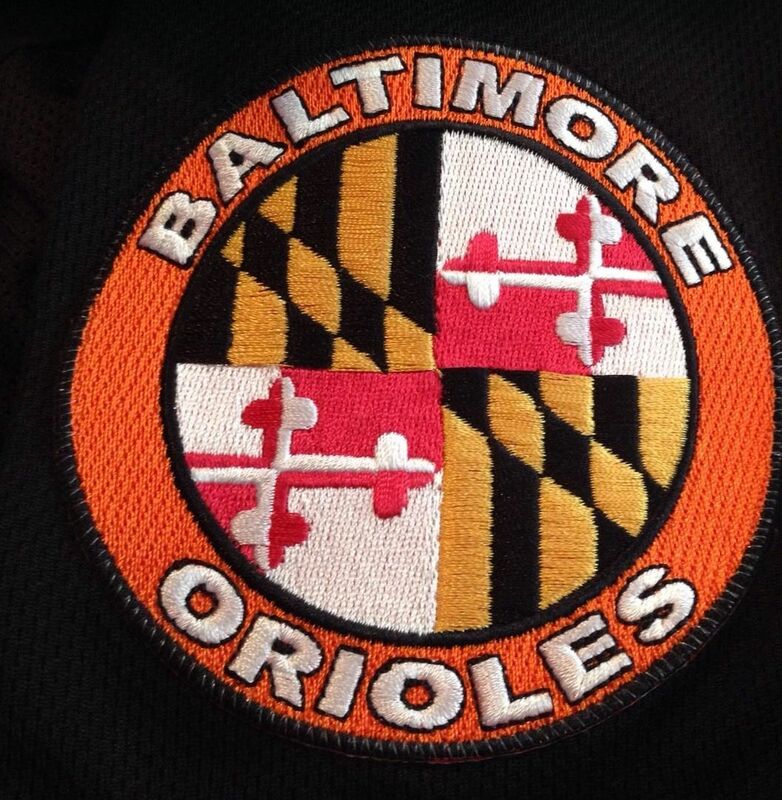 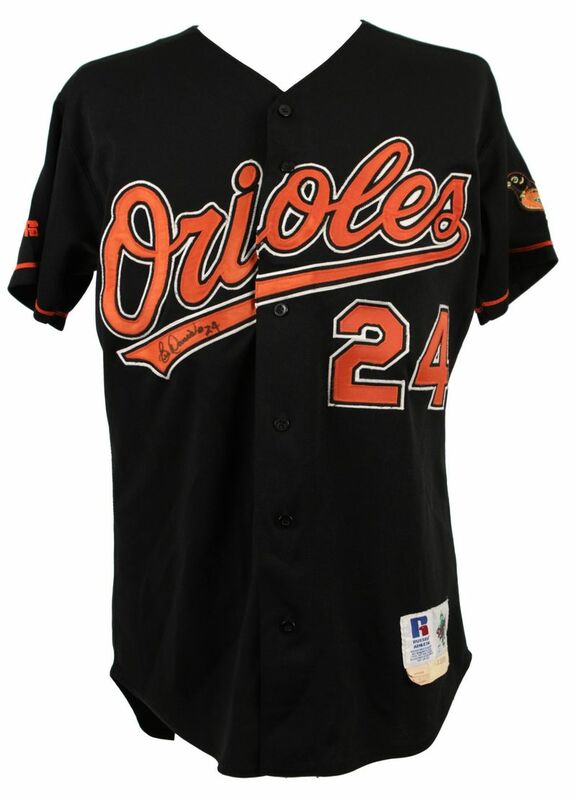 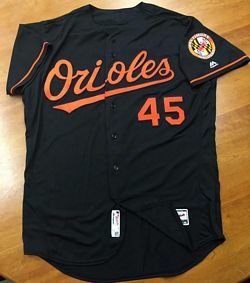 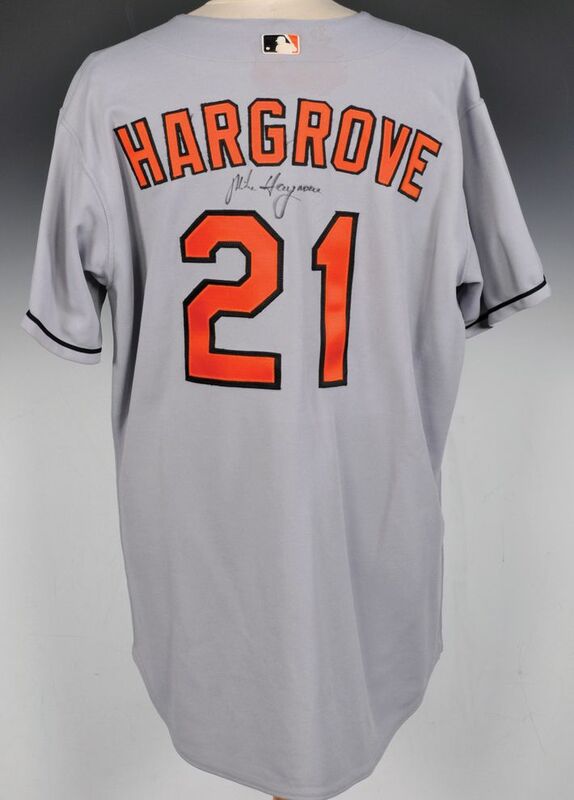 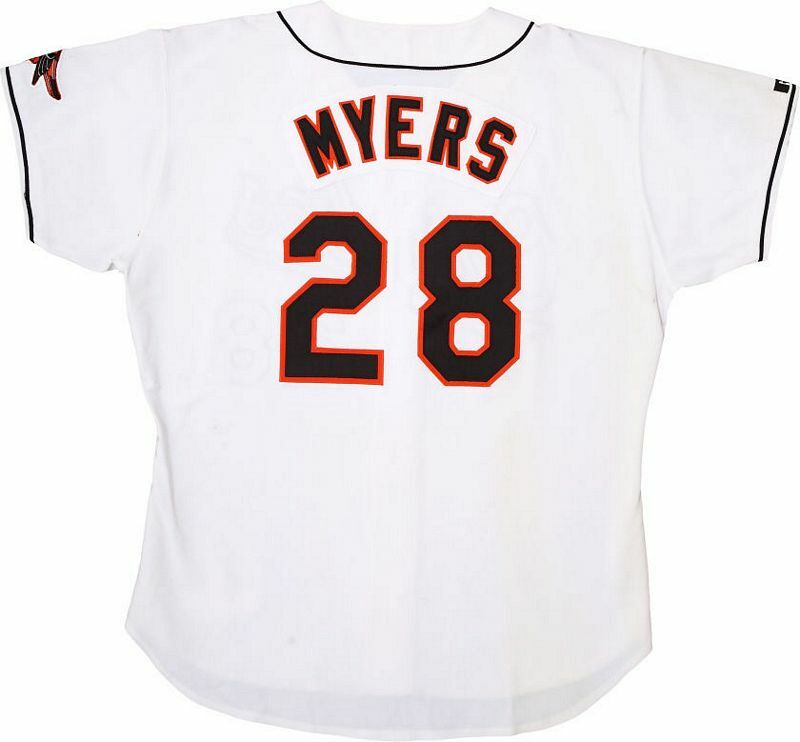 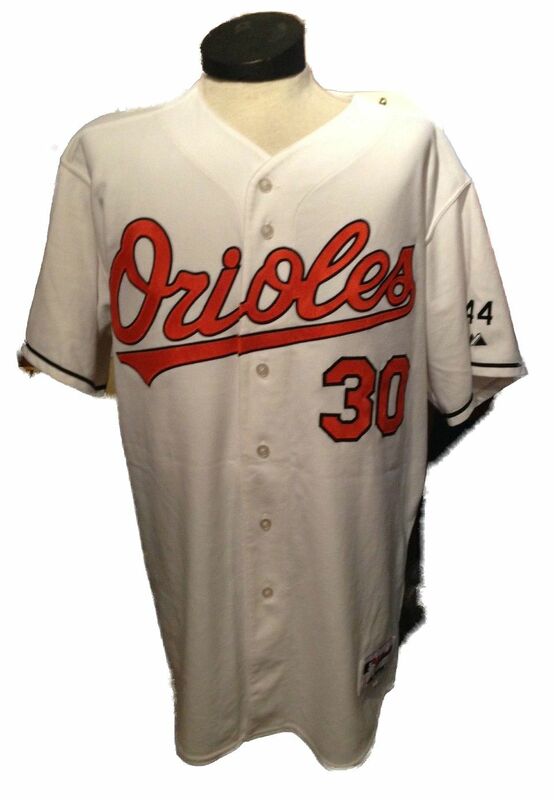 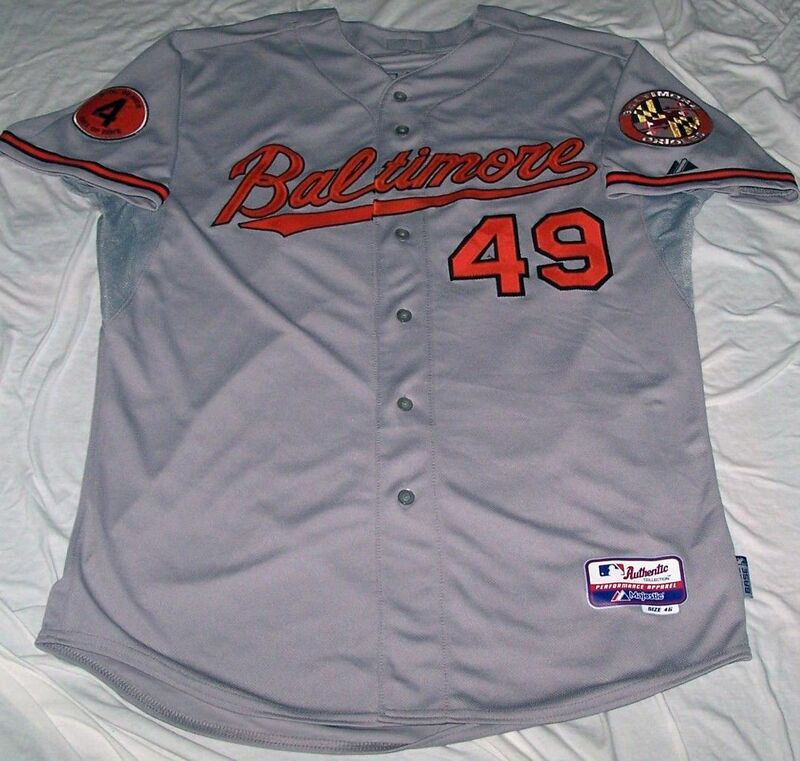 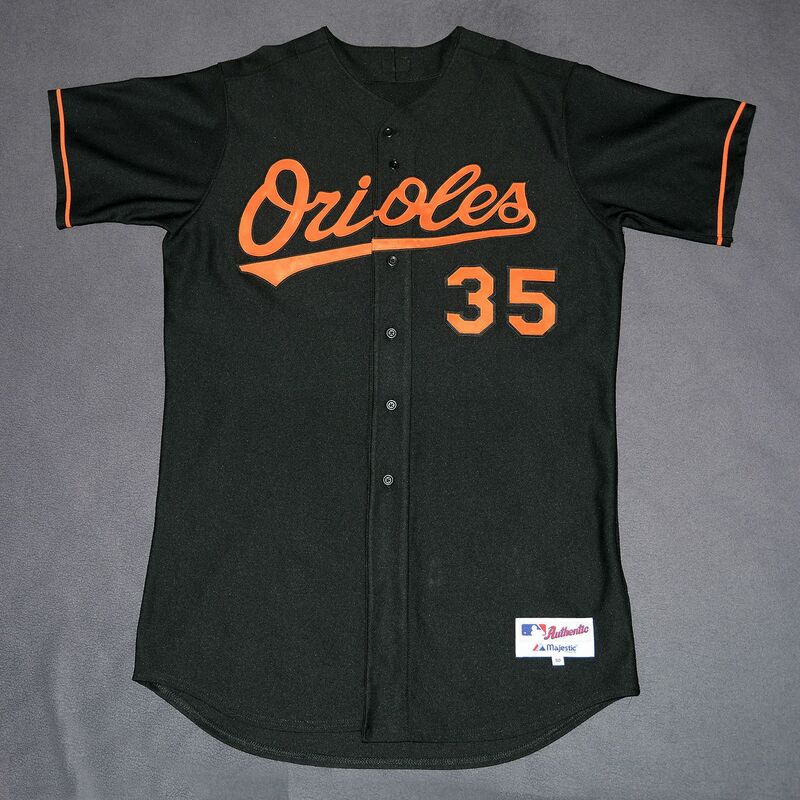 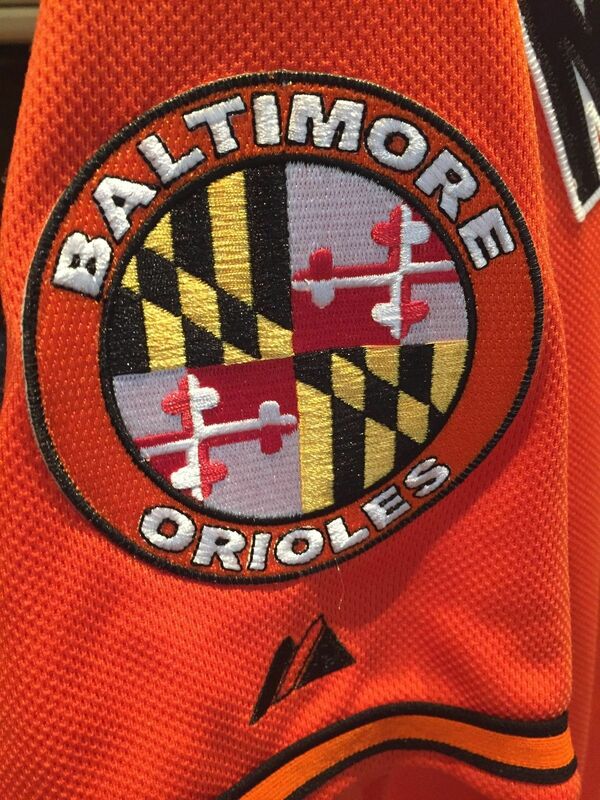 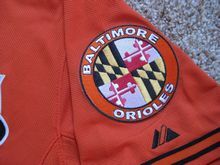 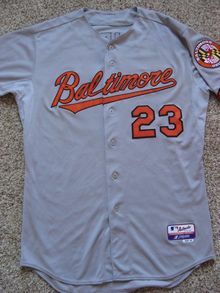 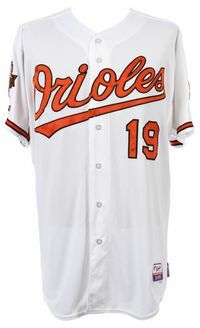 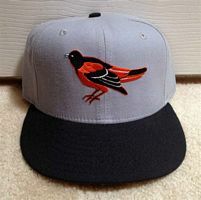 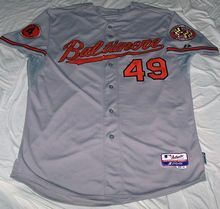 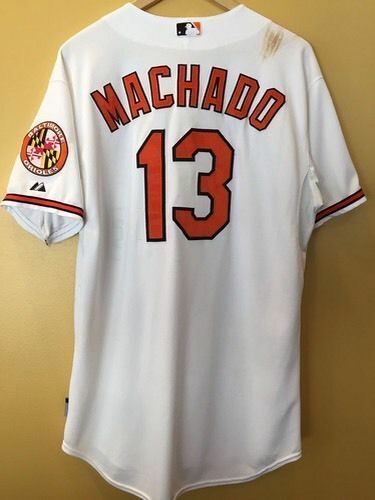 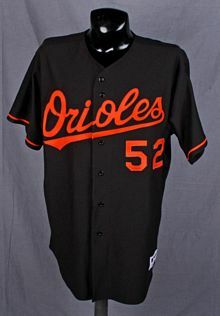 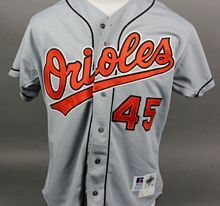 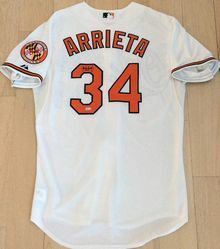 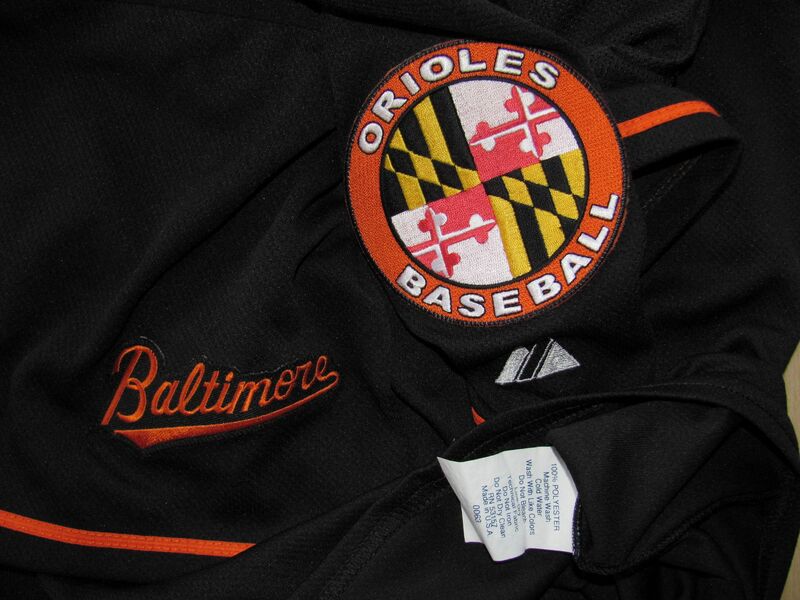 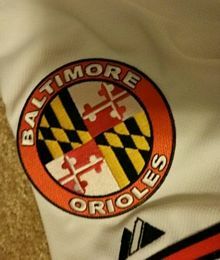 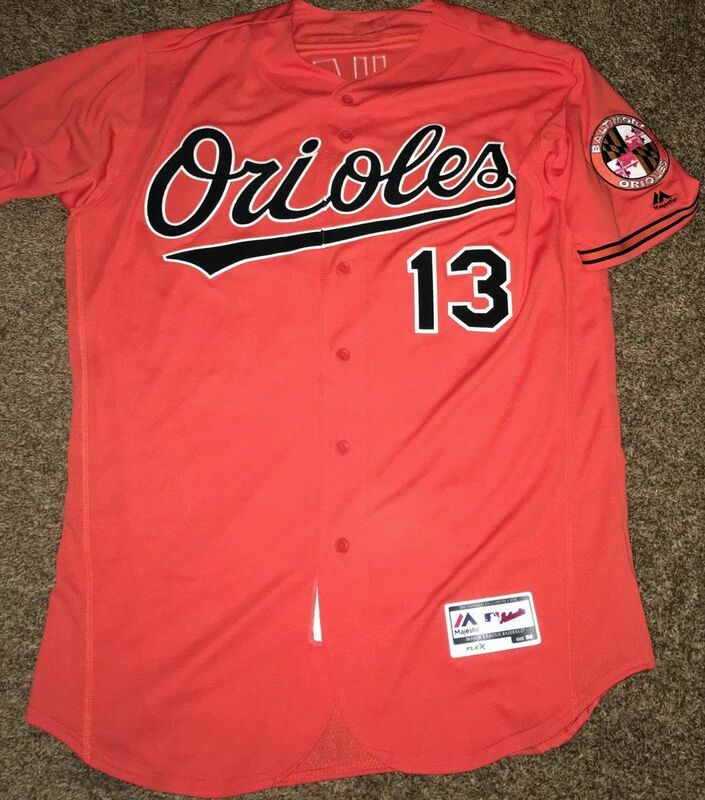 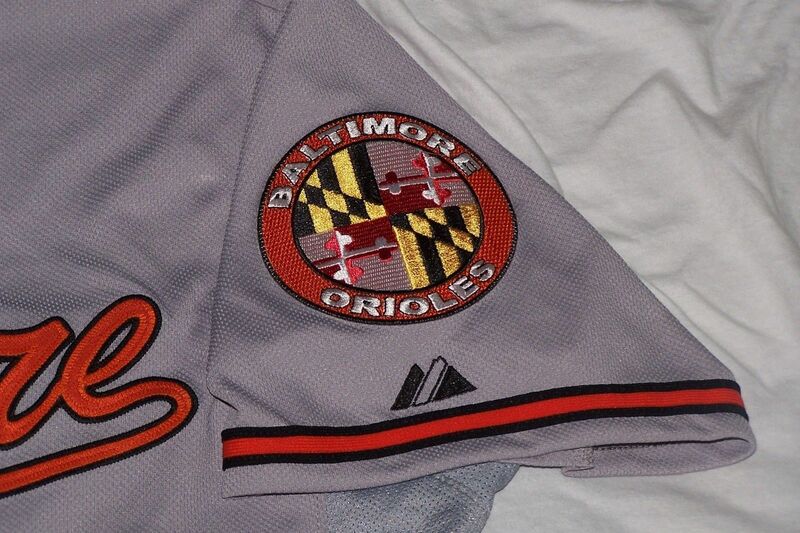 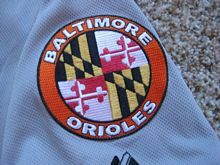 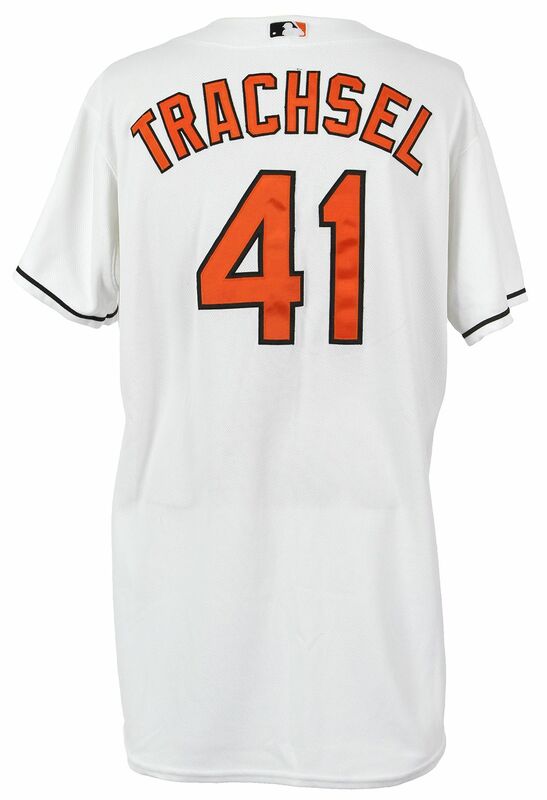 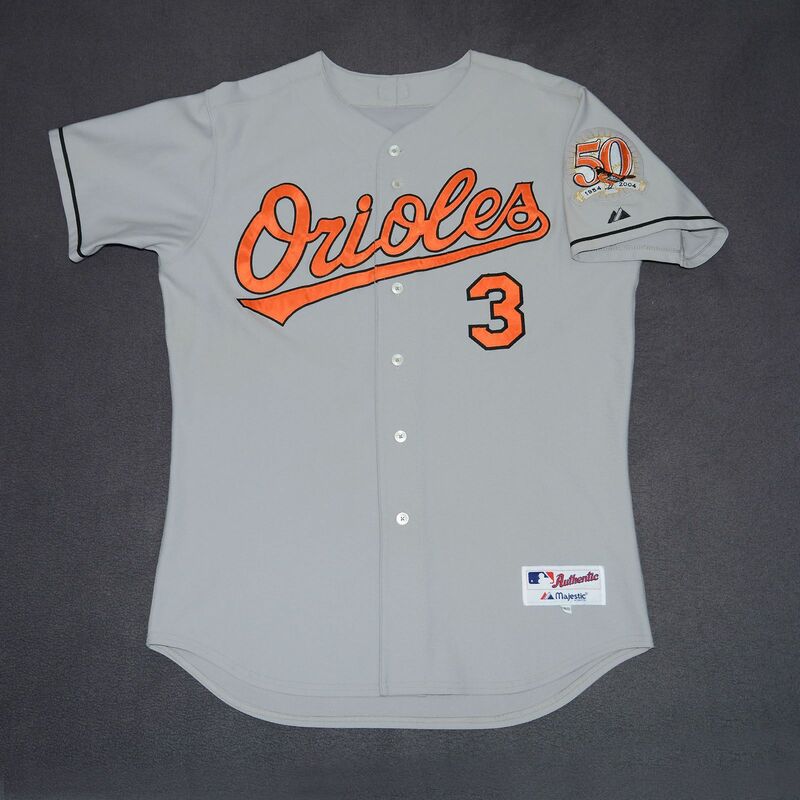 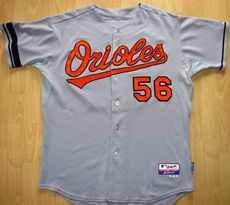 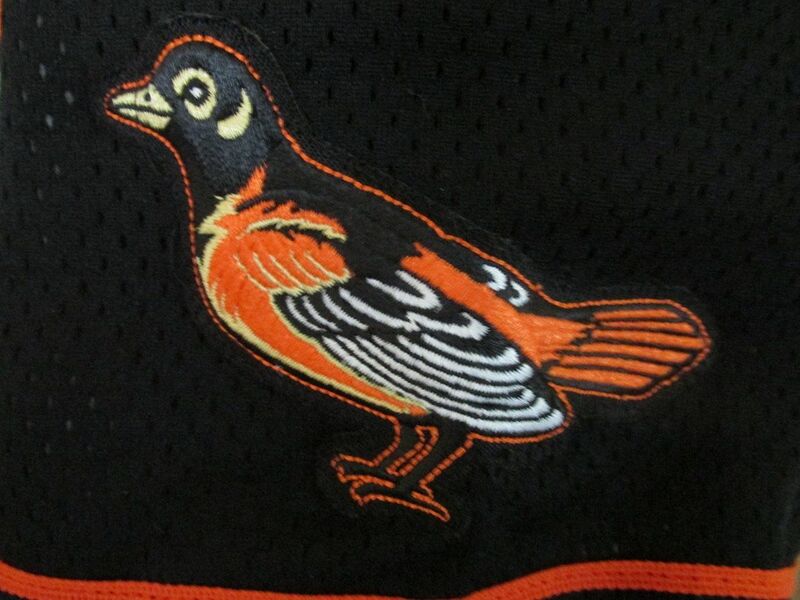 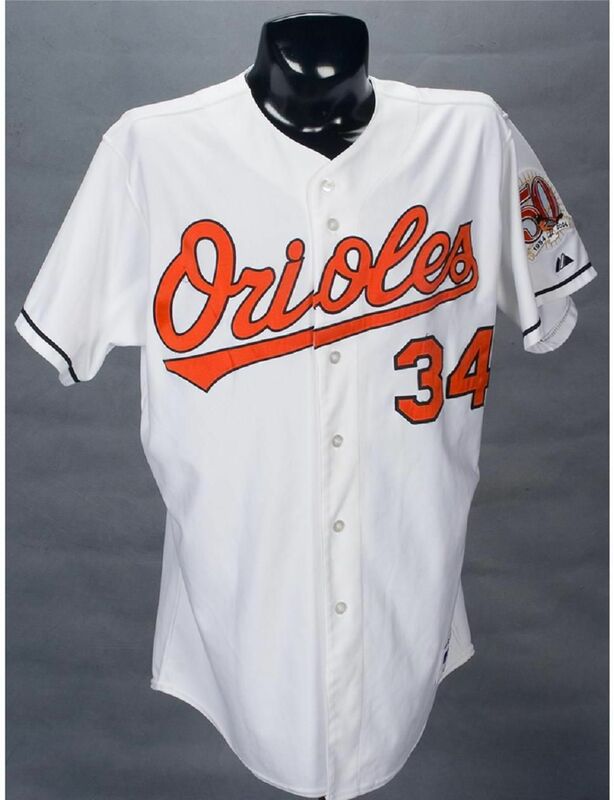 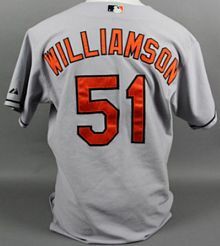 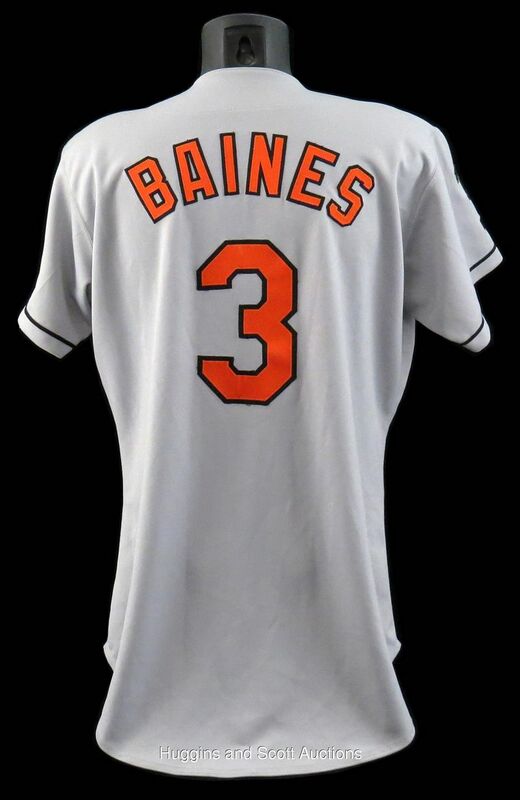 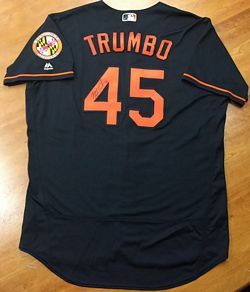 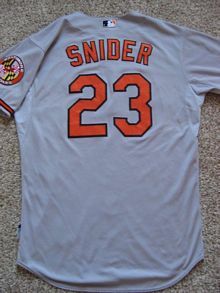 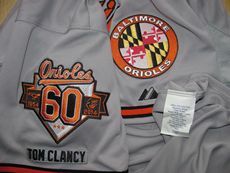 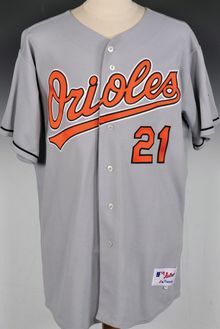 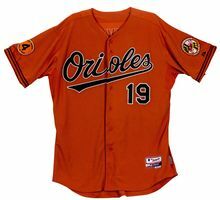 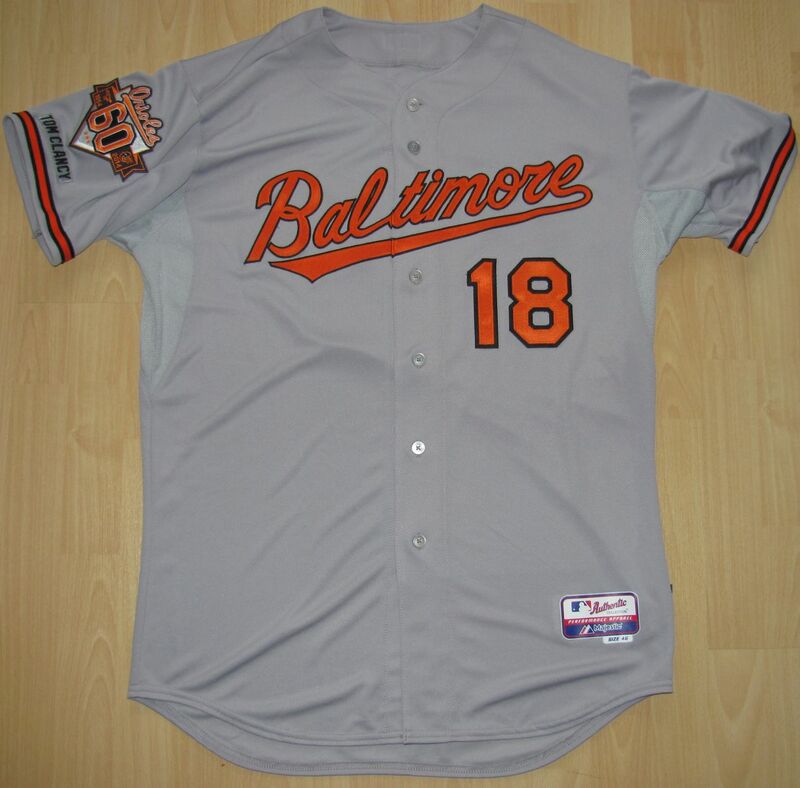 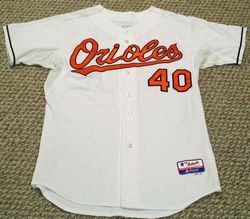 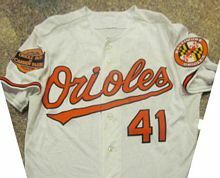 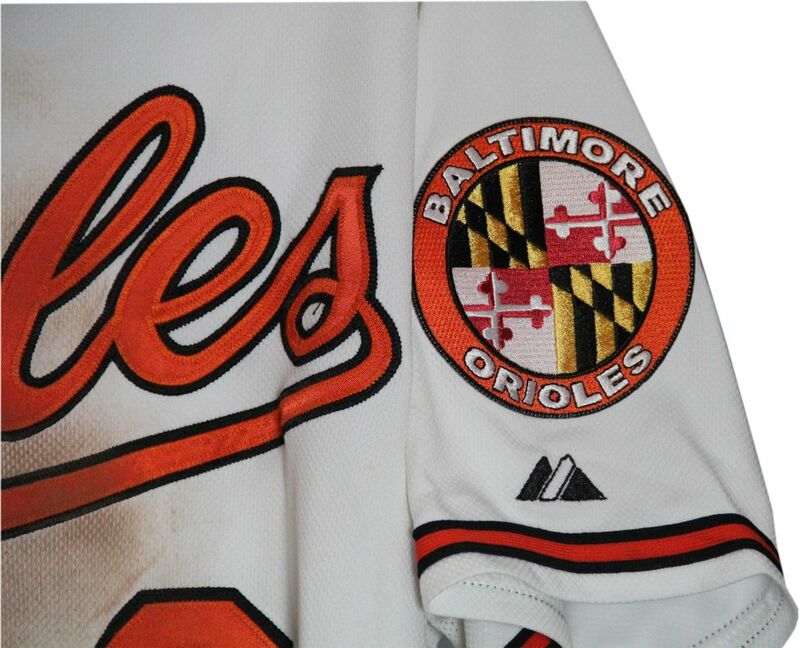 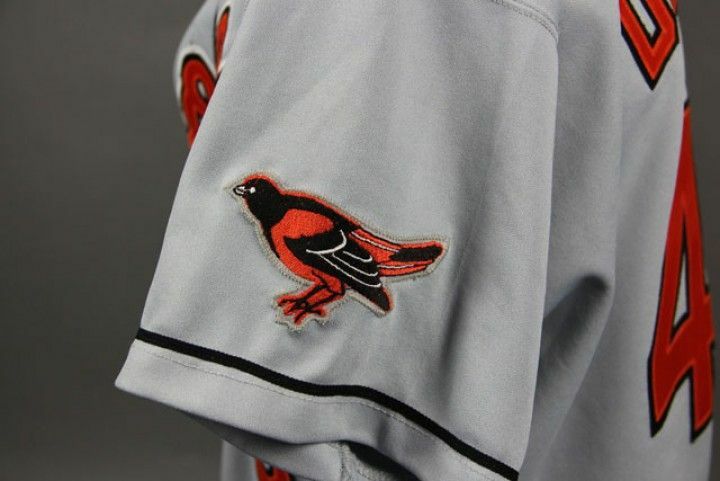 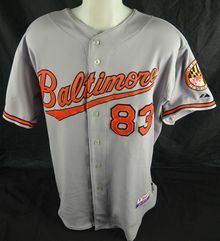 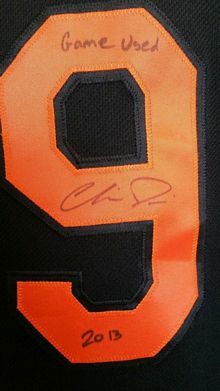 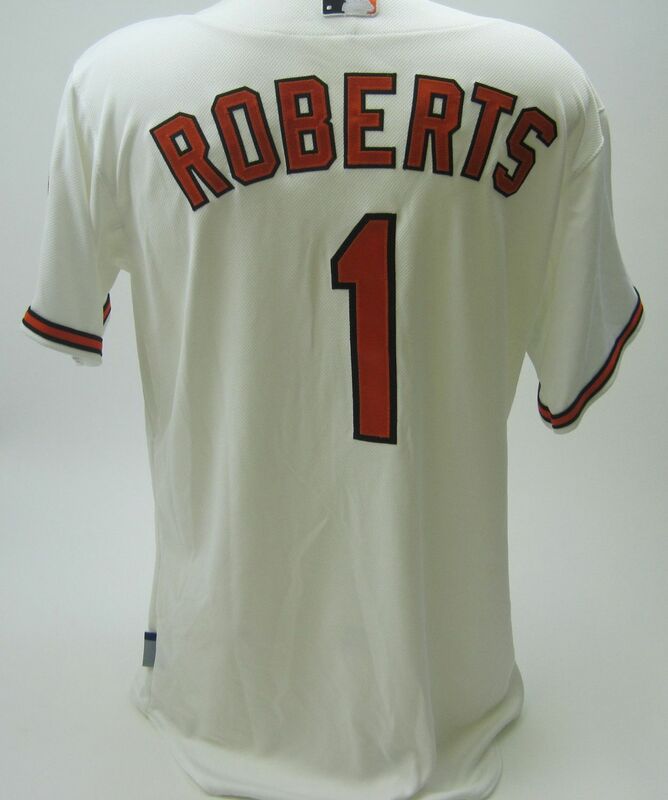 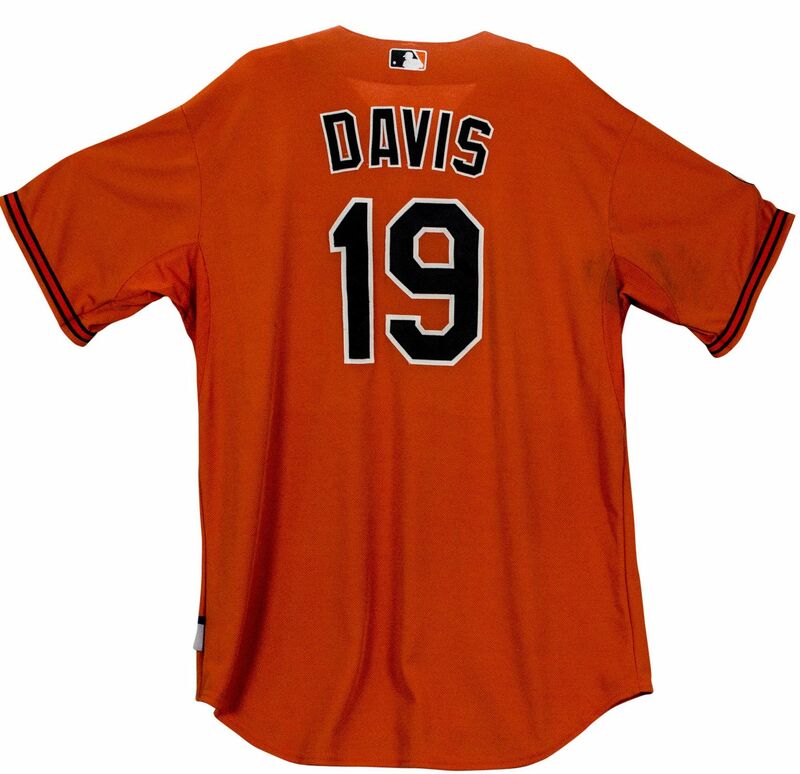 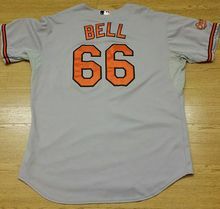 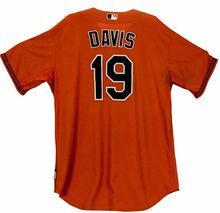 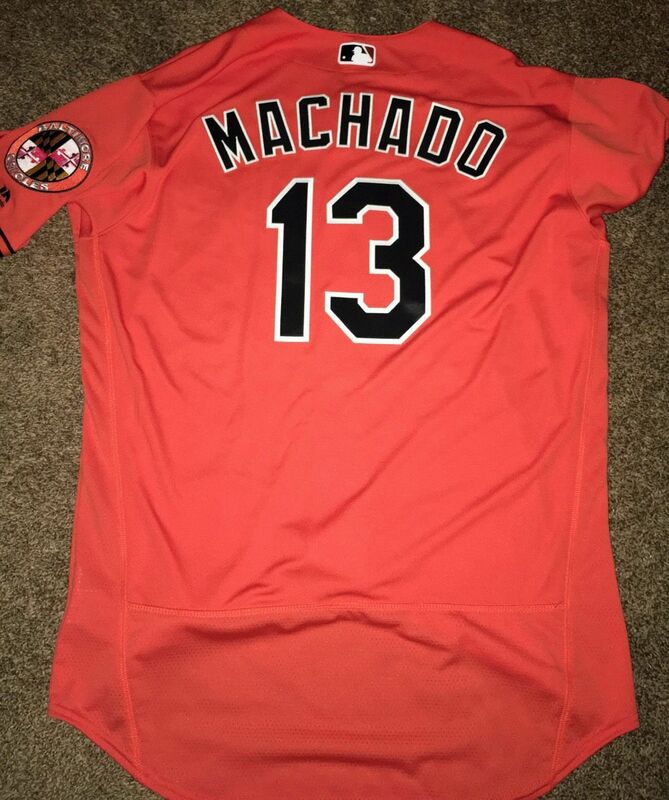 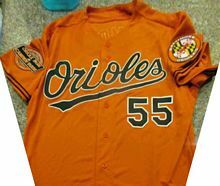 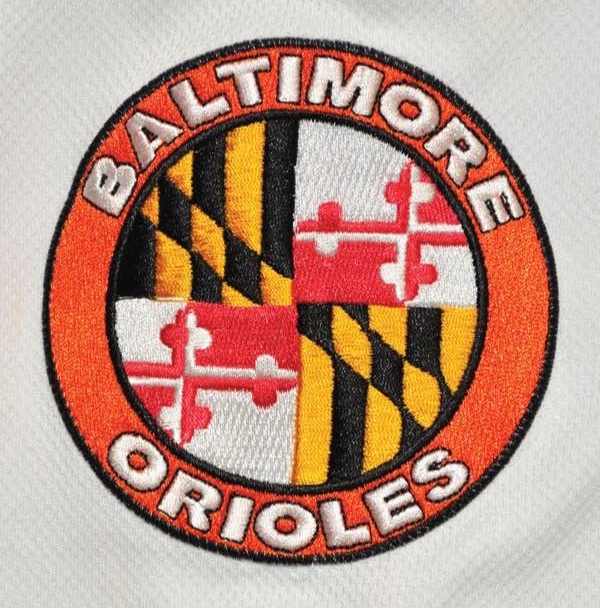 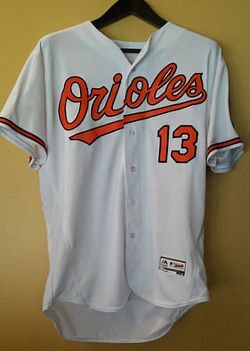 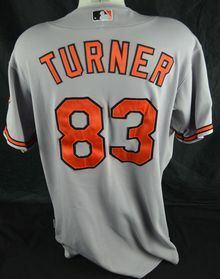 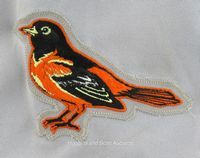 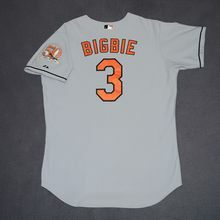 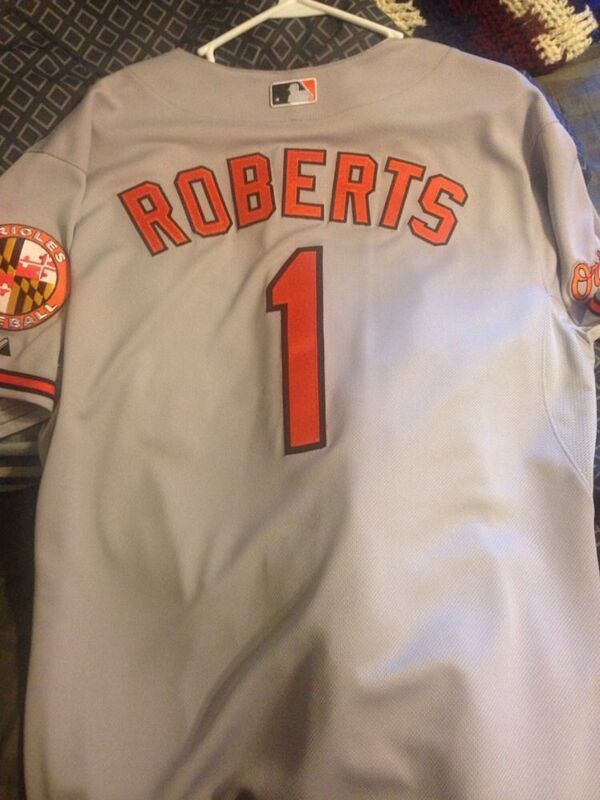 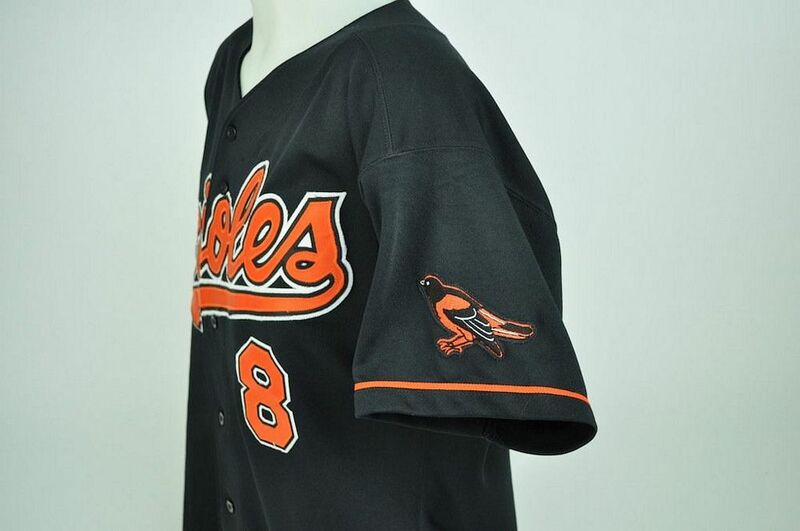 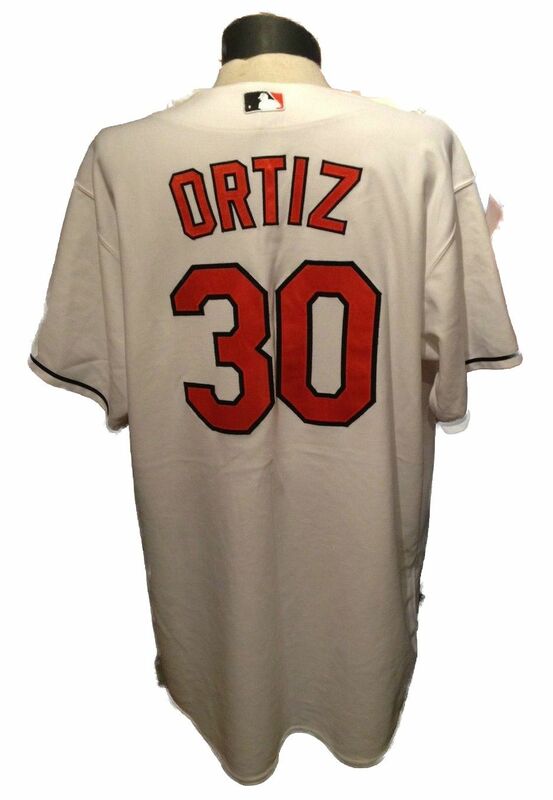 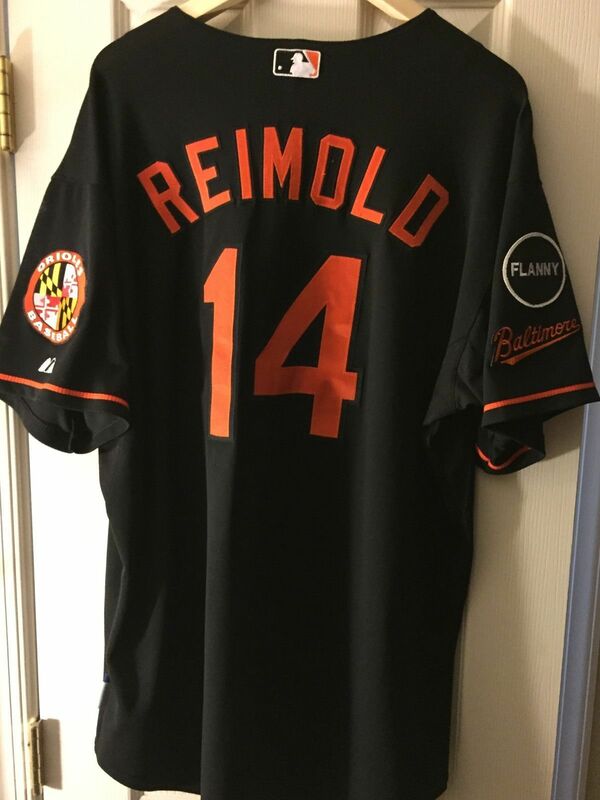 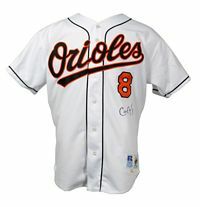 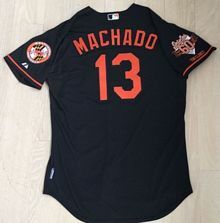 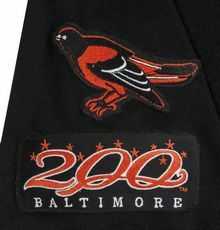 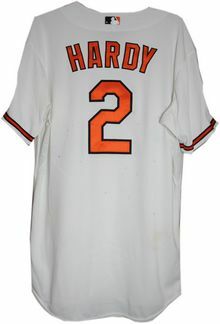 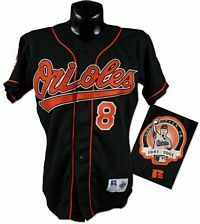 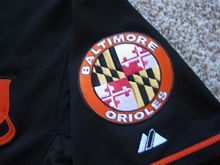 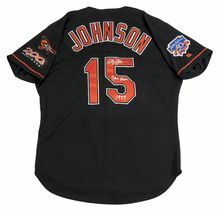 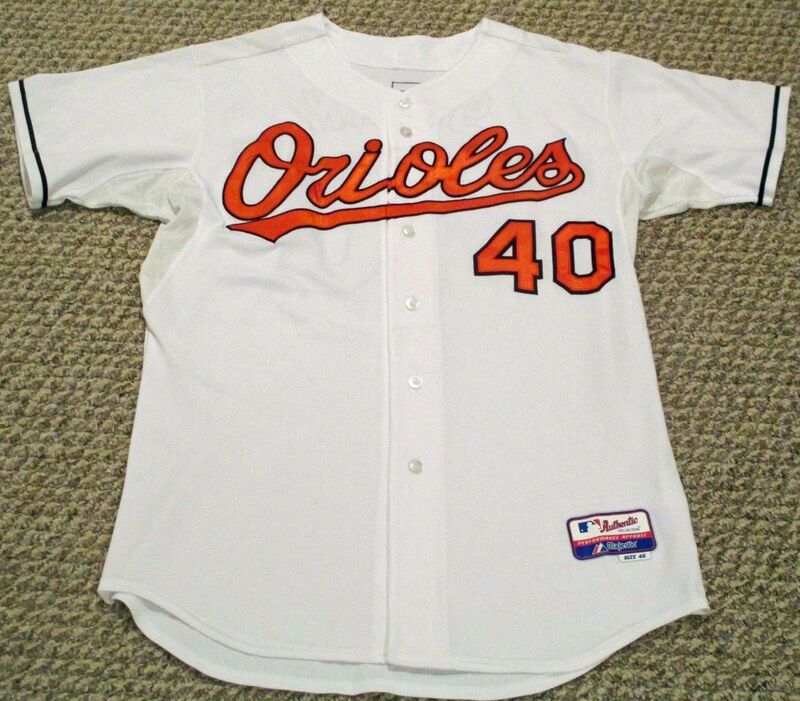 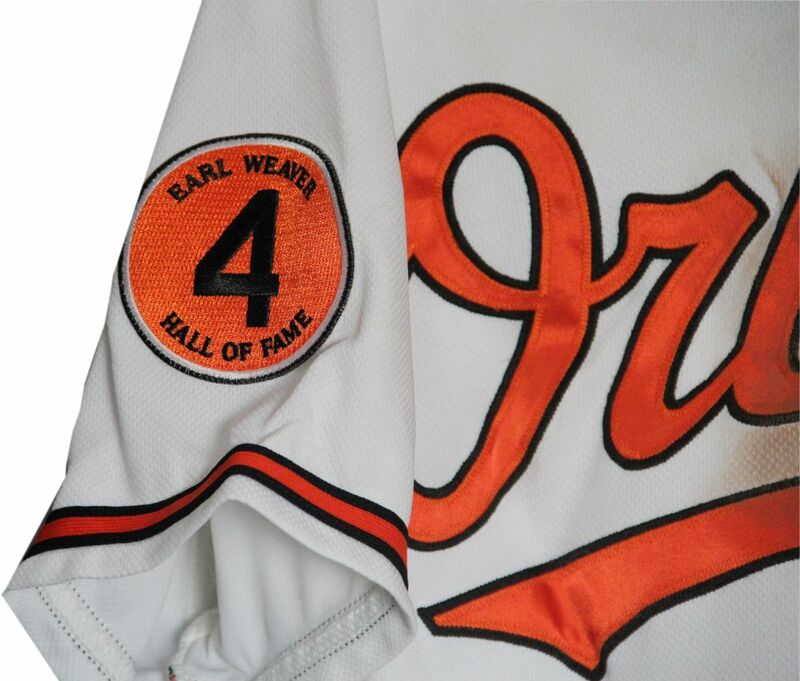 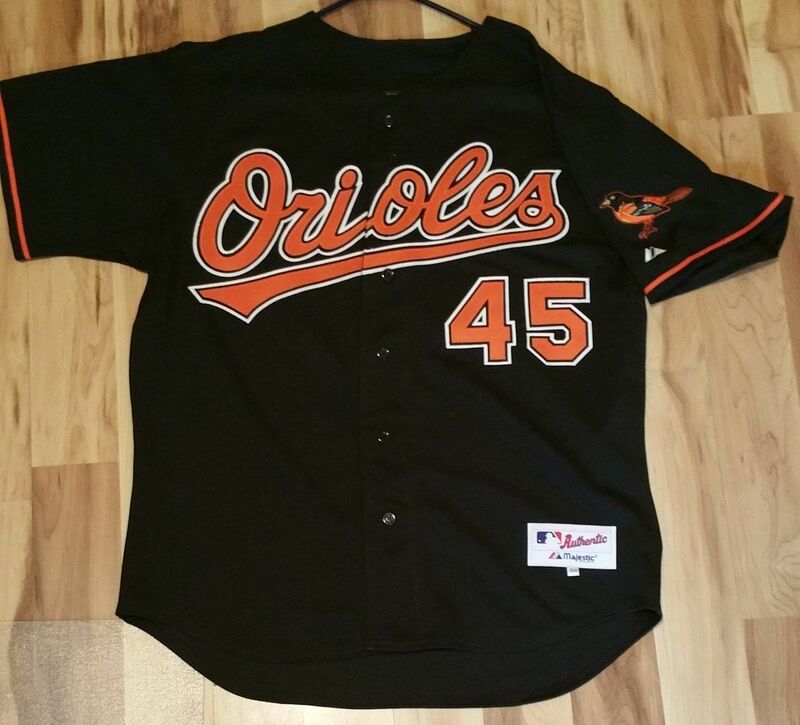 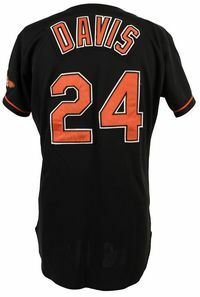 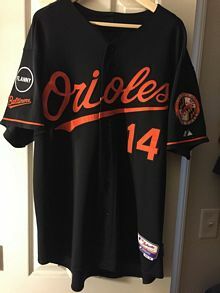 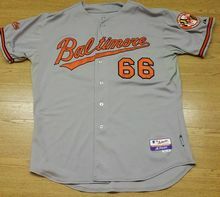 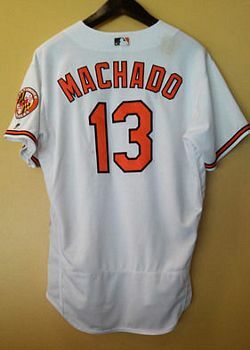 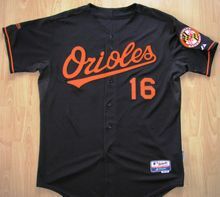 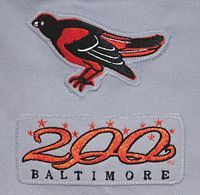 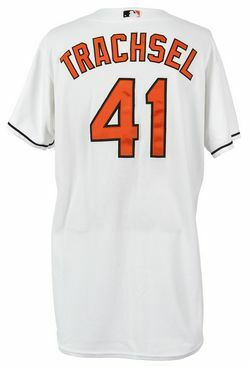 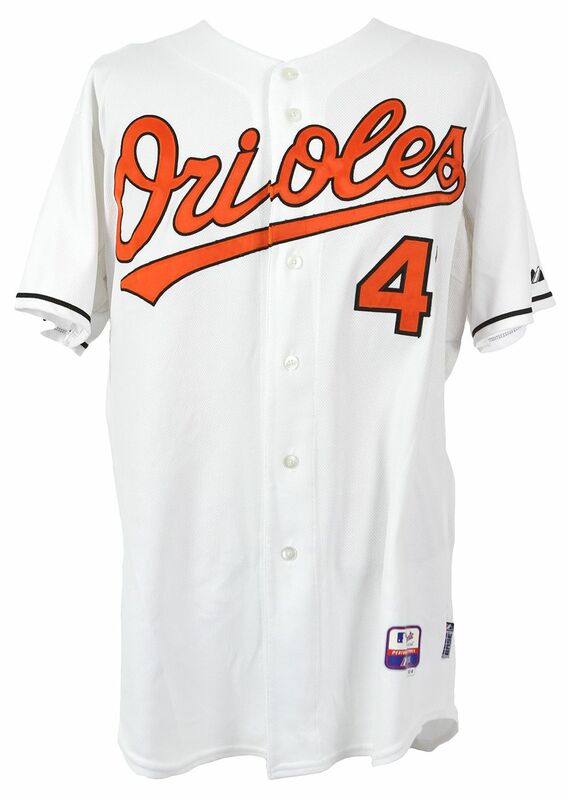 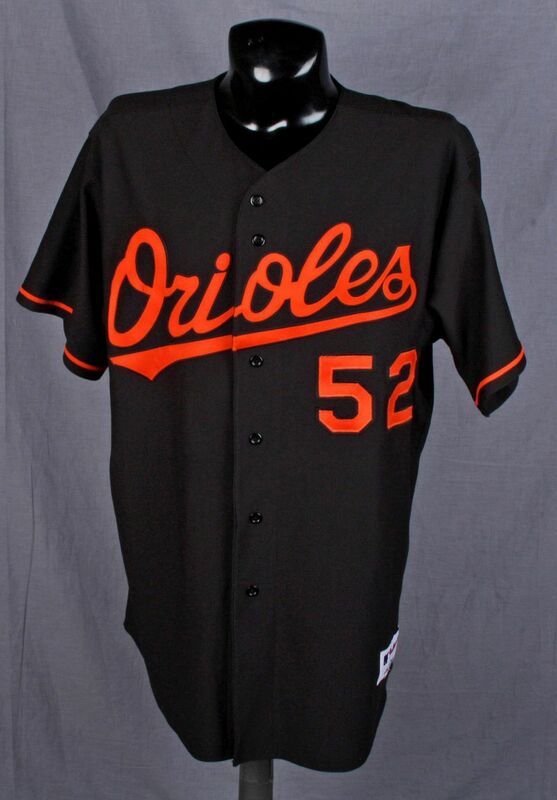 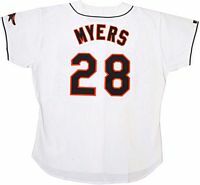 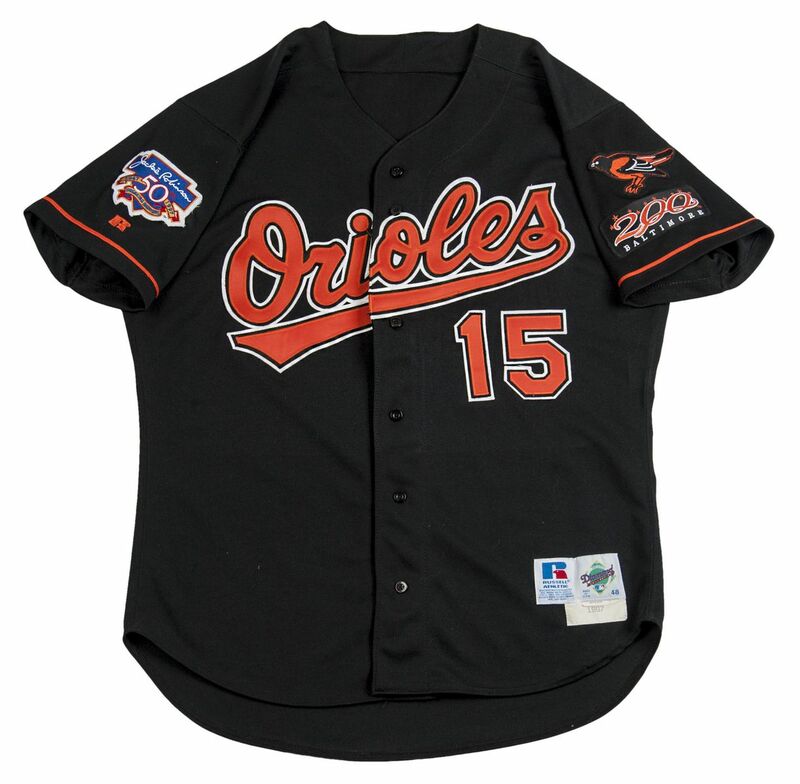 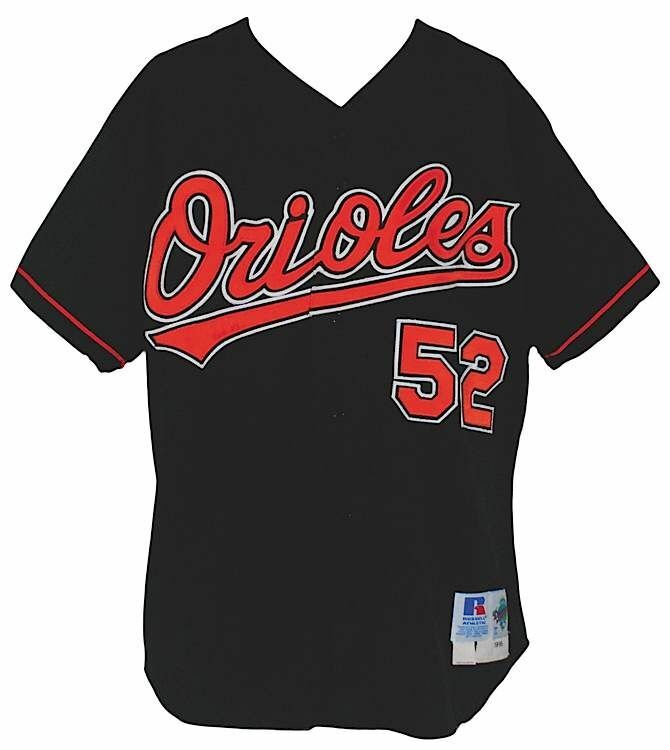 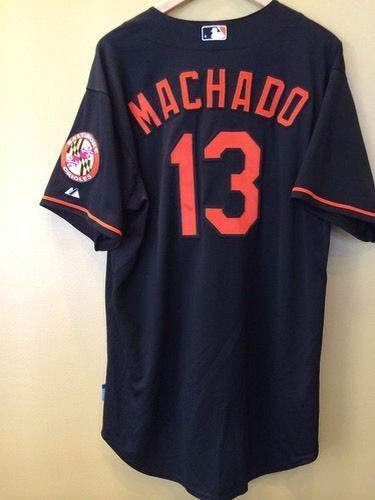 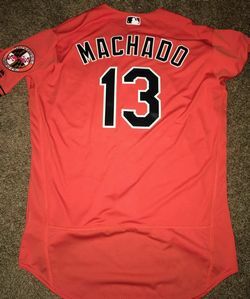 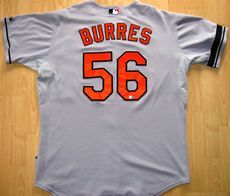 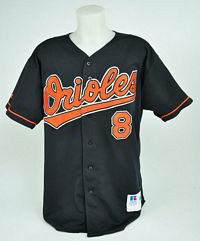 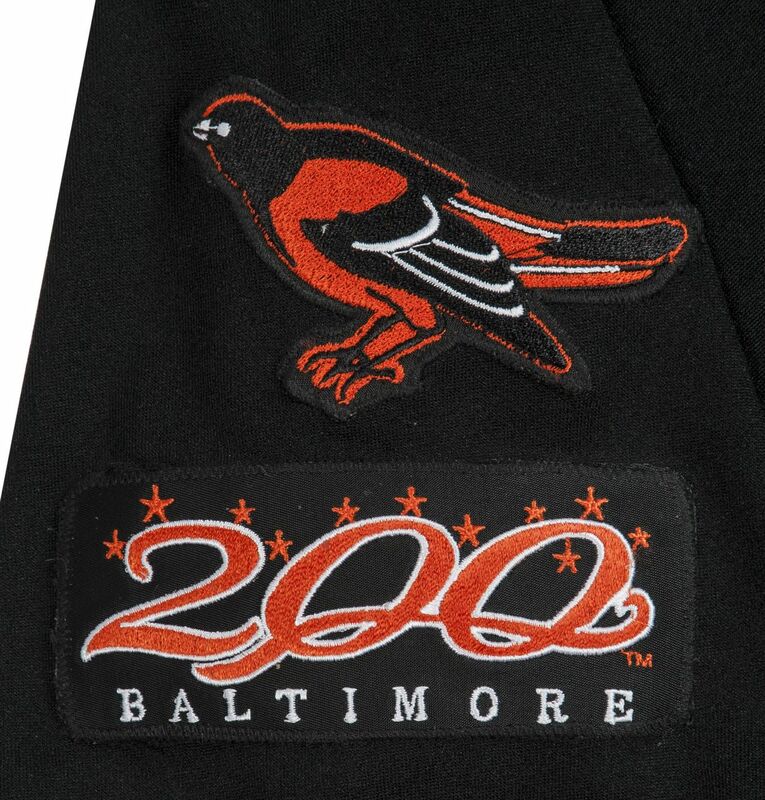 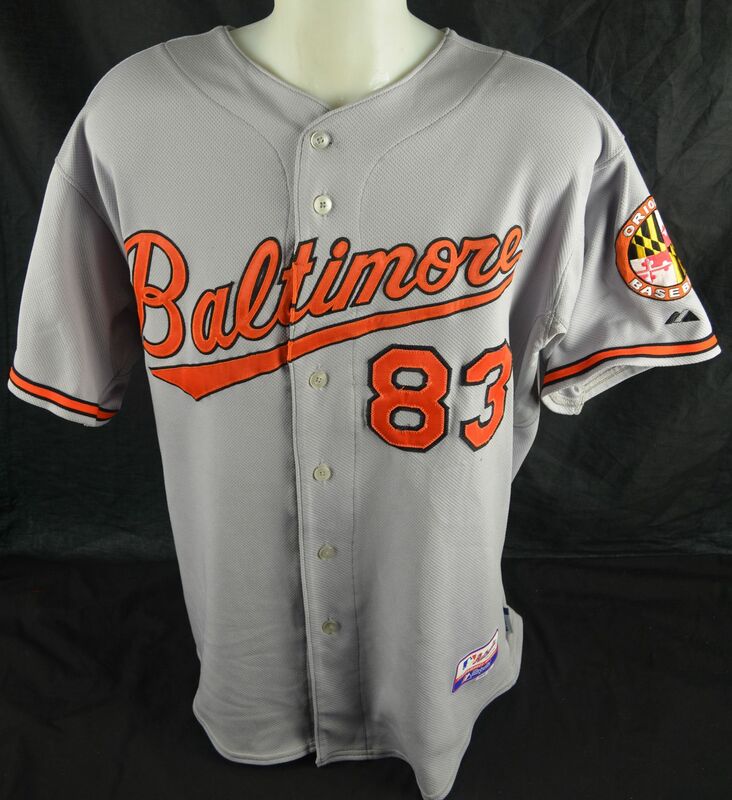 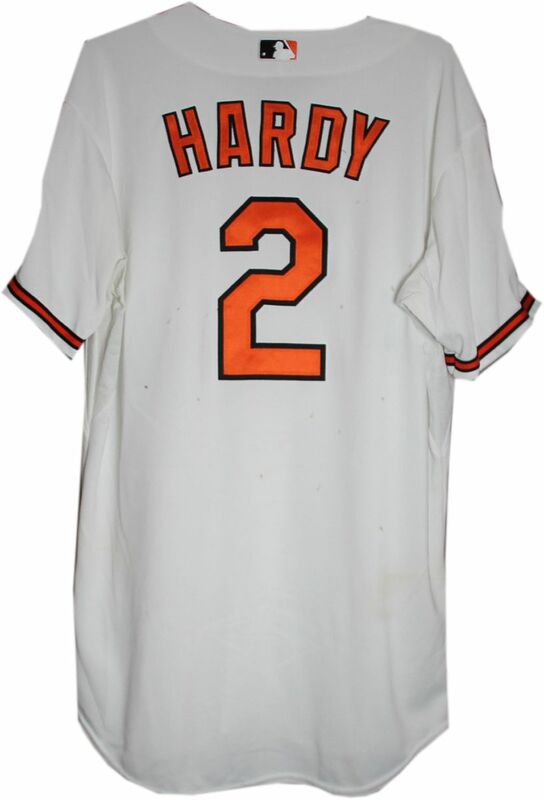 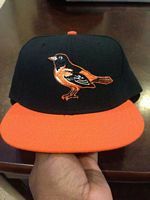 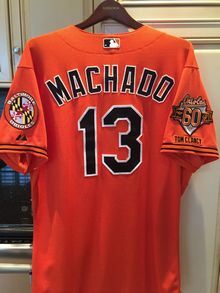 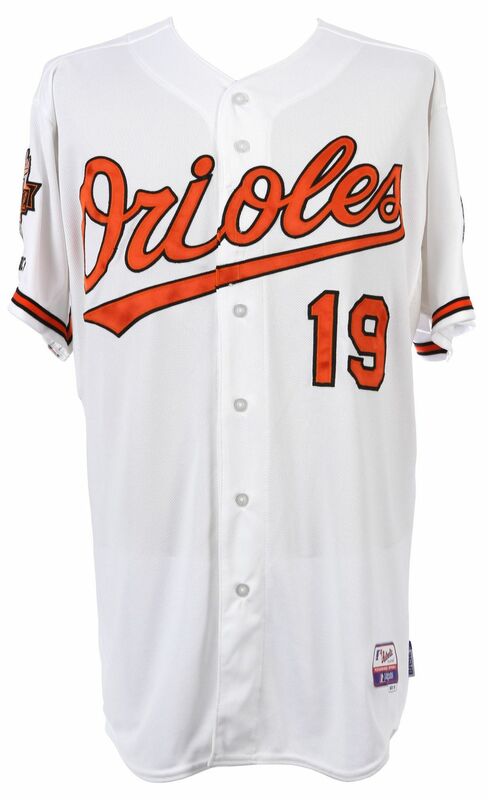 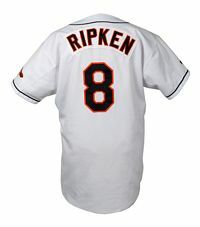 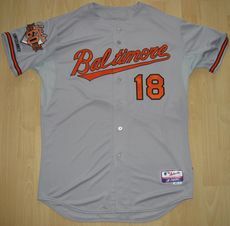 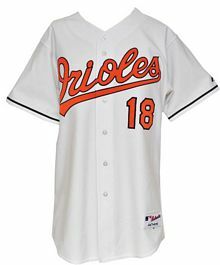 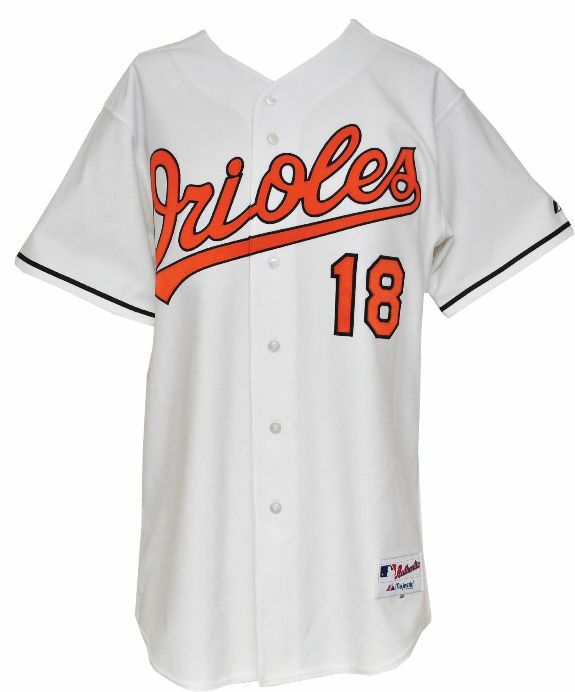 On road jersey, script changed to "Baltimore", sleeve trim alterned, and "Orioles" is added to the sleeve. On alternate, "Baltimore" added to the sleeve. 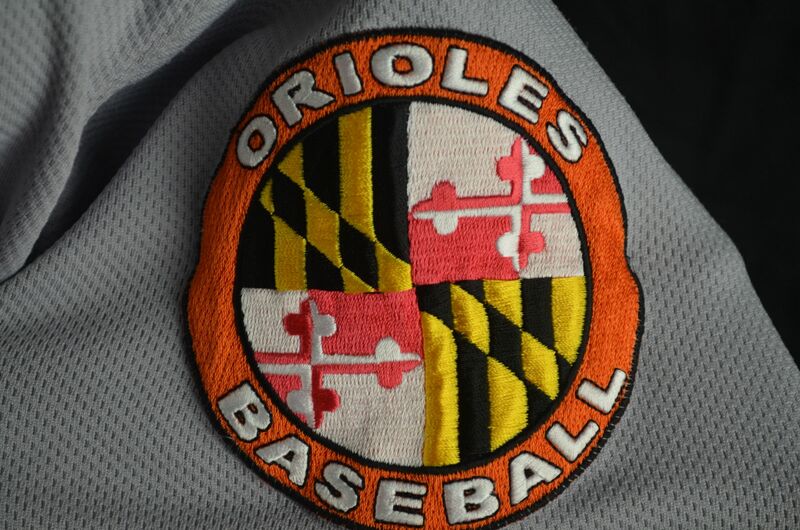 On all jerseys, a Maryland flag style sleeve patch is added. 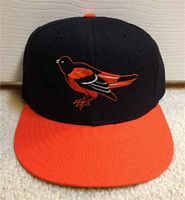 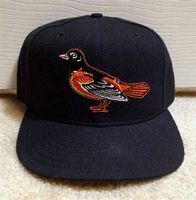 The bird is redesigned again and orange visor caps are worn home and road. 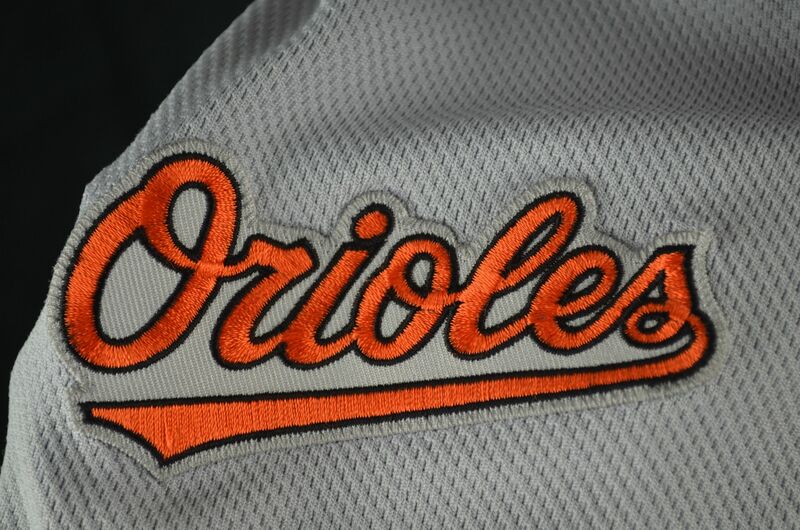 Home script modified slightly - the dot over the "i" on "Orioles" is raised a bit. 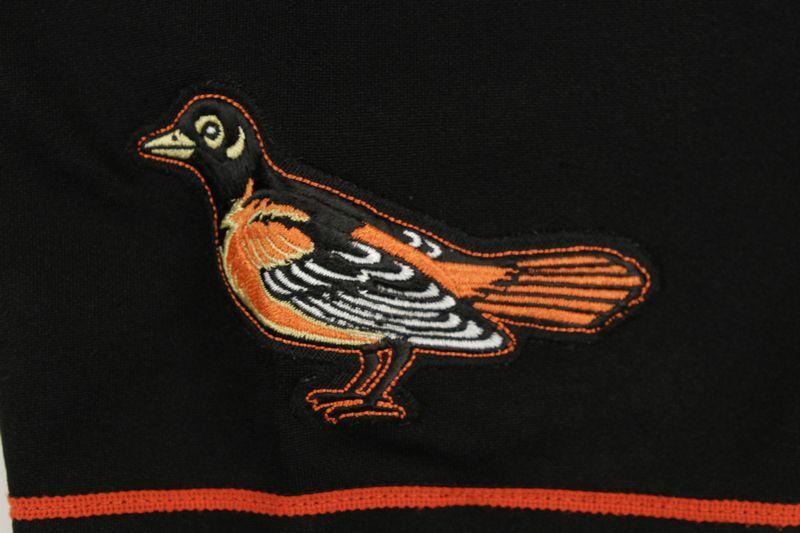 In a hugely popular move, the Cartoon Bird - slightly updated - returns. 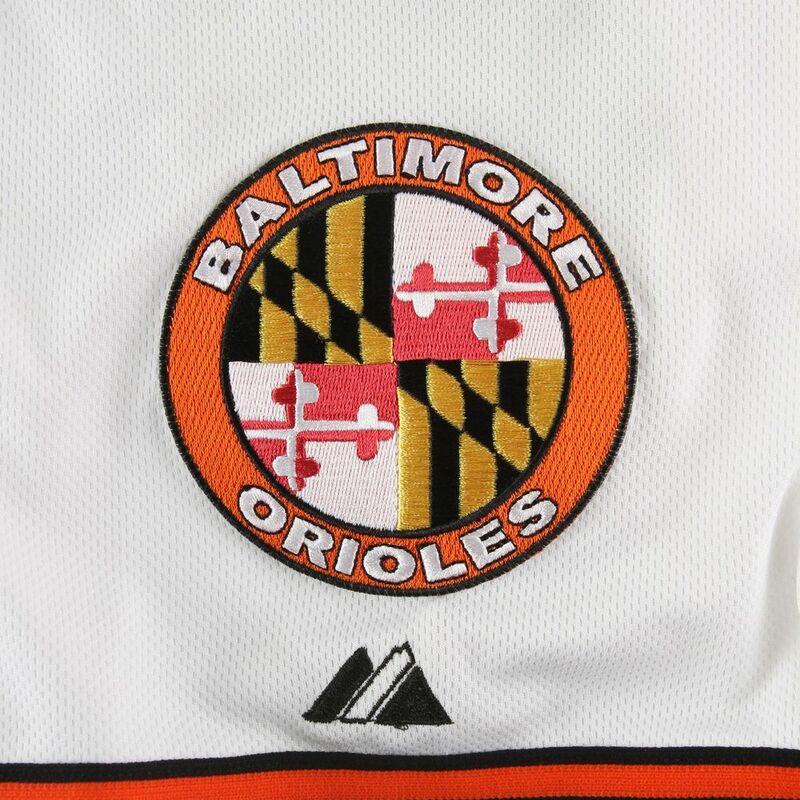 "Orioles" and "Baltimore" removed from jersey sleeves. 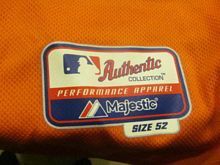 Orange home alternate added. 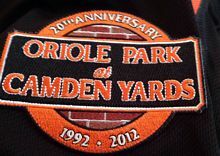 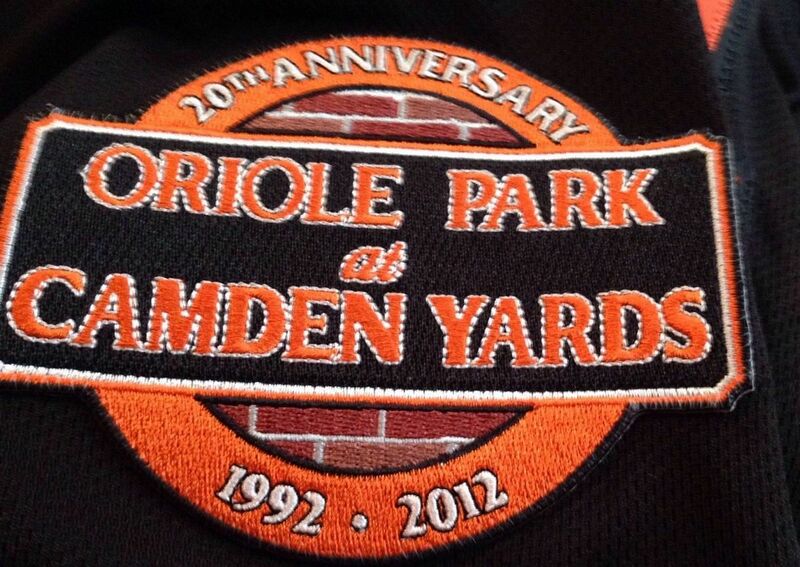 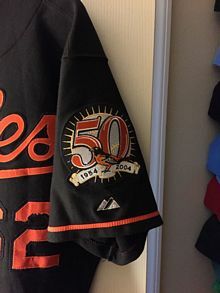 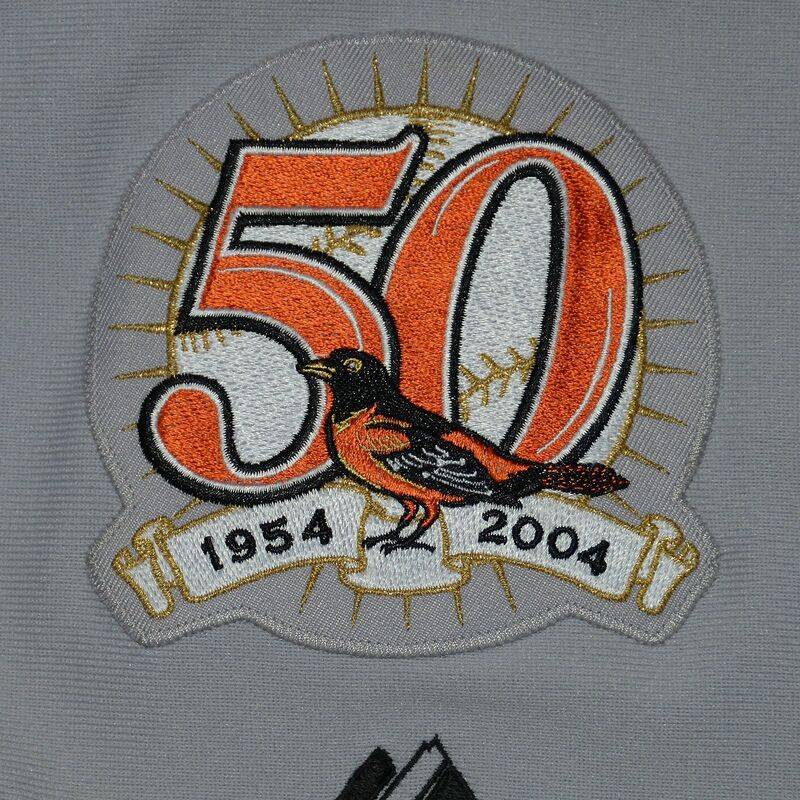 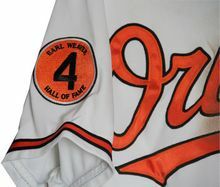 Camden Yards anniversary patch worn in 2012. 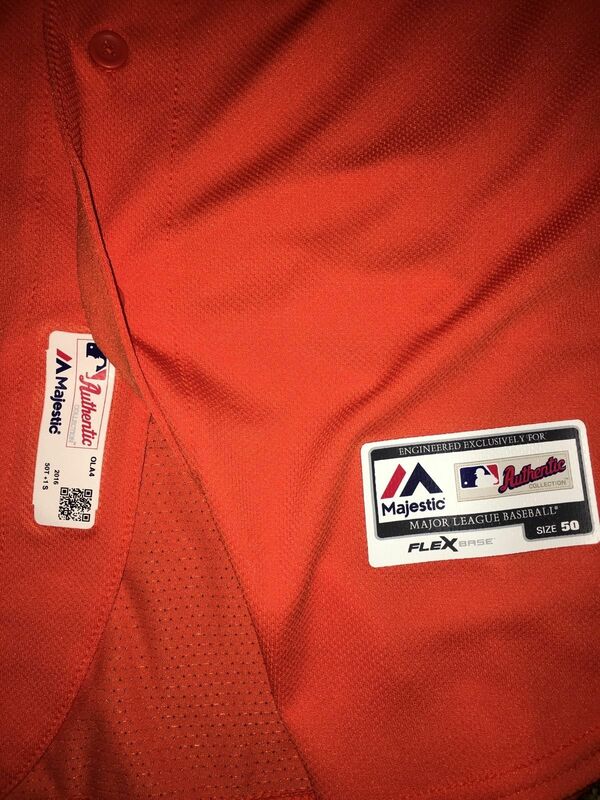 Beginning in 2014, orange jersey used both home and road. 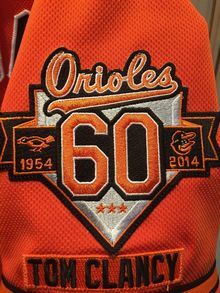 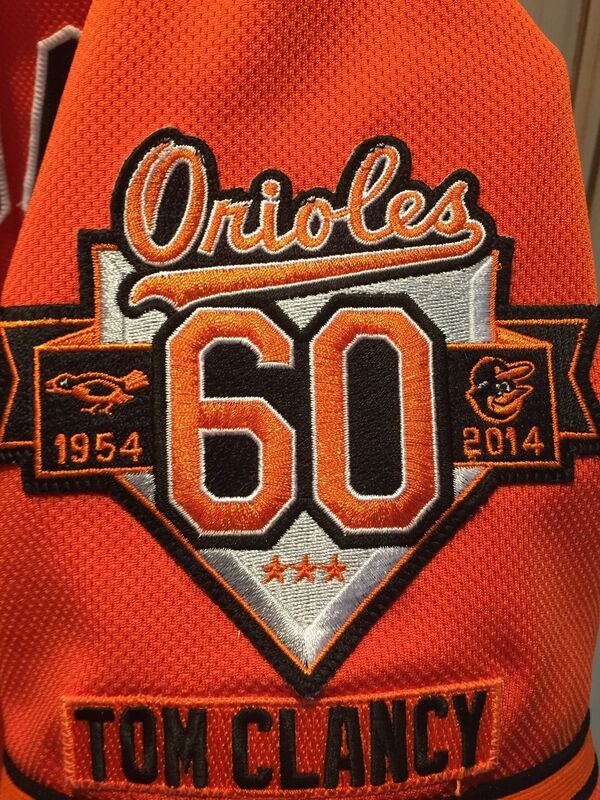 60th anniversary patch worn in 2014. Flex Base uniform system introduced. 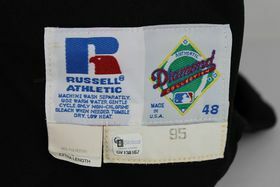 Worn with the BP cap a couple times.